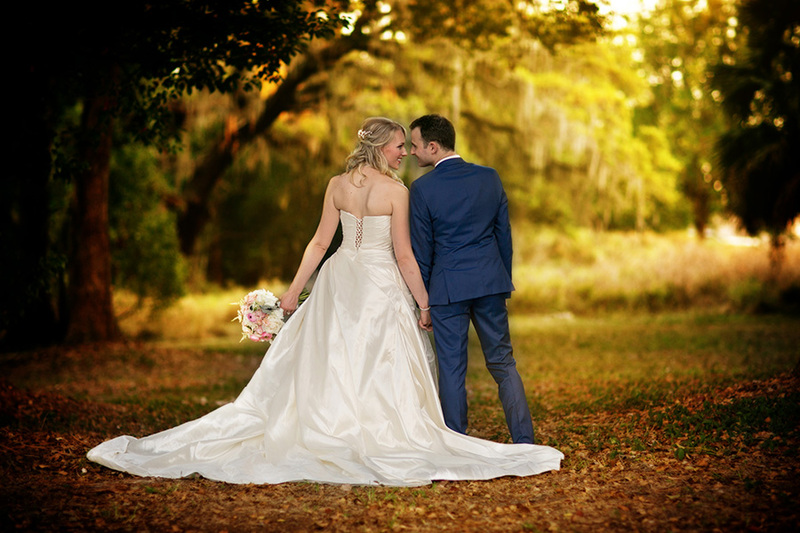 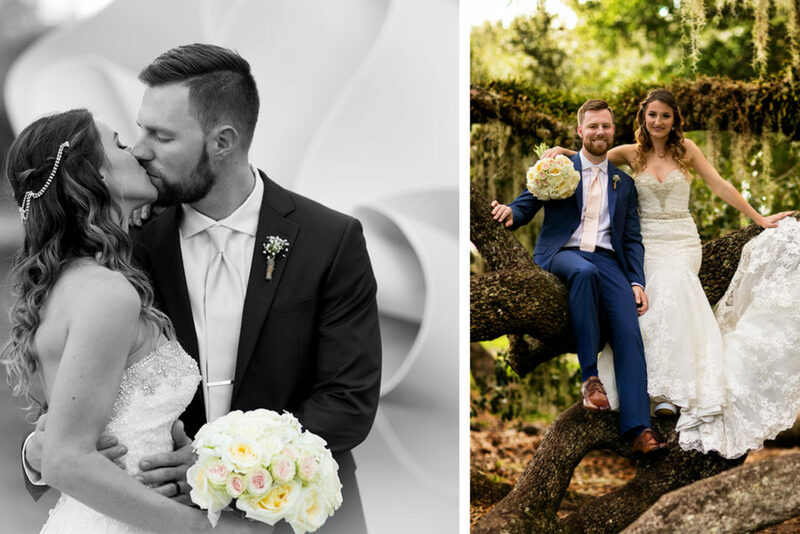 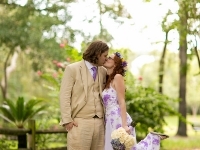 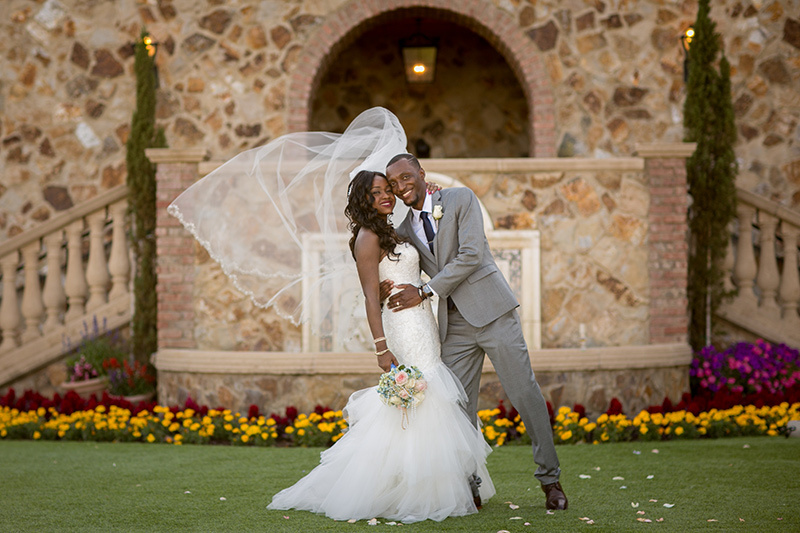 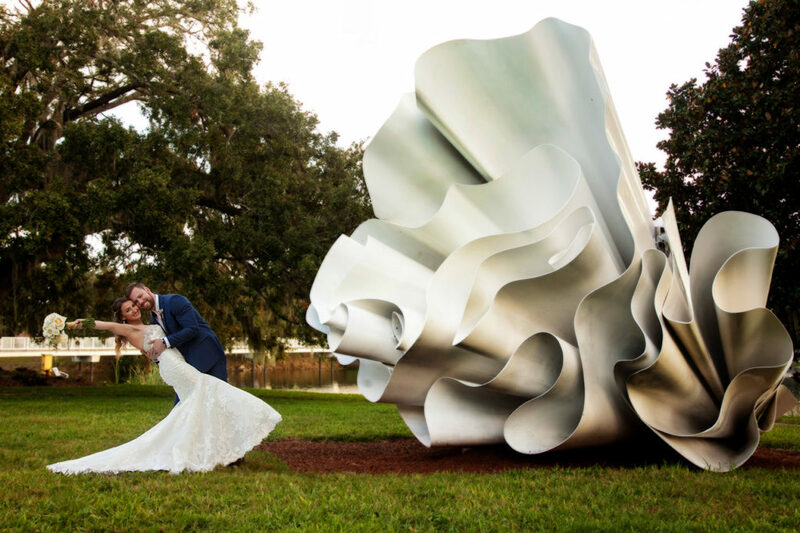 Esther and Kenso fell in love with , and chose , the stunning Tuscany themed backdrop of Central Florida’s Bella Collina Wedding Venue for their Central Florida April wedding and what a wedding it was! 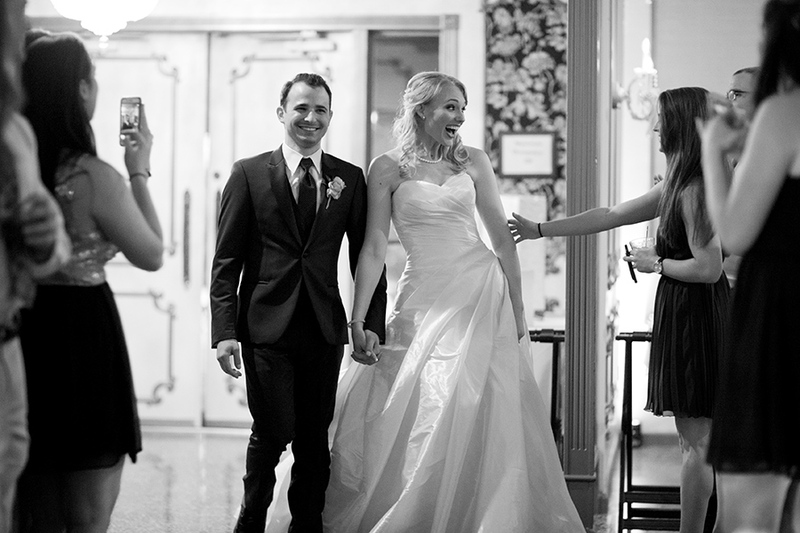 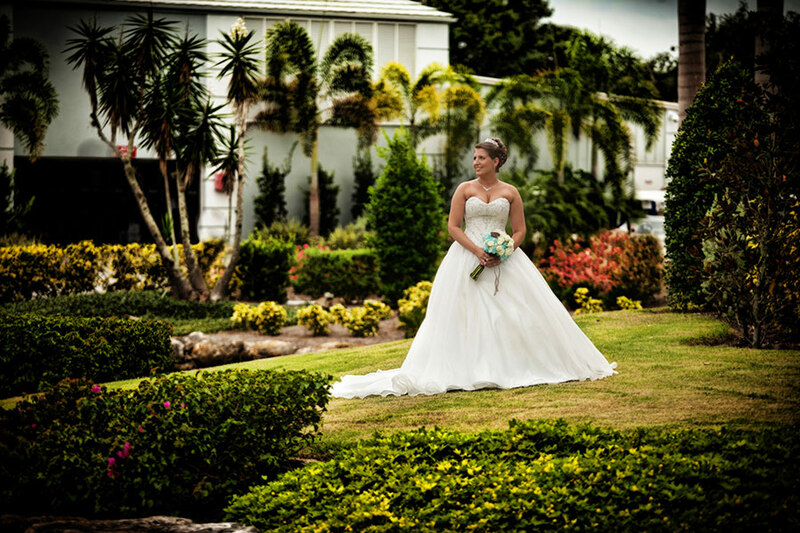 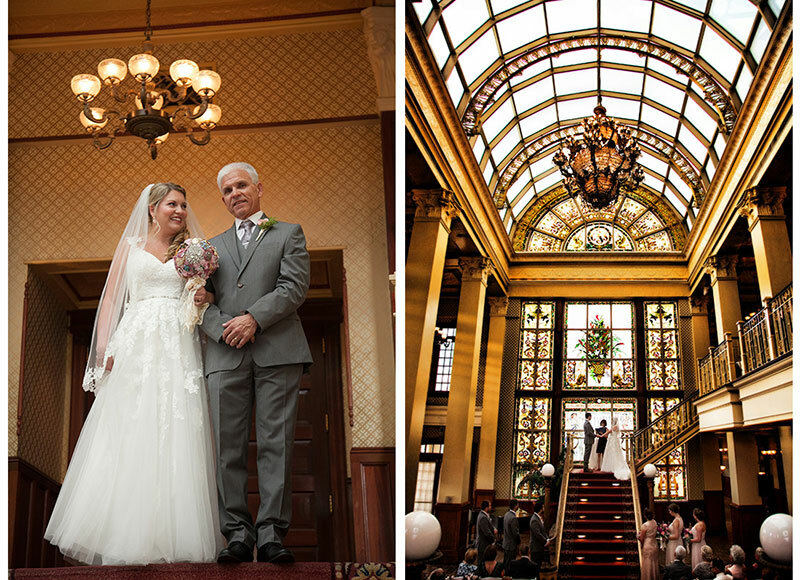 How can you possibly go wrong with a gorgeous bride, a handsome groom, and a beautiful venue?? 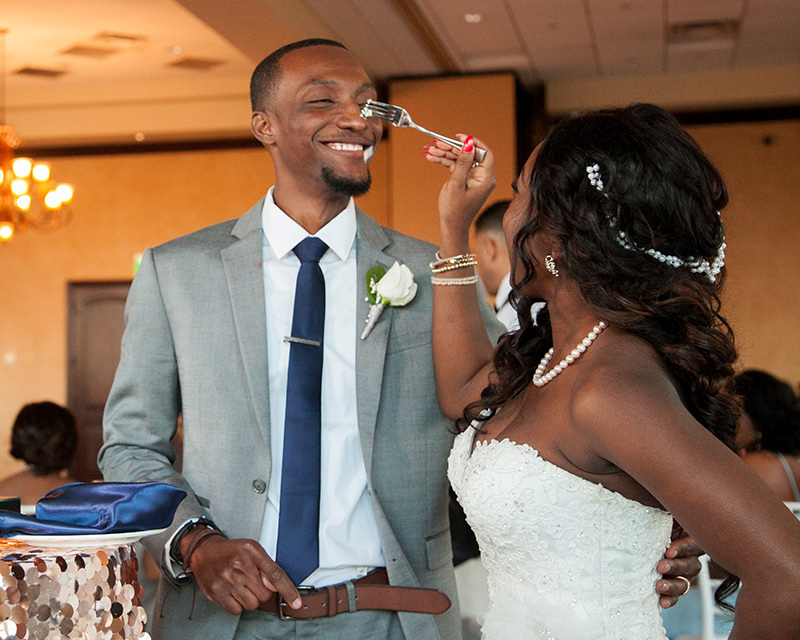 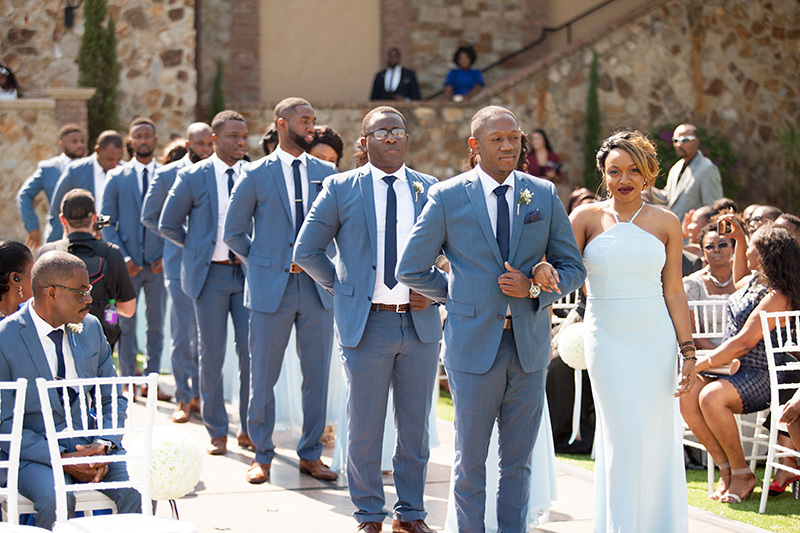 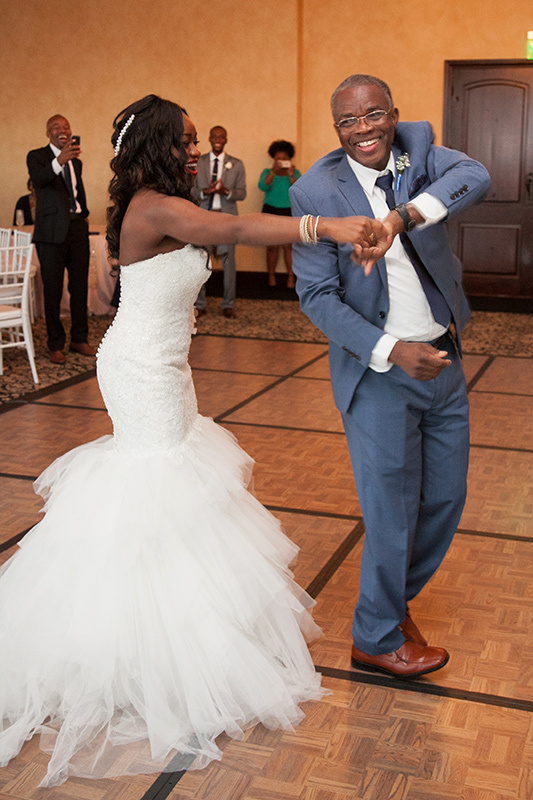 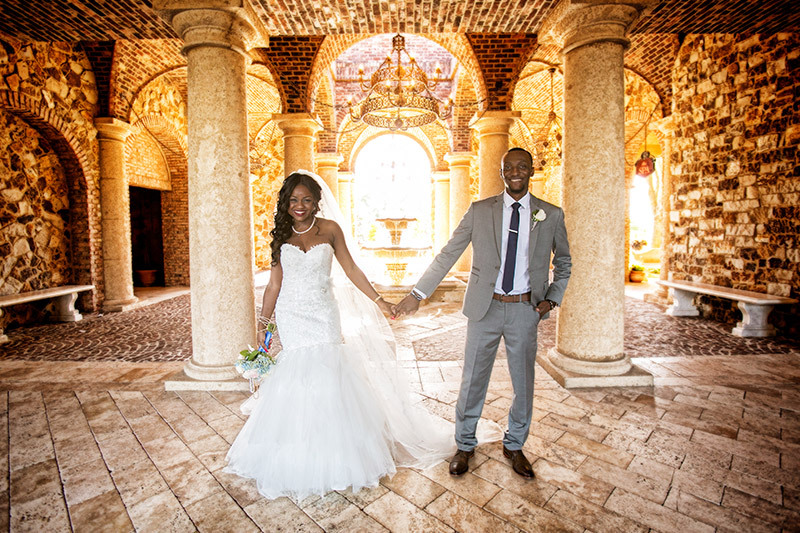 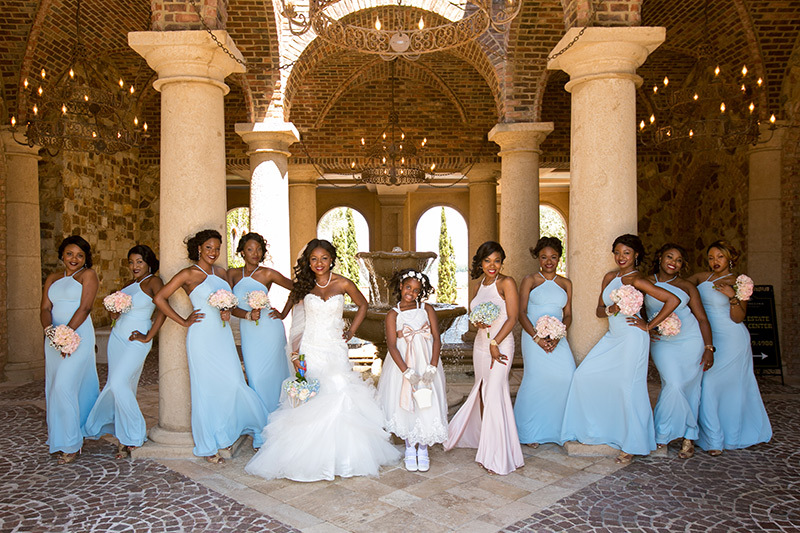 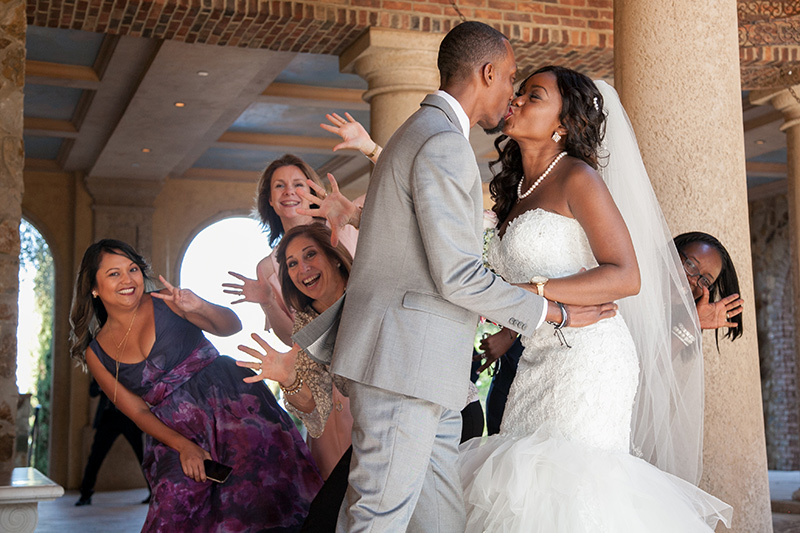 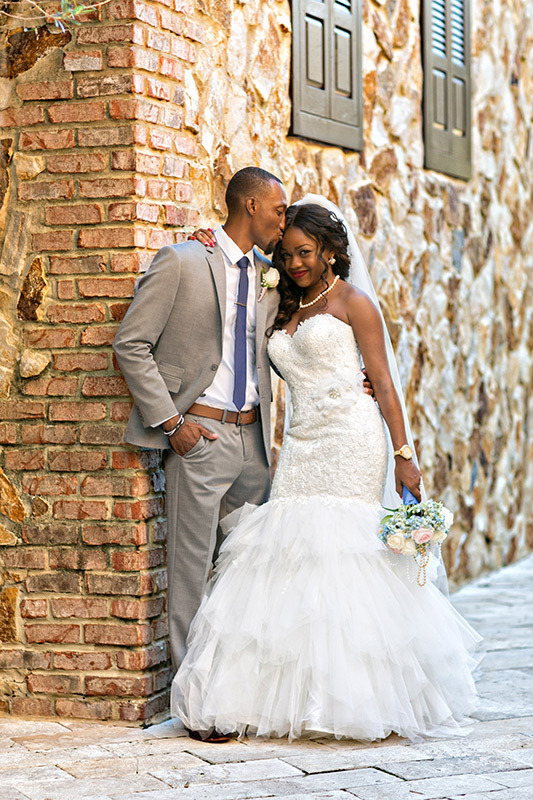 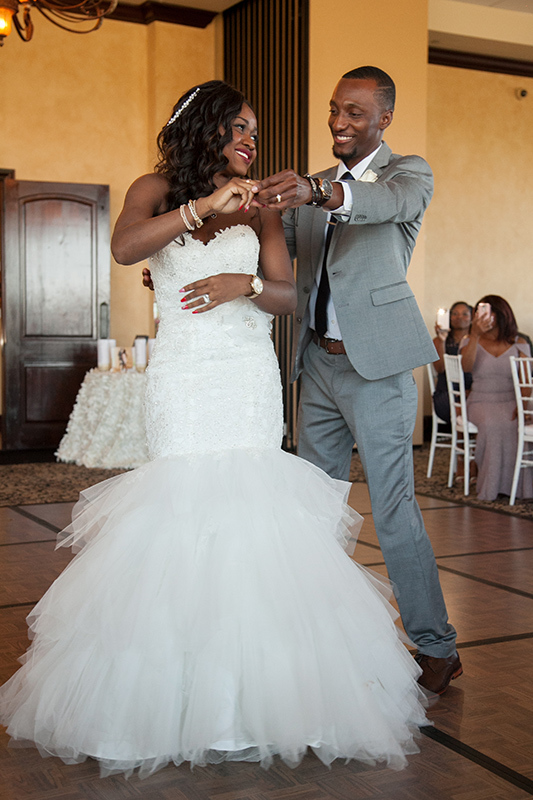 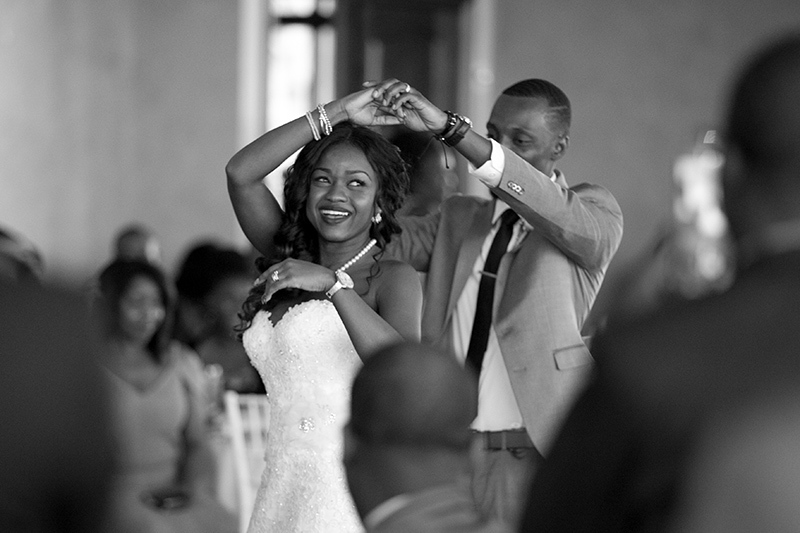 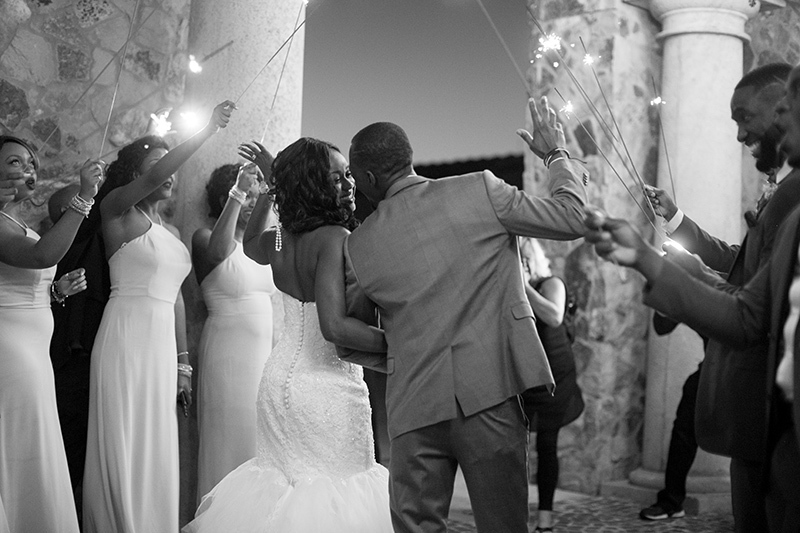 This beautiful Haitian couple chose a classic contemporary and elegant theme for their Central Florida wedding. 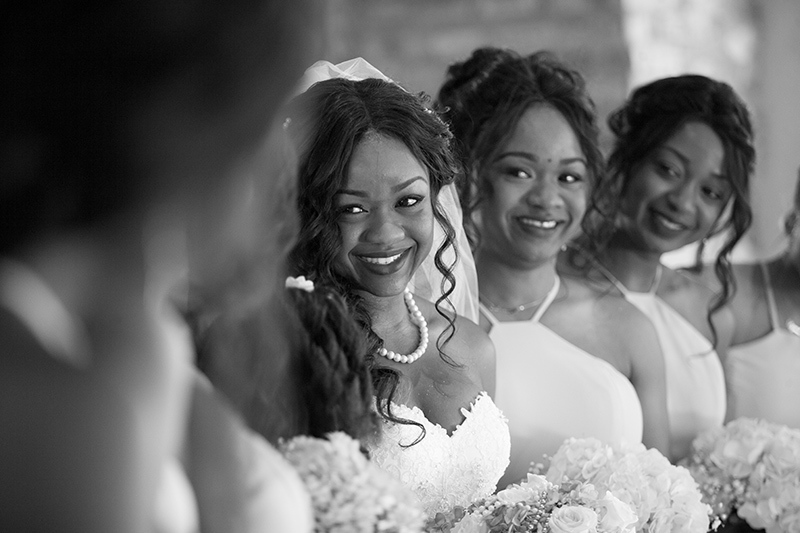 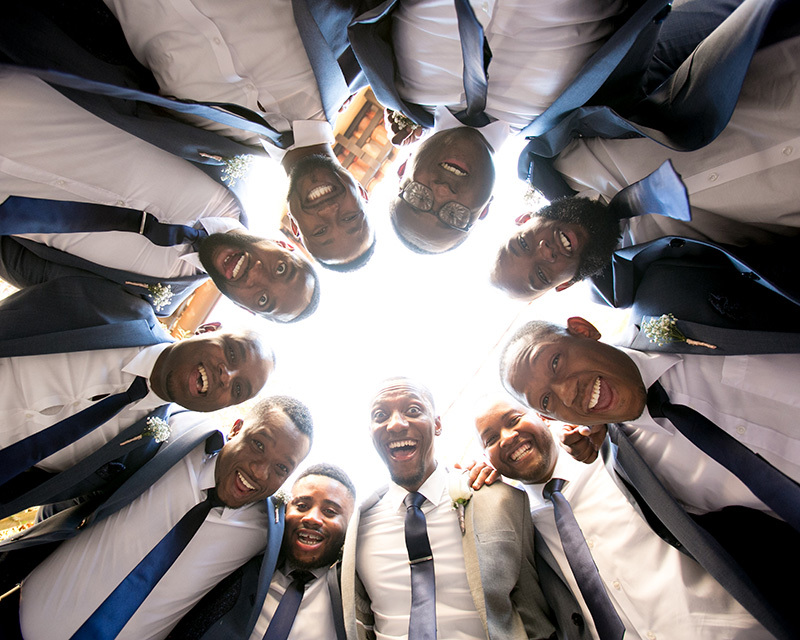 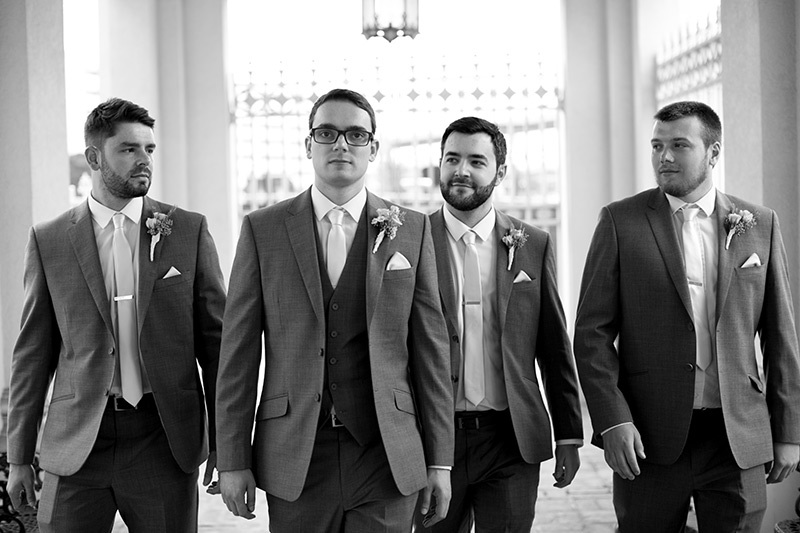 We have such a history with Esther’s family ( We have already photographed 3 of her siblings weddings with 2 to go!) 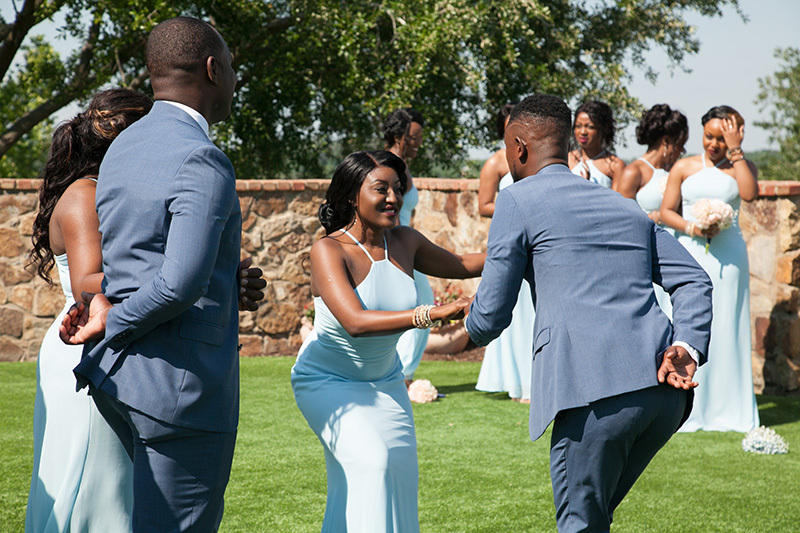 that Stan and I were really excited as well as nervous about capturing Esther and Kenso’s Bella Collina Wedding just perfectly. 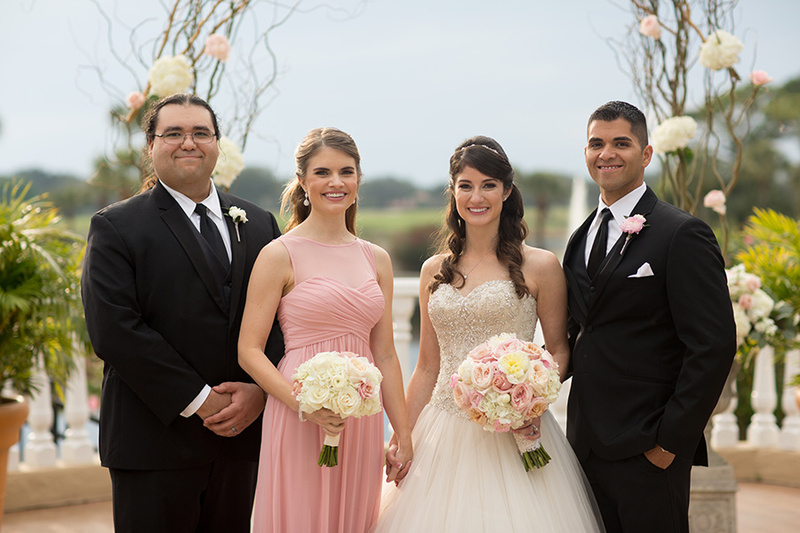 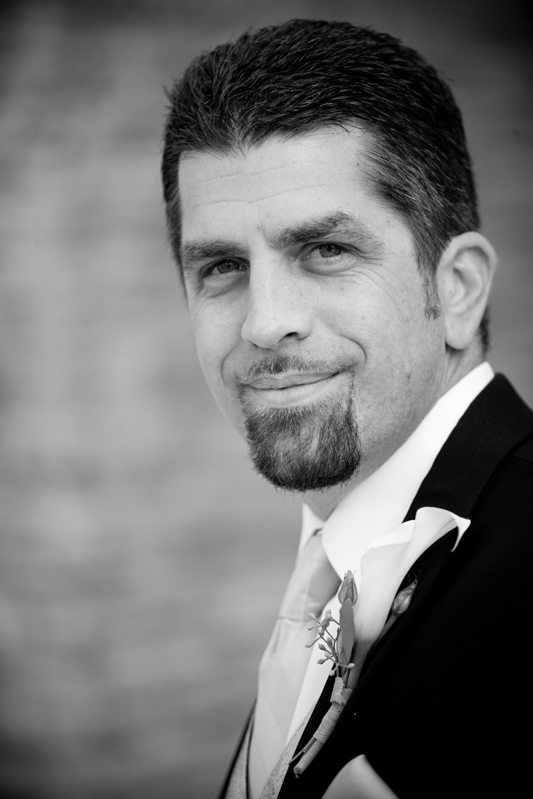 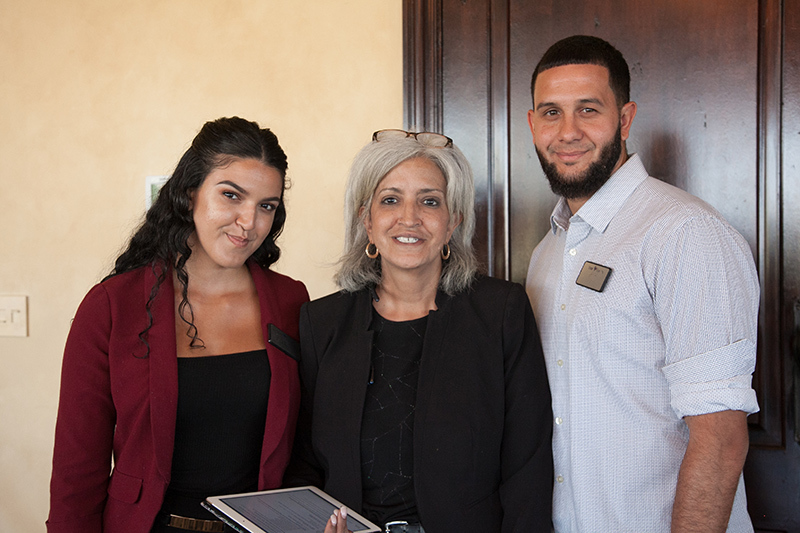 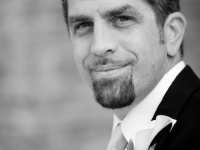 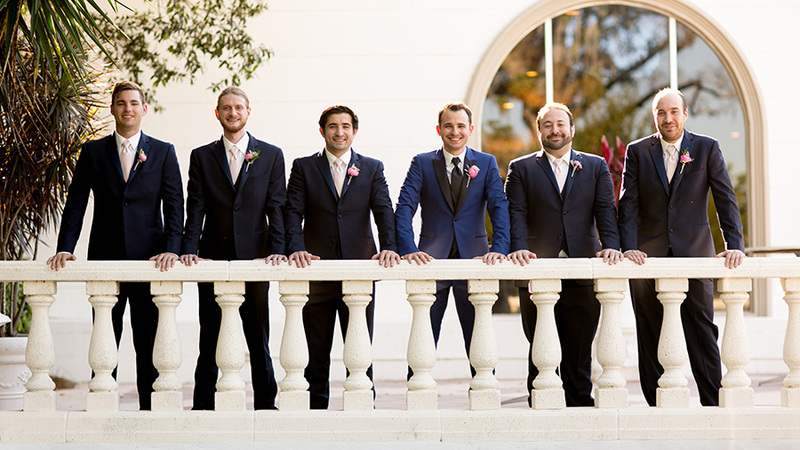 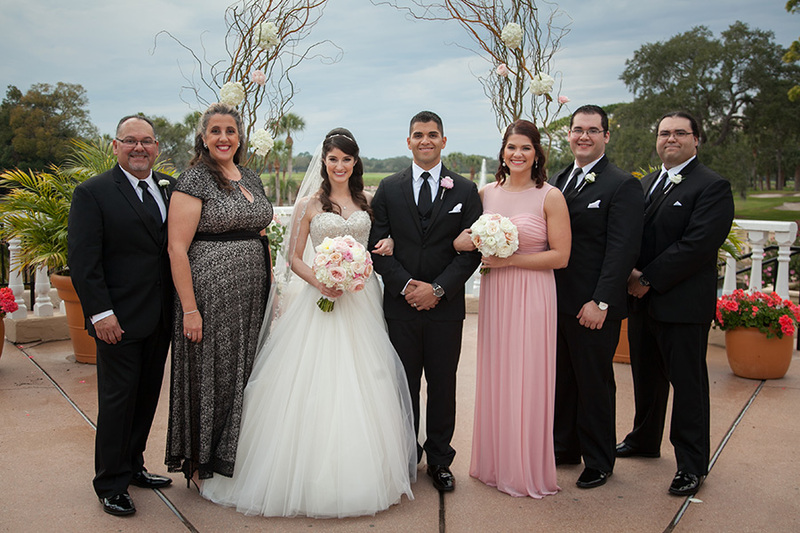 Everything went smoothly with the talented team of Lynn Stuckas of Your Events by L & L who was in charge of coordinating Esther and Kenso’s stunning Central Florida Bella Collina wedding. 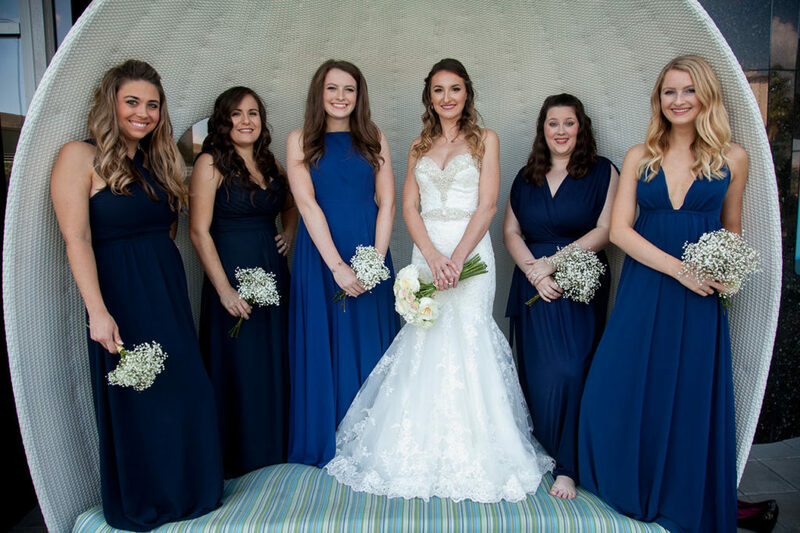 Esther’s flowers were just beautifully done by Weddings by Carly Anes, and complimented her stunning mermaid dress from Demetrios Bridal. 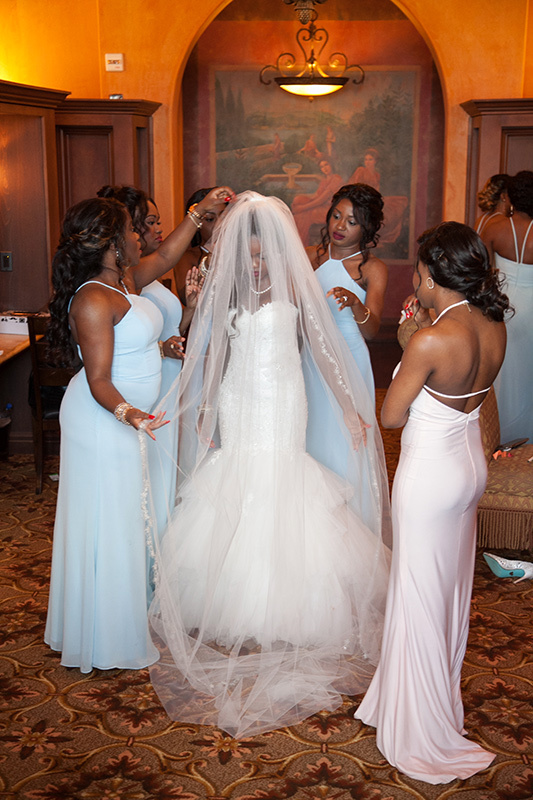 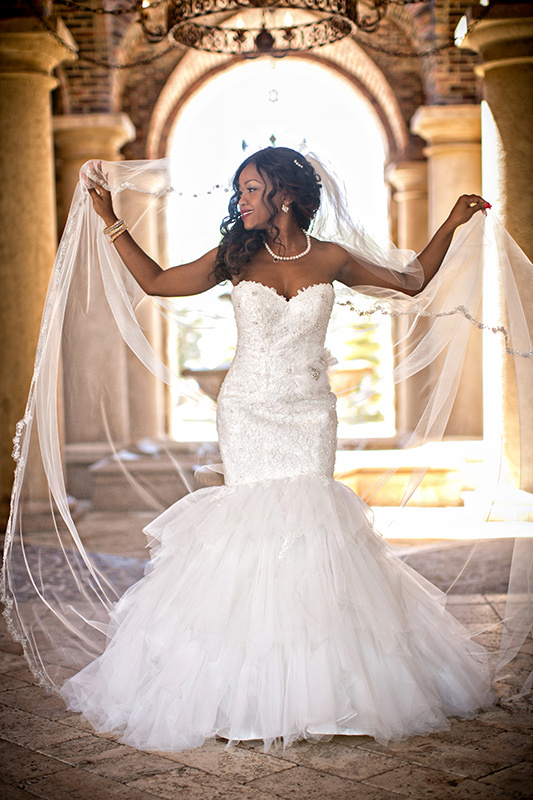 Her off white mermaid dress was heavily beaded, with lots of sparkle to compliment the dress, while the form fitting skirt enhanced and complimented Esther’s perfect curves. 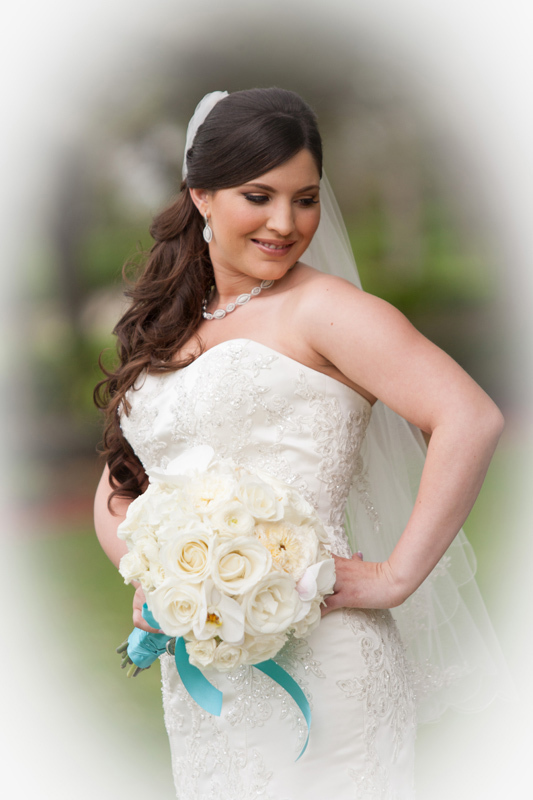 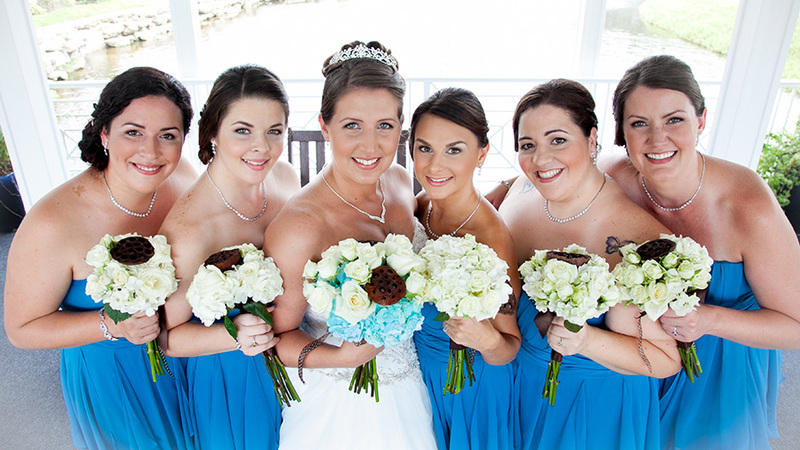 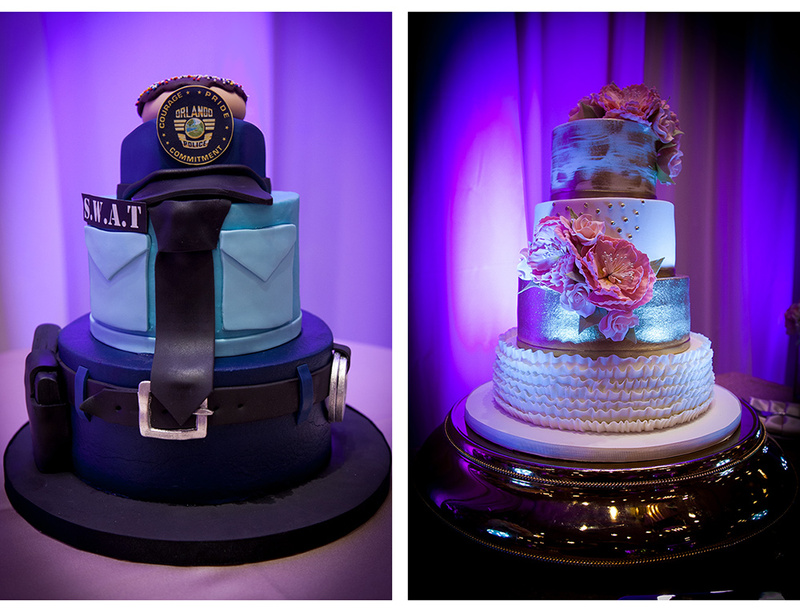 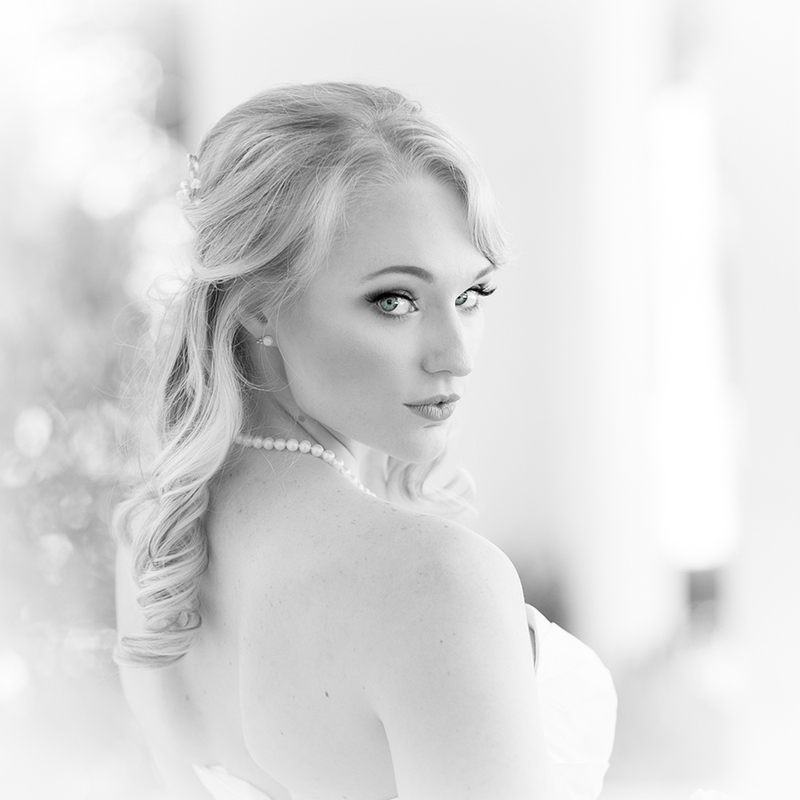 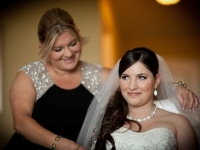 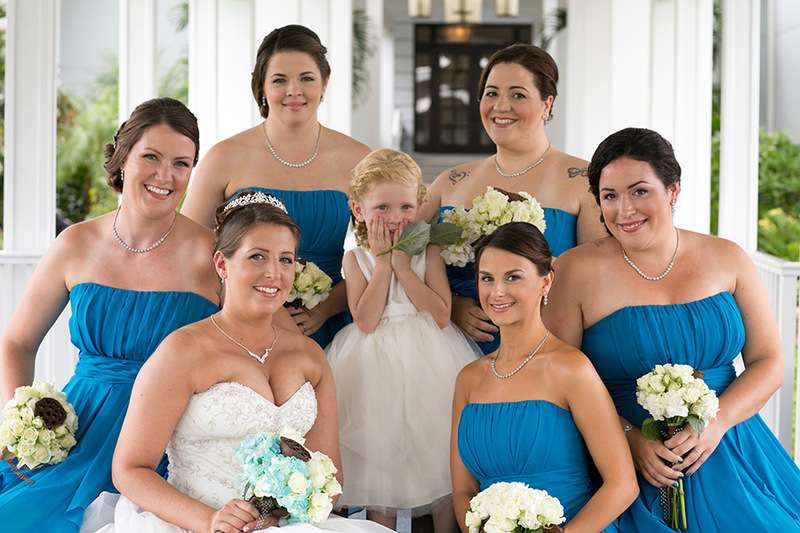 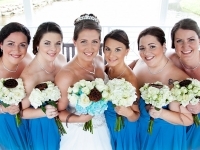 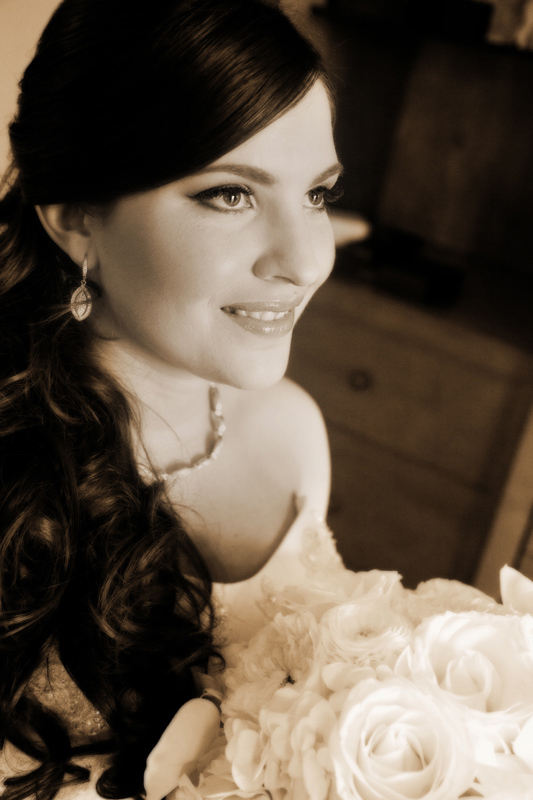 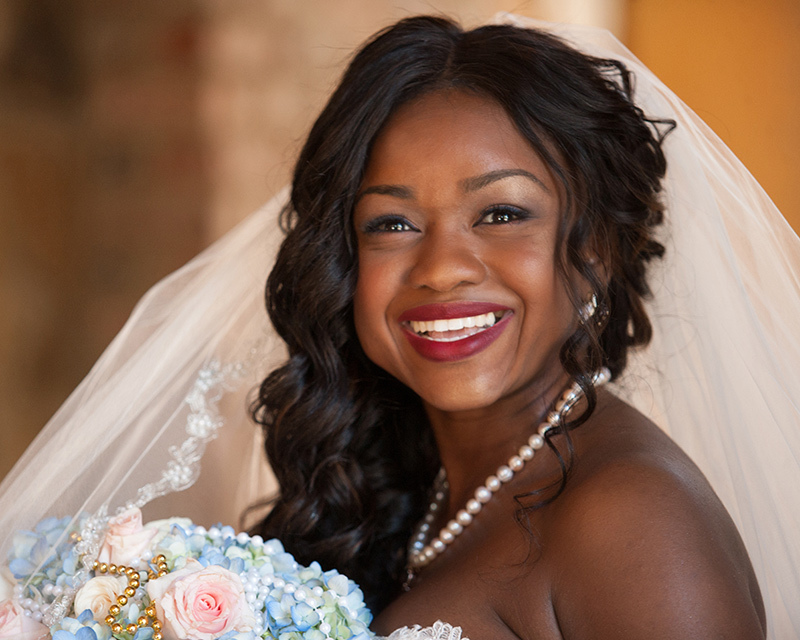 The finishing touches were hair and makeup and beautifully done by LeJeune Artistry . 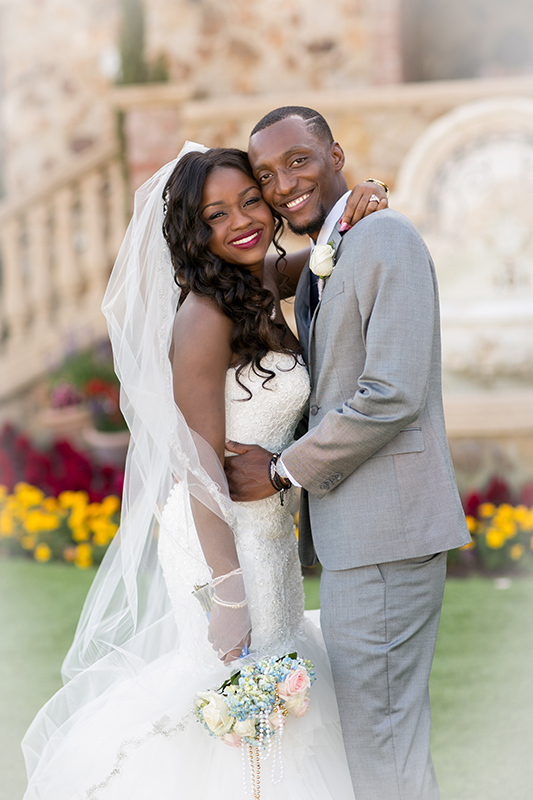 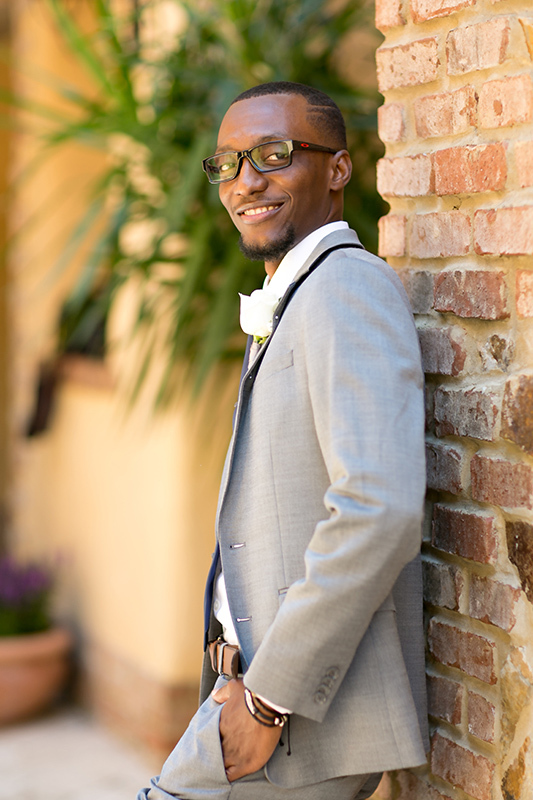 The reception ballroom at Bella Collina was beautifully decorated with linens by Eli of Linen Creations, and D.J Geordany Jean Baptiste made sure that the music was a crowd pleaser, playing a well rounded selection of music from soca to hip hop to R & B. 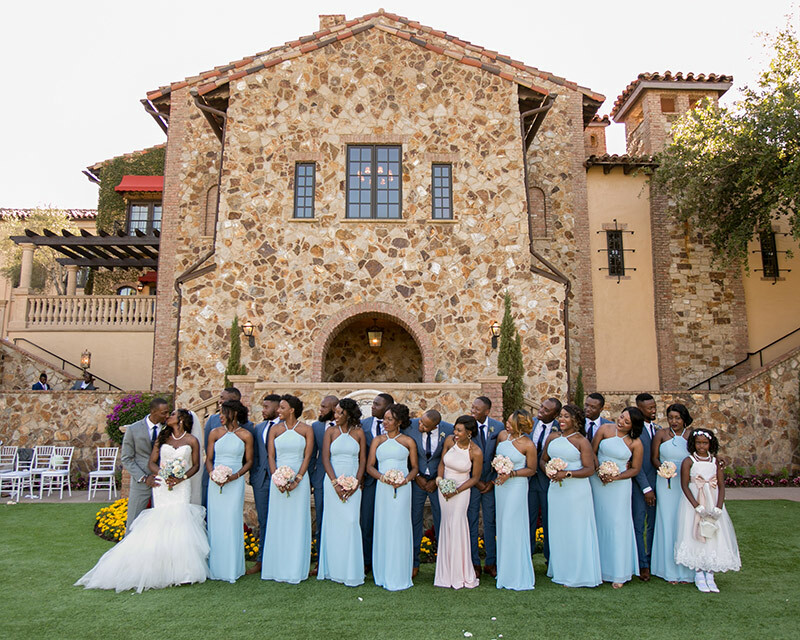 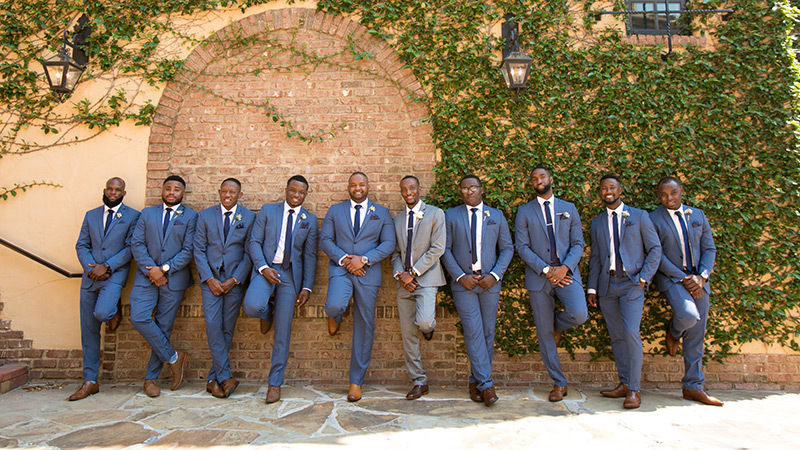 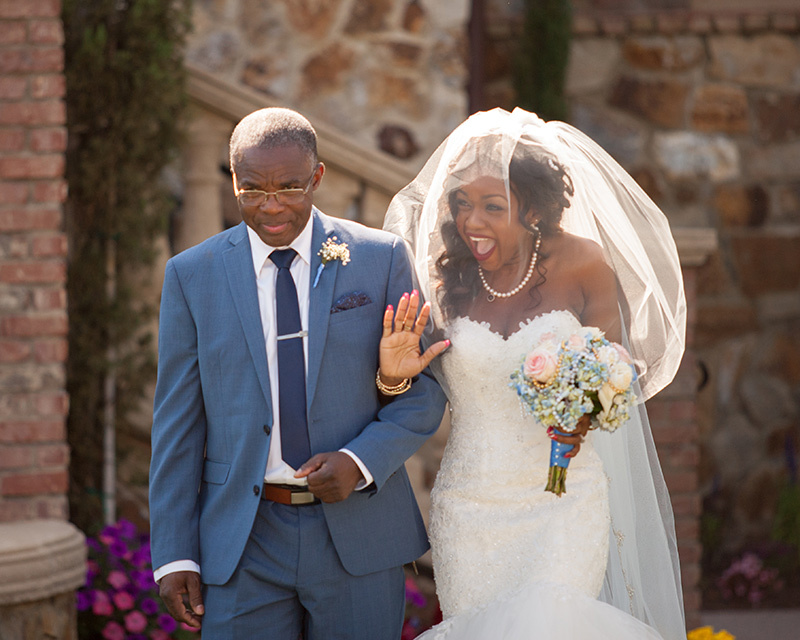 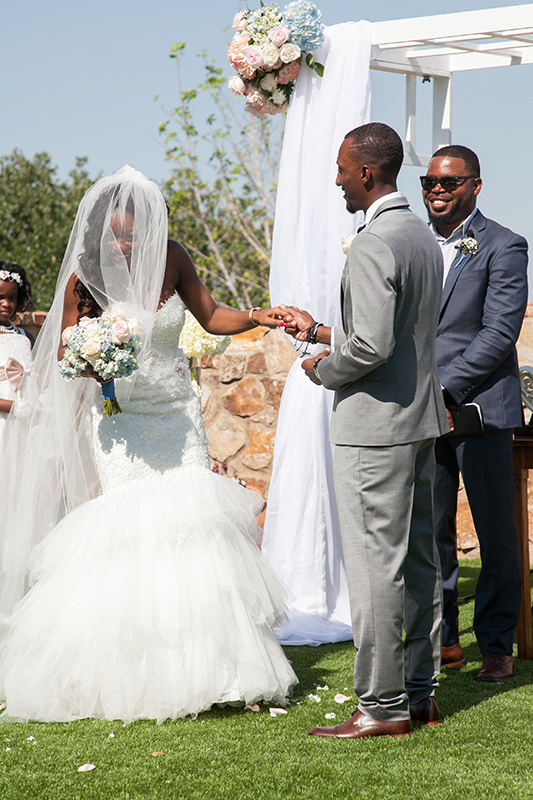 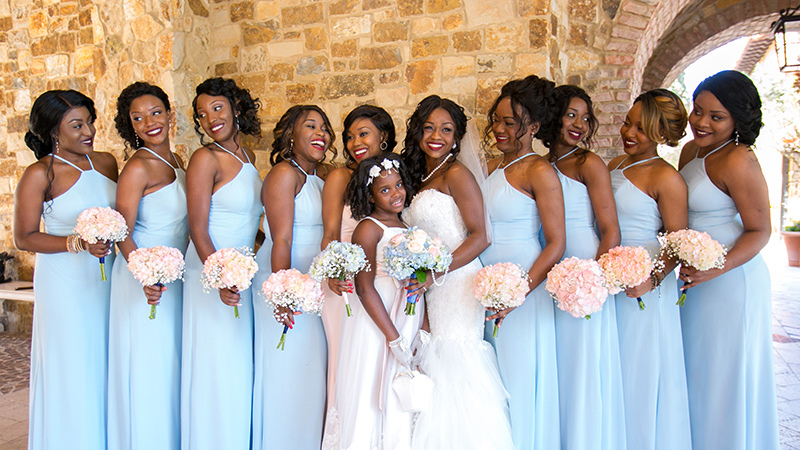 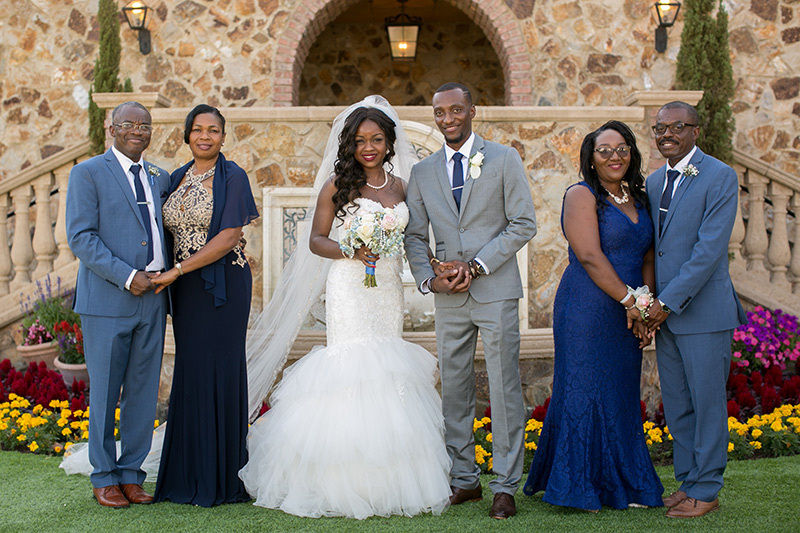 Of course we must include that Esther and Kenso’s stunning Bella Collina Wedding was captured by S & S Photography and their beautiful video captured by Kelvin Aultman . 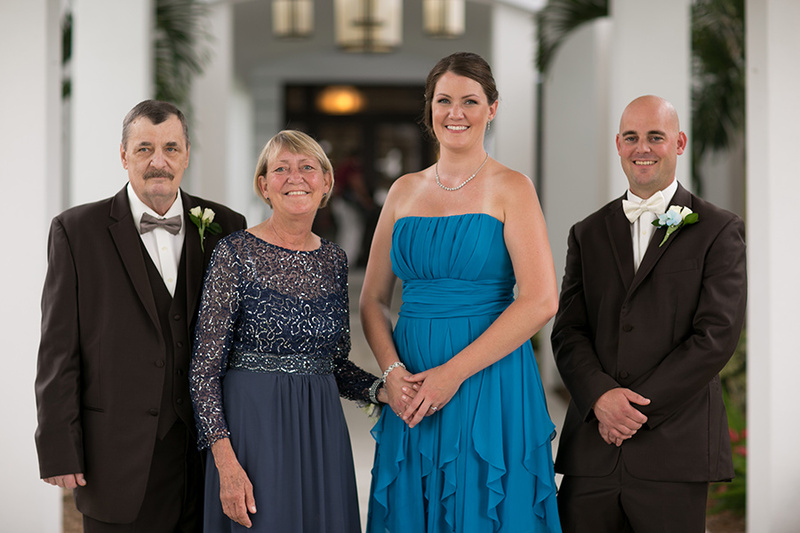 Brandy and Dave met working aboard the Disney Fantasy Cruise ship in 2013. 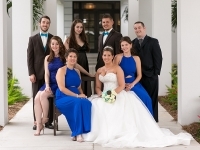 Brandy worked with the cruise staff team while Dave worked on the ship wide tech team. After nearly 4 years of sailing the seven seas with Mickey Mouse, the two lovebirds decided it was time to start a life together on land, in far away New Zealand. 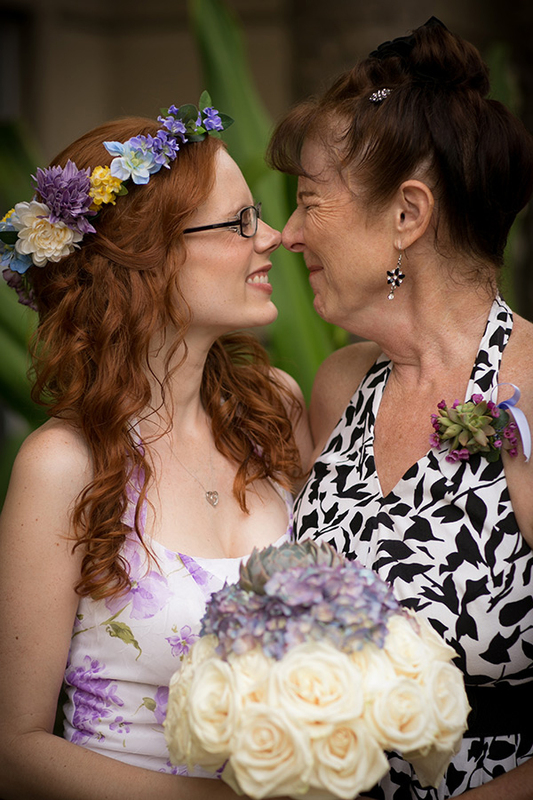 For Brandy’s 28th birthday Dave surprised her with a fantastic trip to the Bay of Islands and Cape Reinga, the northern most point of New Zealand. 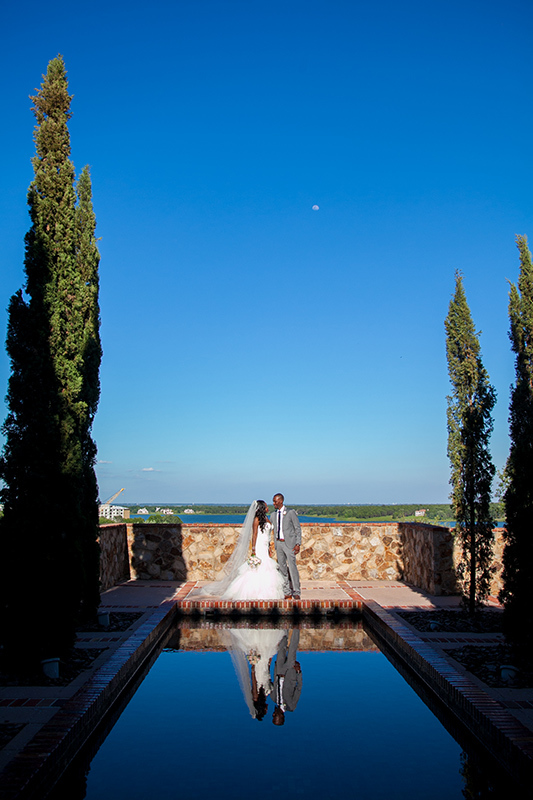 It was here, overlooking the ocean, on the last day of their trip, that Dave got down on one knee and popped the question. 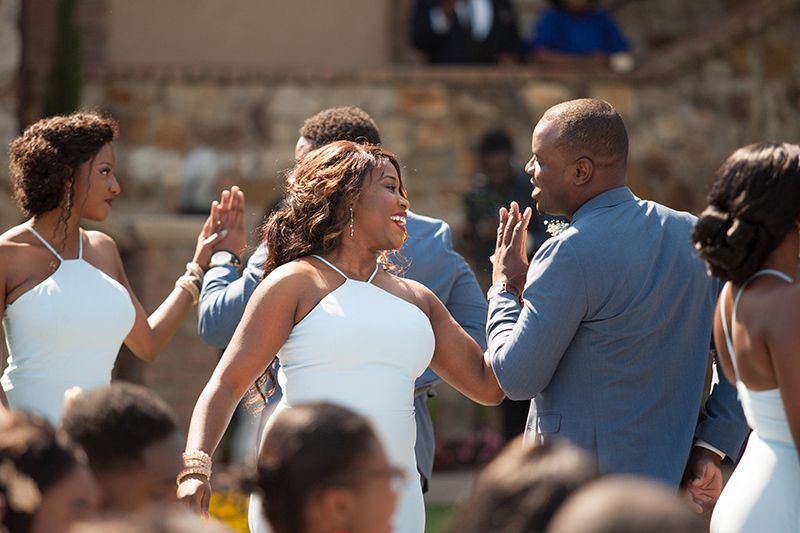 Brandy of course said “yes!” and the excitement of planning their September 22 nd wedding began. 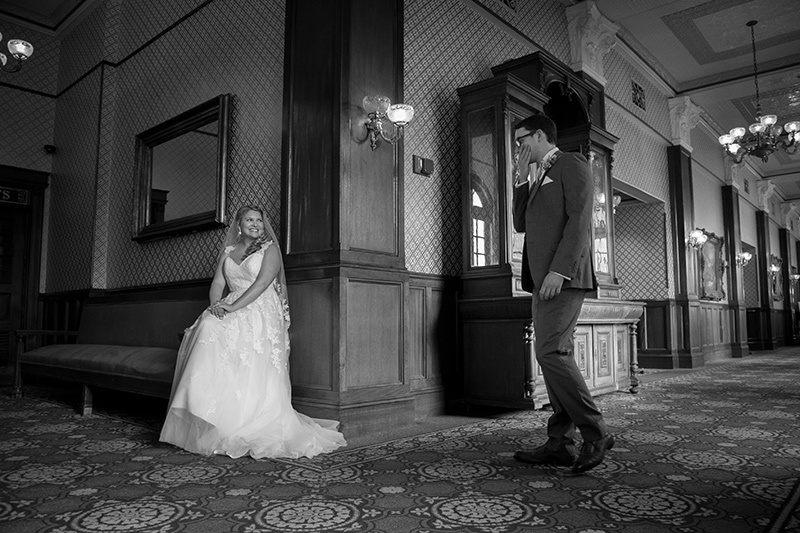 When planning their wedding Brandy and Dave wanted a theme that reflected their life together thus far. 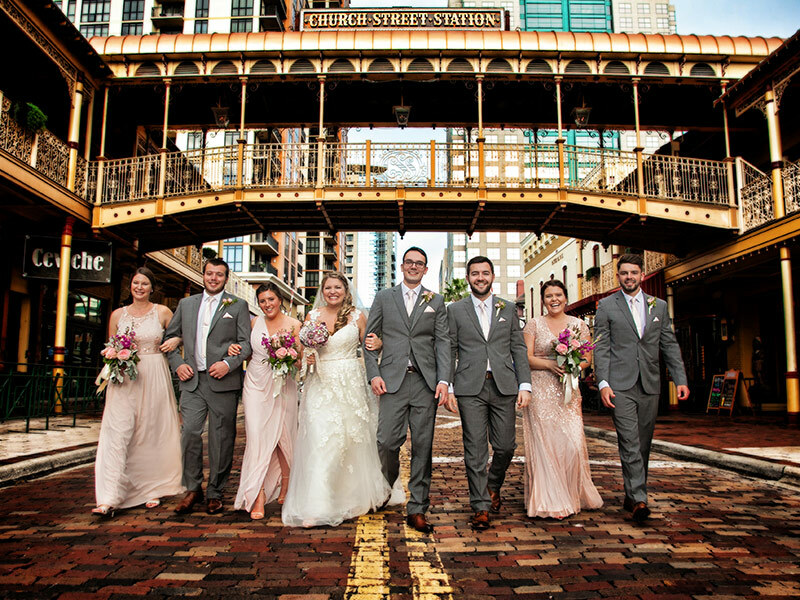 They loved traveling, and decided to go with a vintage travel theme to match the grandeur feeling of the Ballroom at Church Street Station in downtown Orlando. 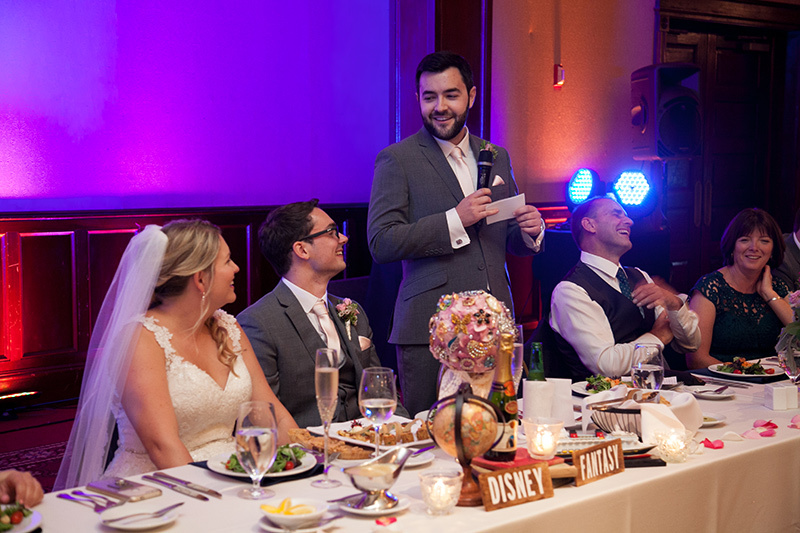 Each table was themed around a different city in the world that they had visited together and of course they had to incorporate , at the head table no less, the Disney Fantasy Ship where they met. 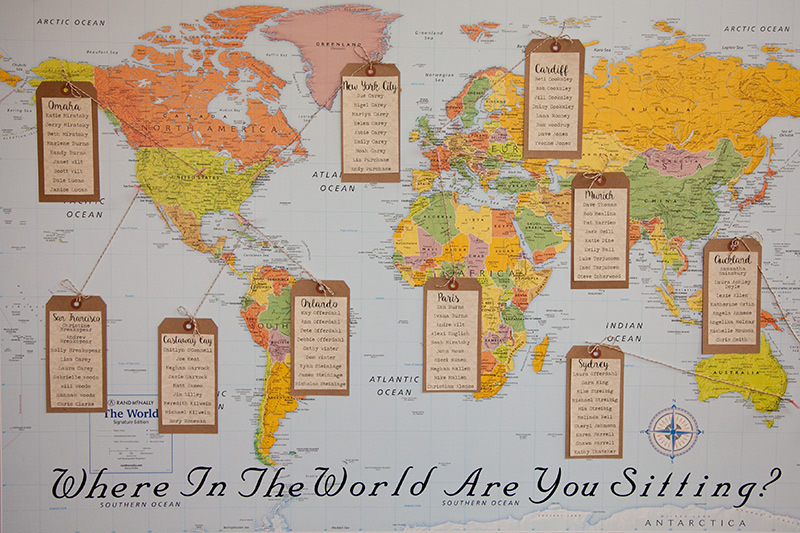 A ” Where in the world are you sitting? 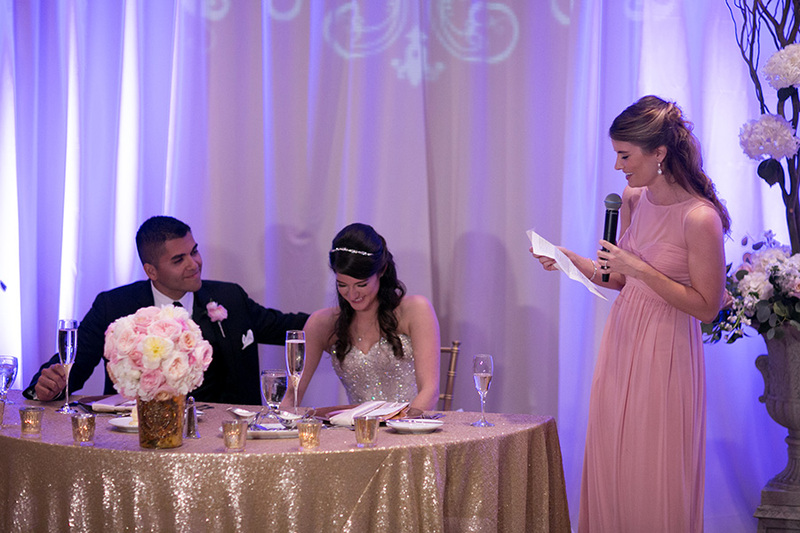 ” map directed guests to which city in the world they would be sitting and dining at. 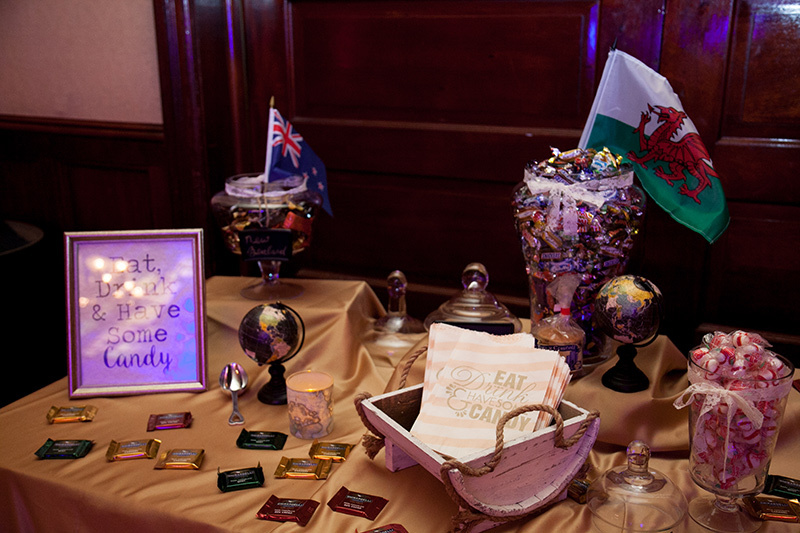 Party favors included a delicious candy station which included many different treats from the U.S , the U.K and New Zealand. 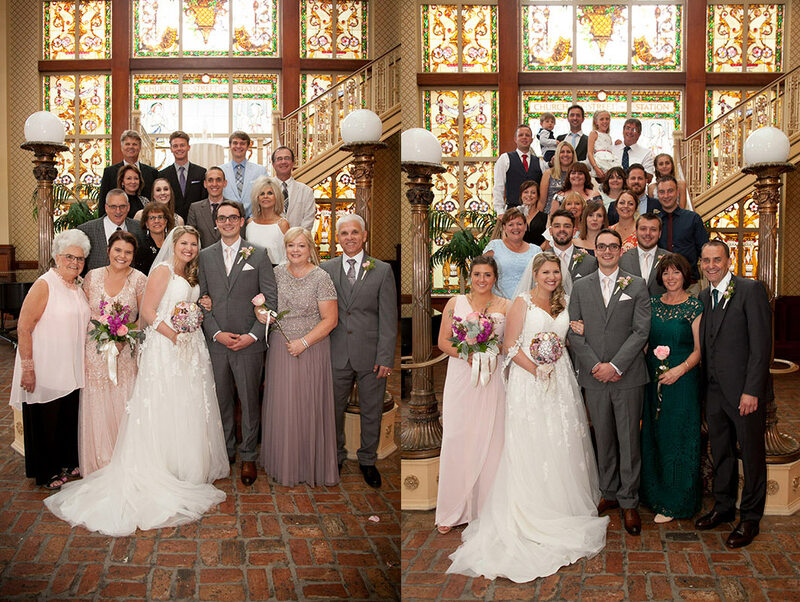 A nice personal touch were the added photographs of each of their grandparents, on their wedding days ,which added the perfect vintage touch to their Ballroom at Church Street Wedding. 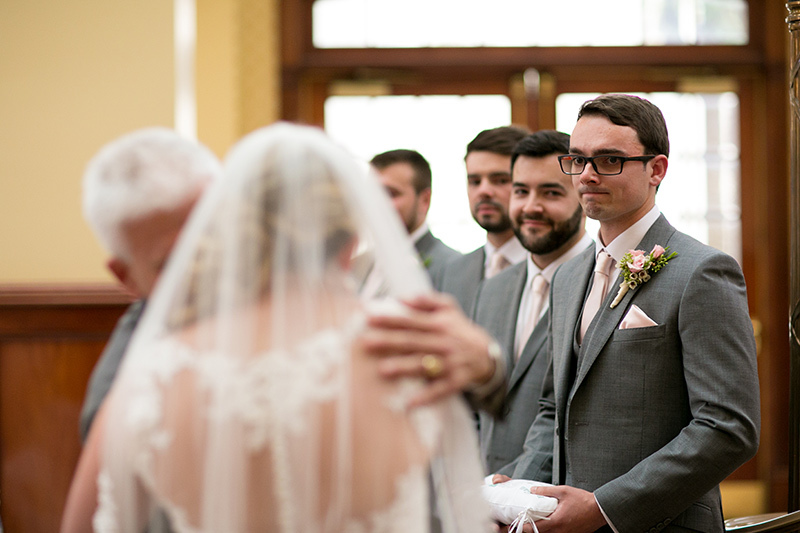 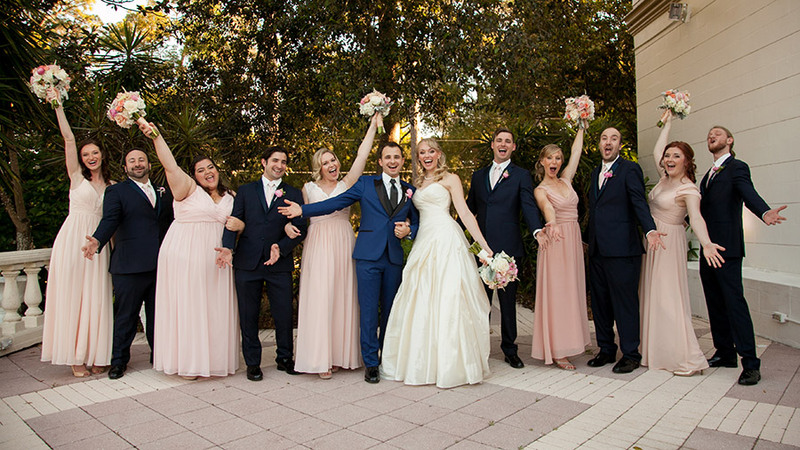 Since Brandy and Dave are from two different countries the most important thing they wanted to make sure happened on their wedding day was getting their friends and families together, allowing everyone to get to know each other. 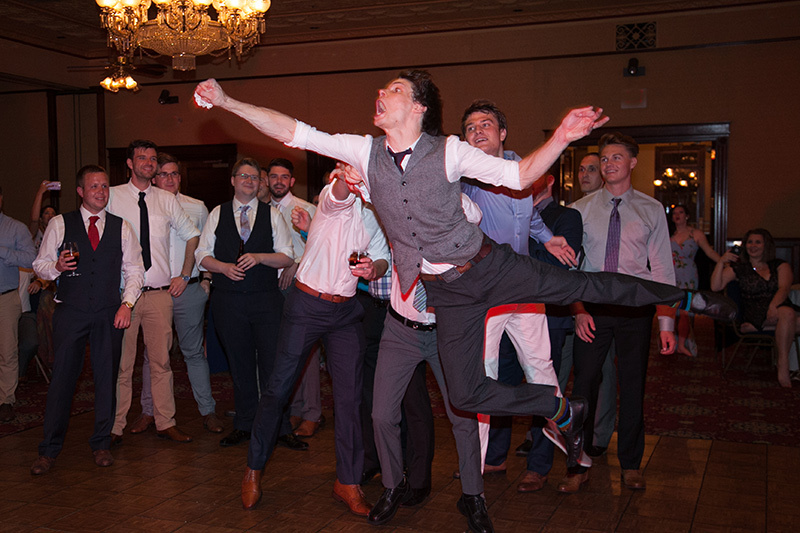 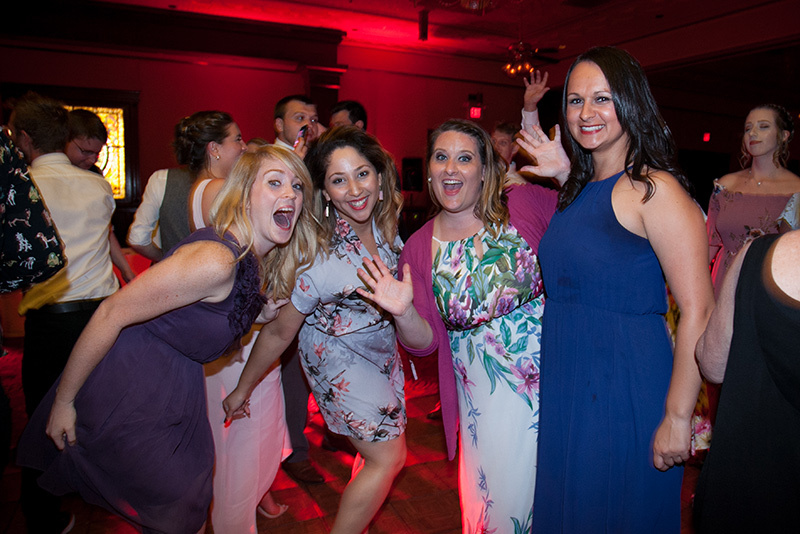 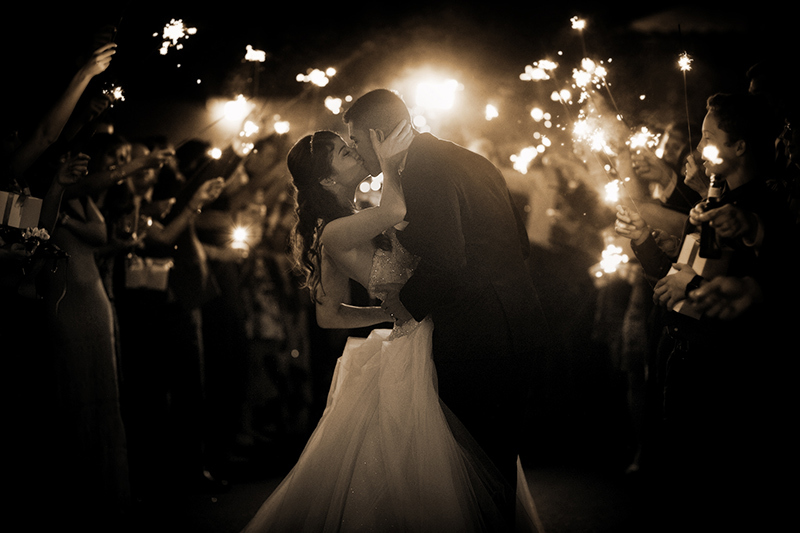 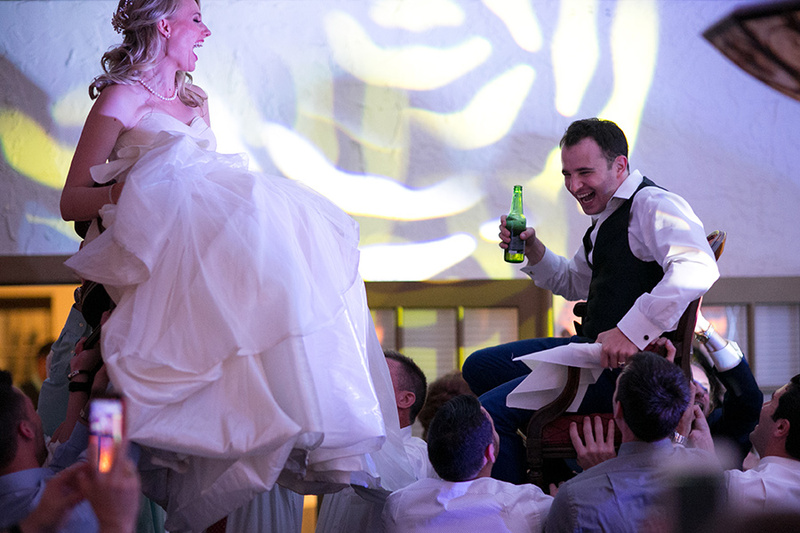 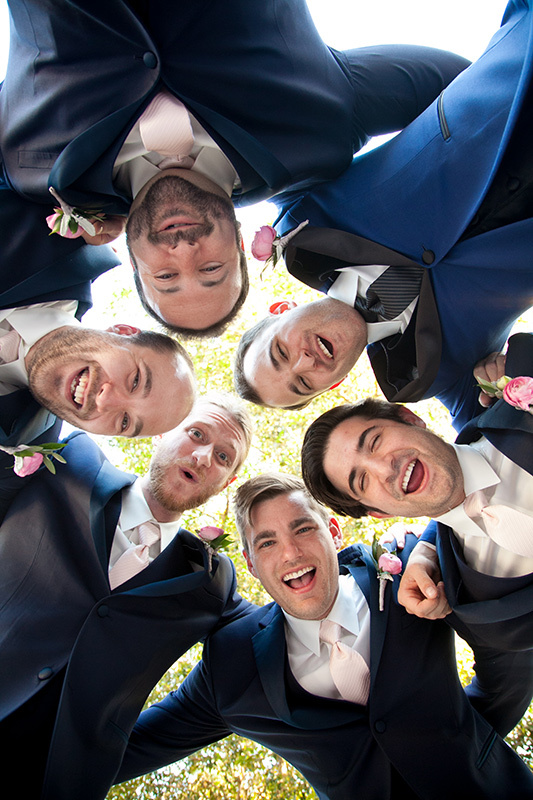 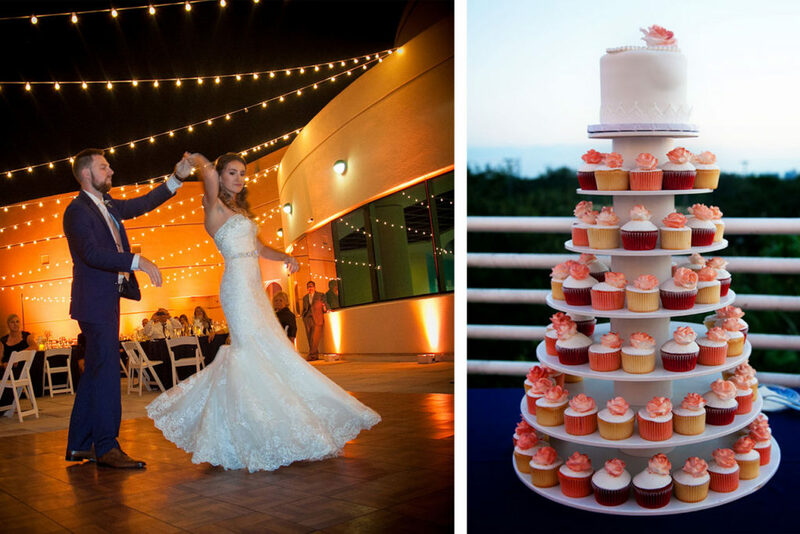 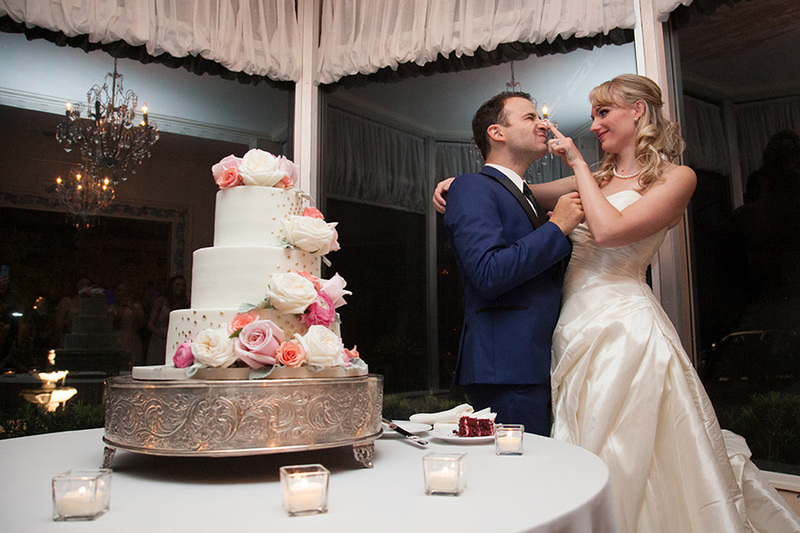 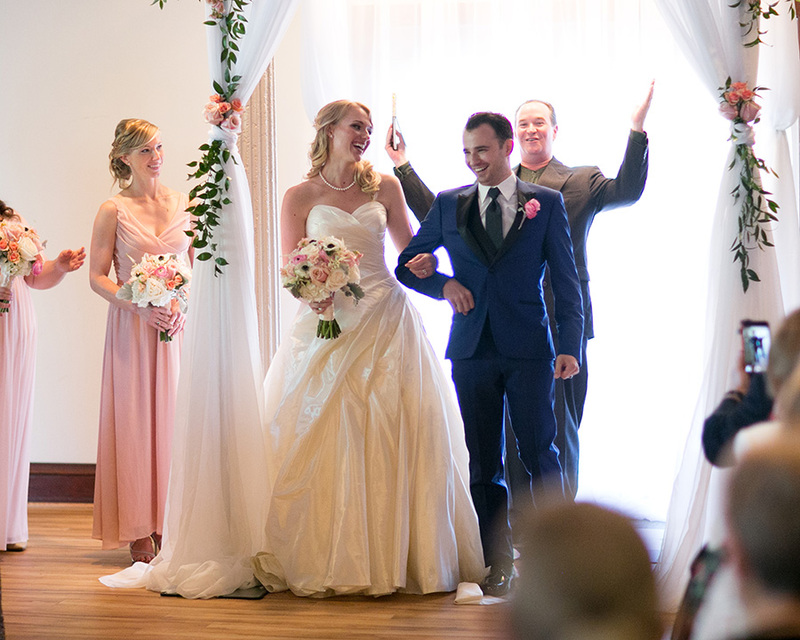 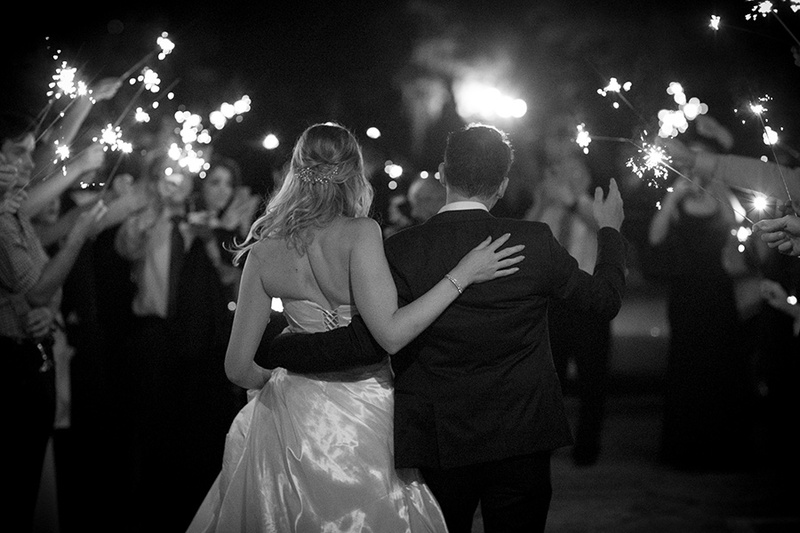 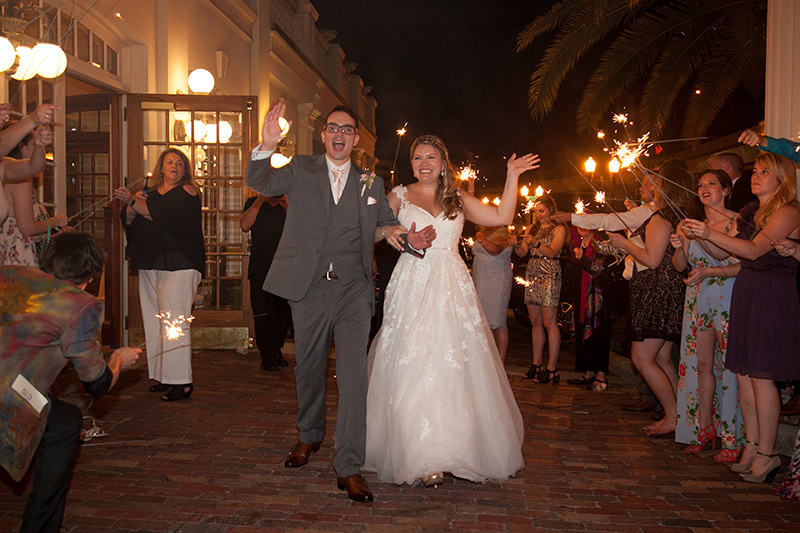 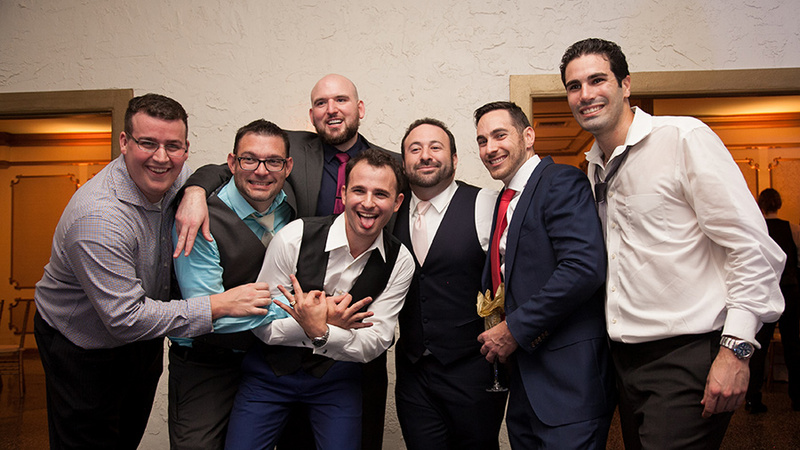 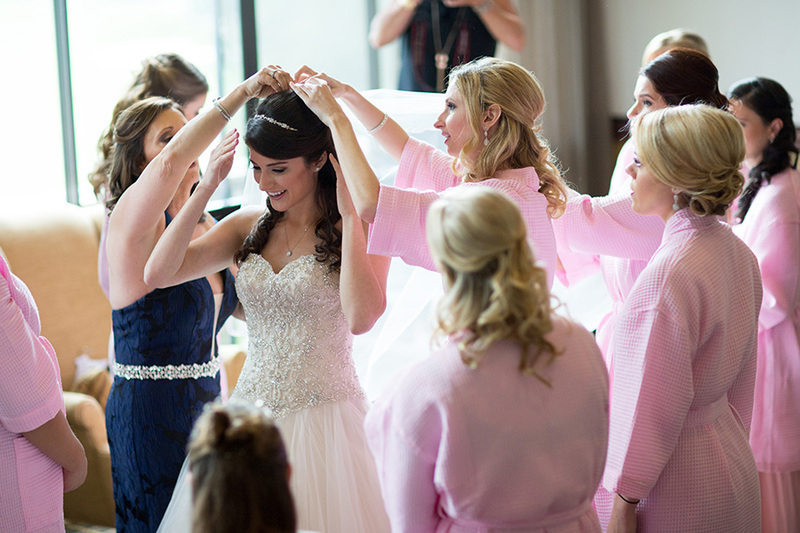 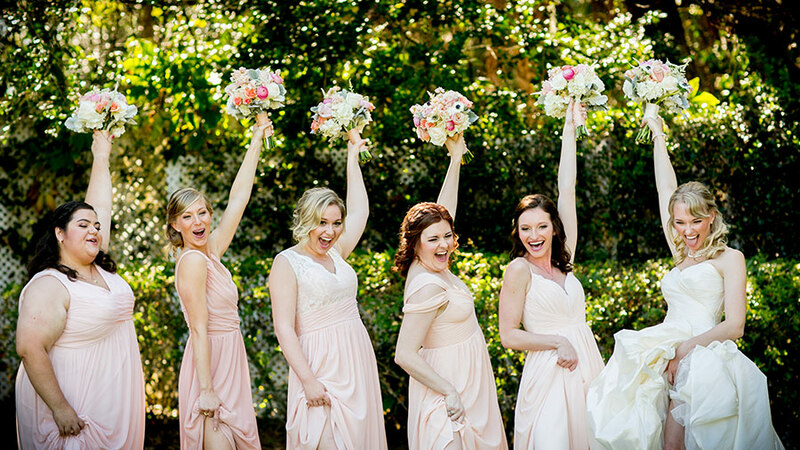 Their guests came all the way to Orlando from Australia, the United Kingdom and Switzerland to celebrate with them, and celebrate they did with delicious food, lively dancing and drinking all night long until their fiery sparkler departure. 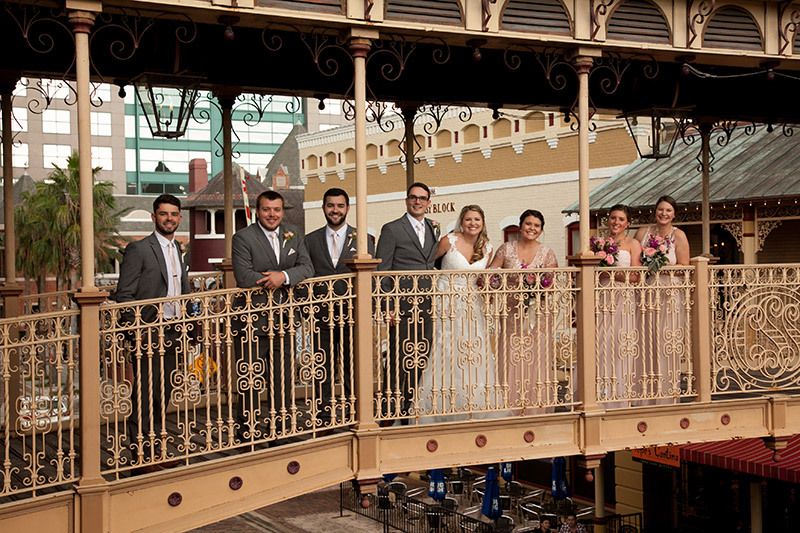 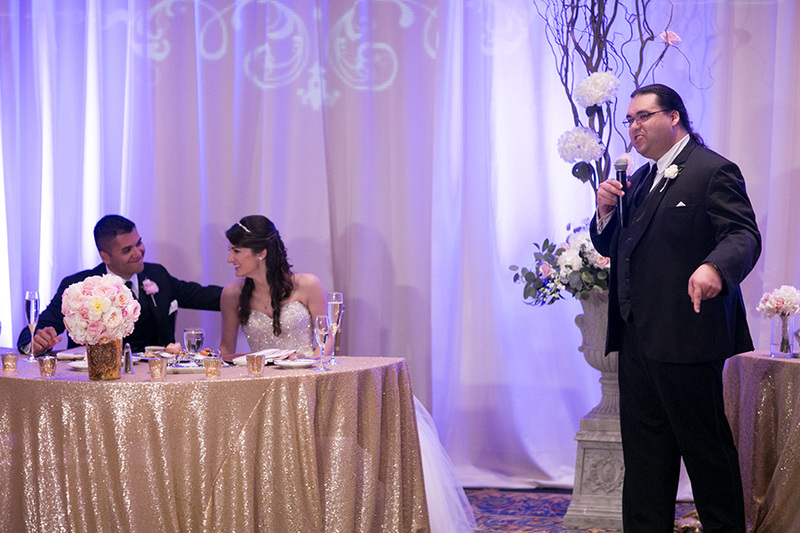 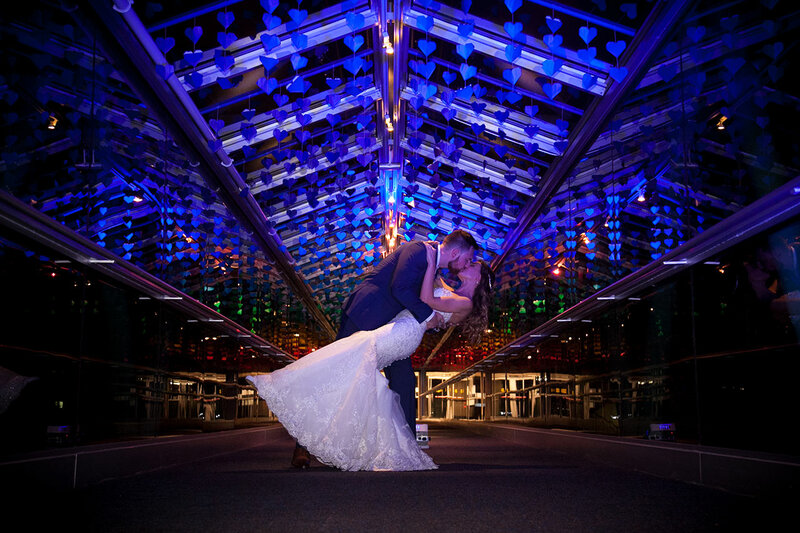 Their Ballroom at Church Street Station Wedding was a huge success, that brought together 2 families, and 2 different cultures. 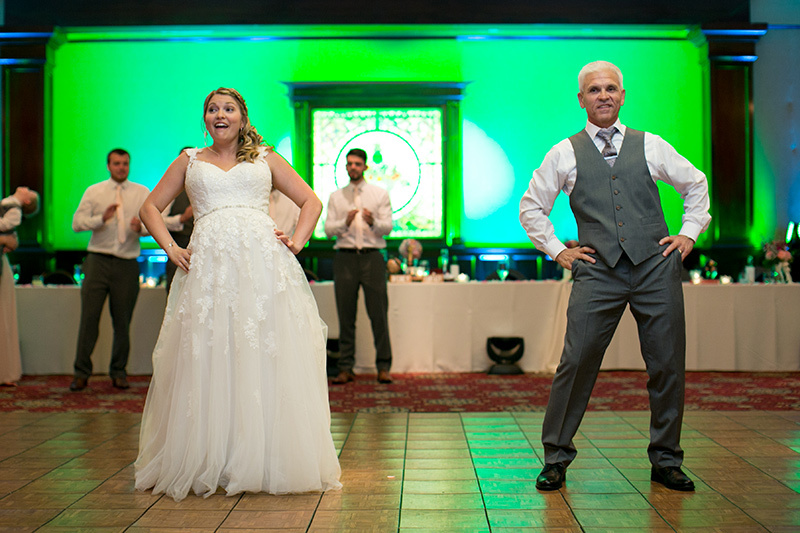 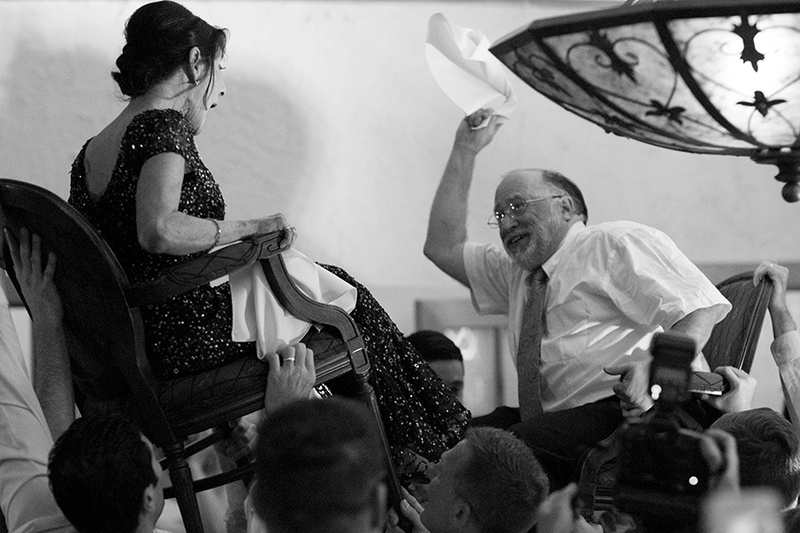 All wedding days are a blur but no one will forget the epic Maid of Honors ” rap speech ” nor the fun father/daughter mash up dance Brandy did with her dad. 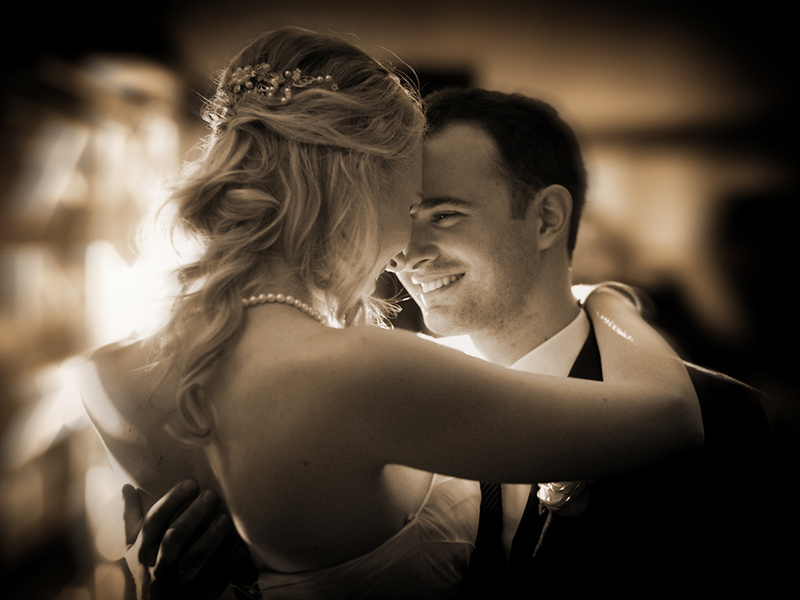 Dave’s fondest memory was the tender and sweet dance with his grandmother to her favorite song. 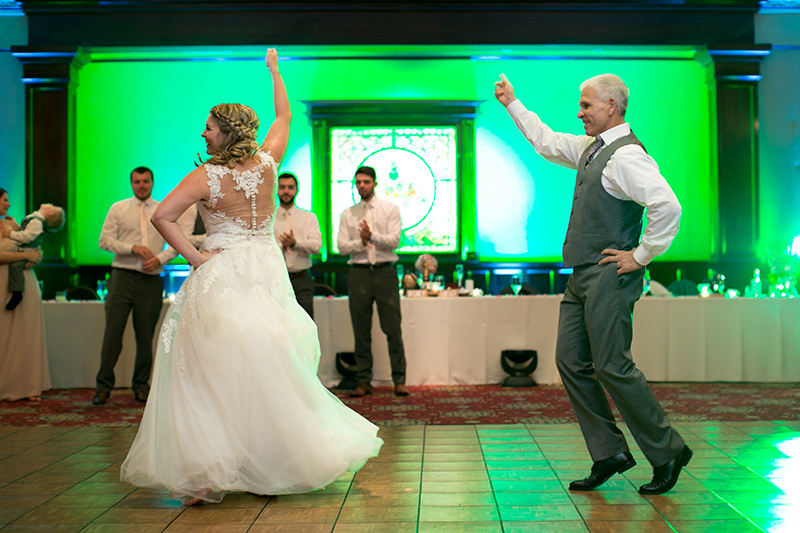 Congratulations Brandy and Dave, your wedding was great fun and S&S wishes you both many many years of happiness together!! 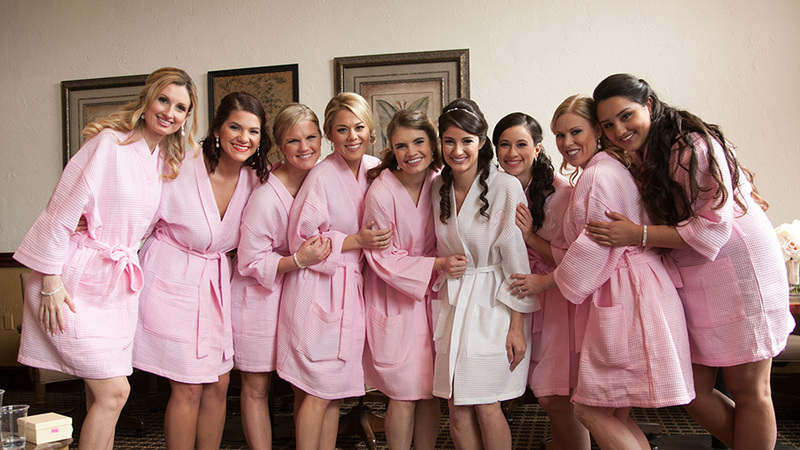 I honestly can say that Madalyn was one of the most relaxed brides I’ve ever encountered , lucky Aaron! 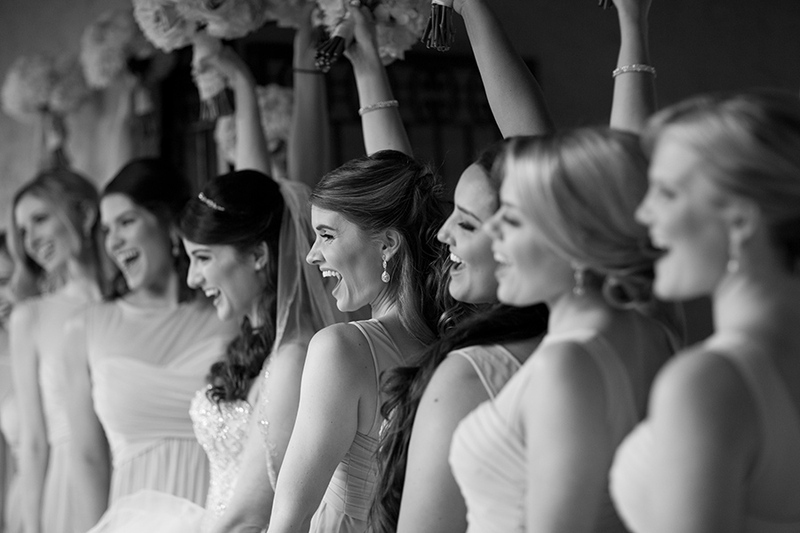 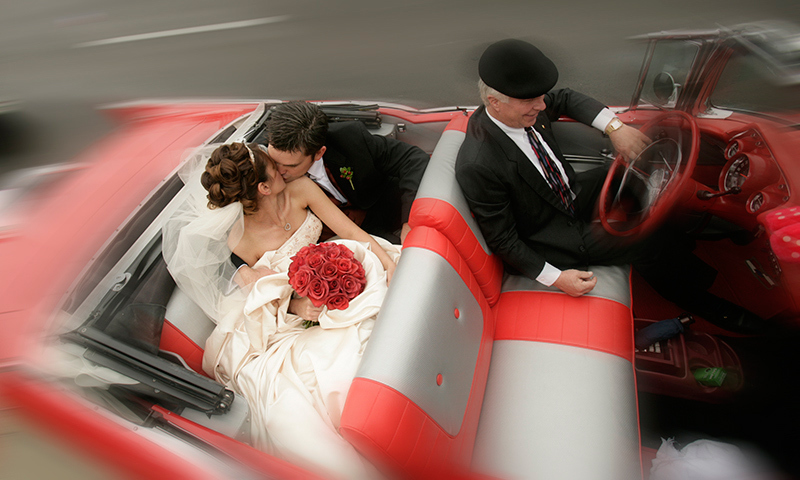 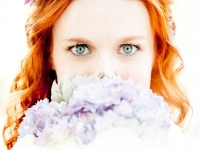 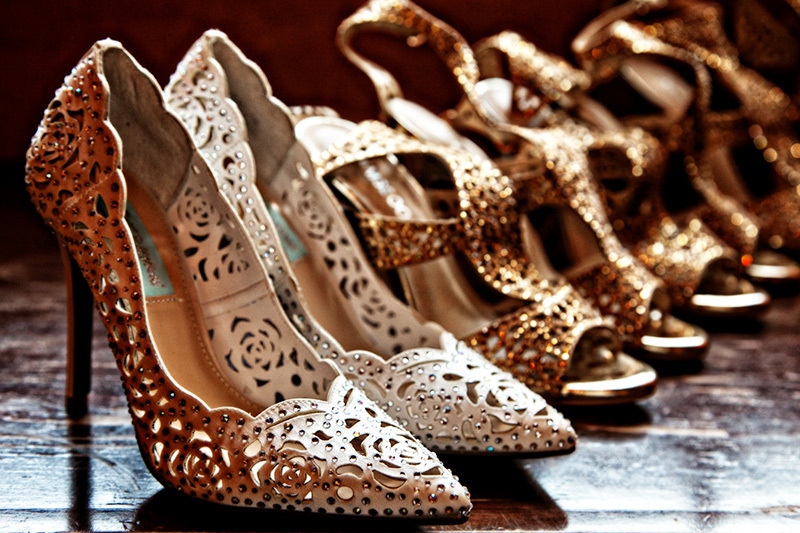 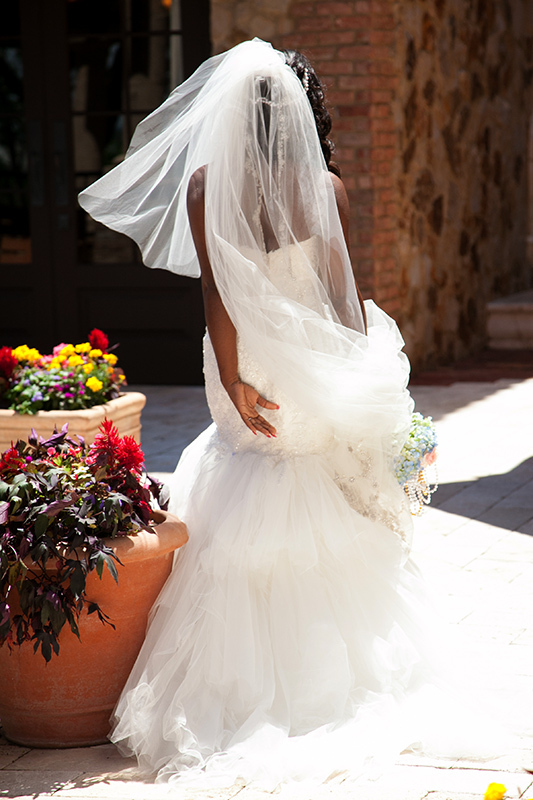 When a bride “goes with the flow” so to say the stress of the wedding is greatly reduced. 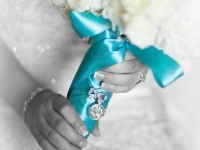 If you have no theme other than choosing things you like how can you go wrong? 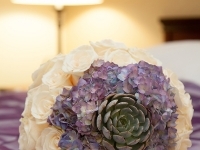 Instead of having to find things that fall within your theme or “go with ” your theme you can simply find what works for you thus opening up all sorts of possibilities. 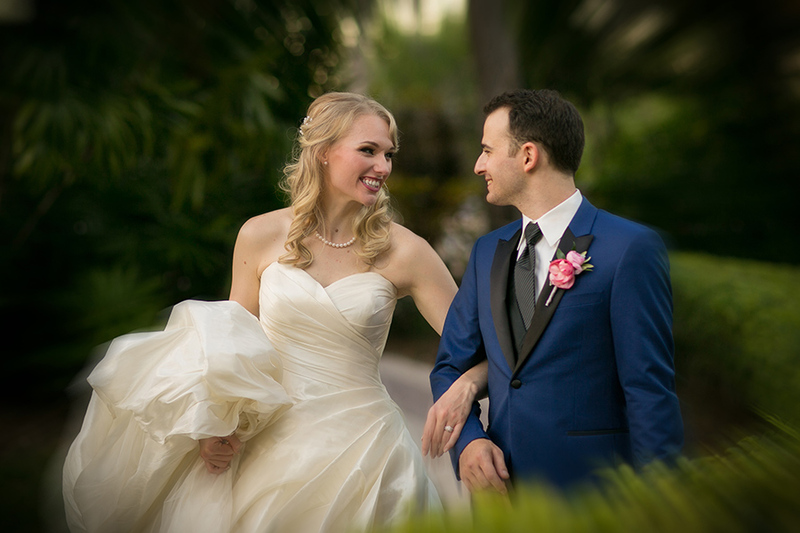 Madalyn and Aaron chose Maison et Jardin for their beautiful April 1st Orlando wedding and it was refreshing and surprising to me how beautiful and elegant everything was for a bride who had no theme and no preconceived ideas about how her Central Florida wedding day should be. 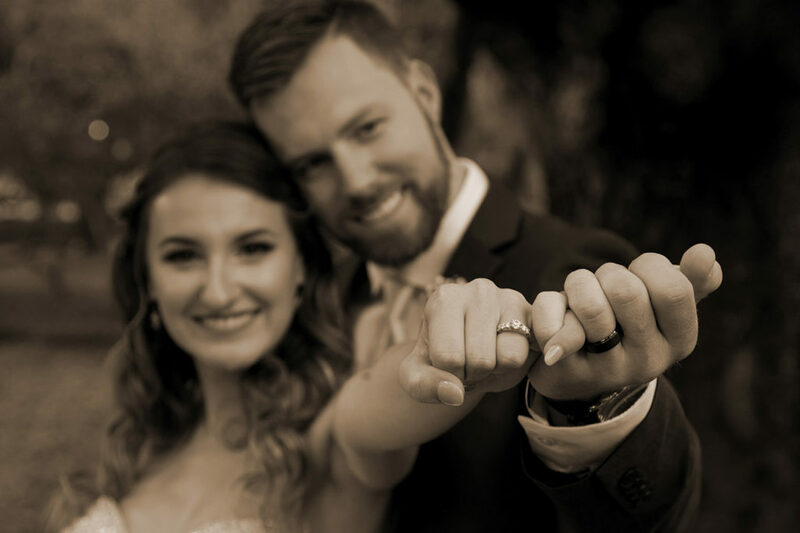 Congratulations to this wonderful and so in love couple, S & S Photography wishes you many years of health and happiness!! 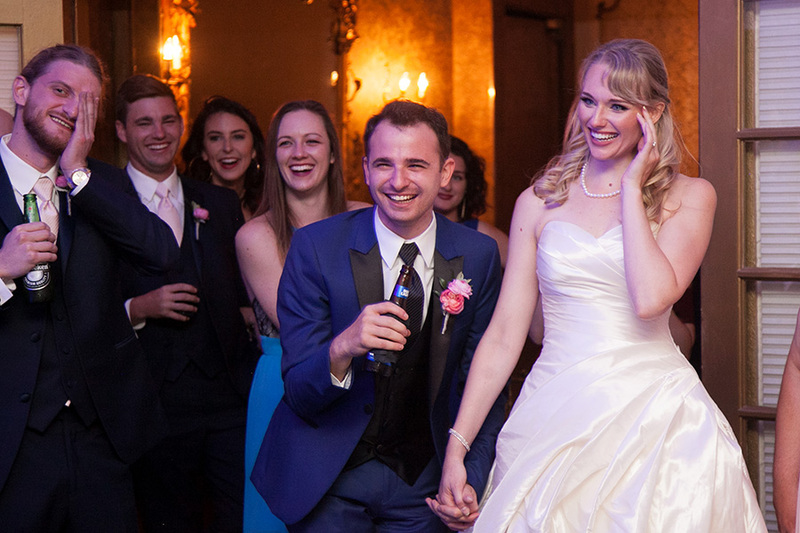 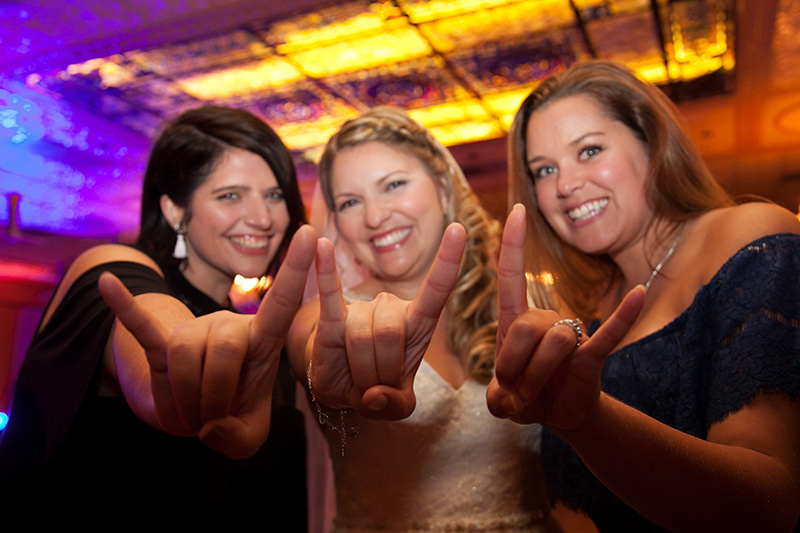 We went with a personal friend to DJ our wedding. 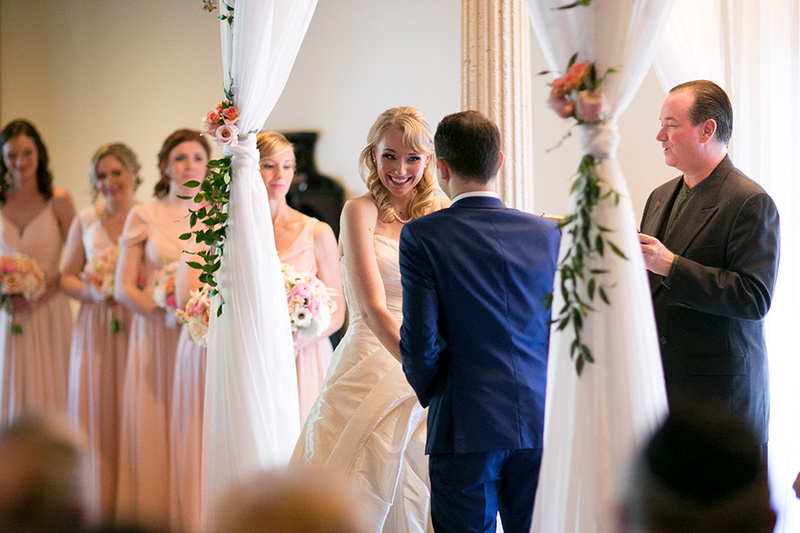 He knows our preferences in music and he was so eager to make us happy on our big day! 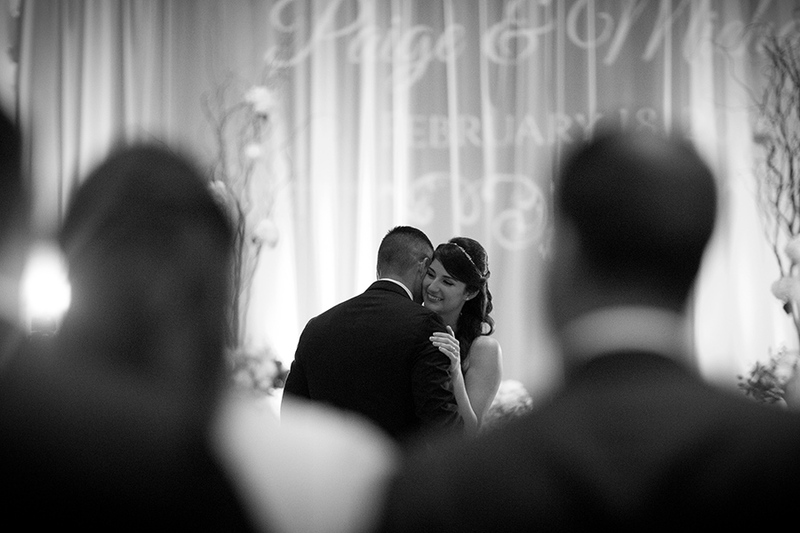 Would you believe that Mike & Paige’s parents and brother kept this proposed proposal secret for 3 WEEKS!! 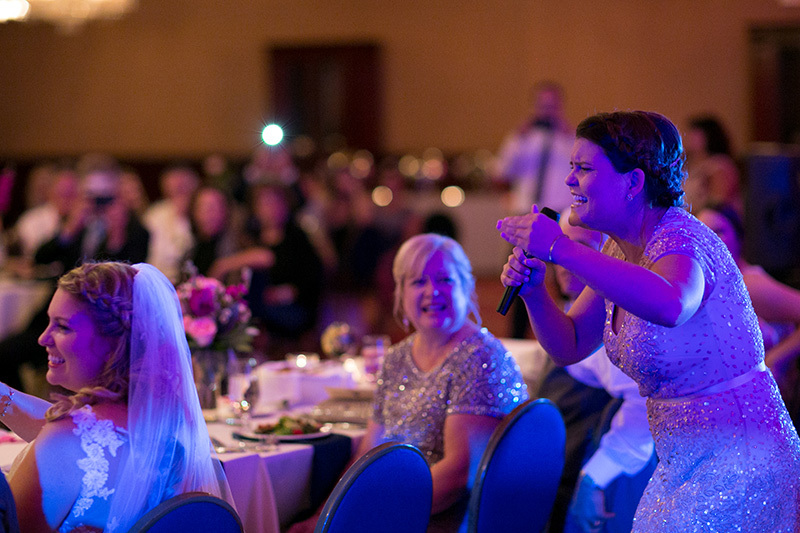 How her Mom kept that from her is beyond me, I would have burst from excitement! 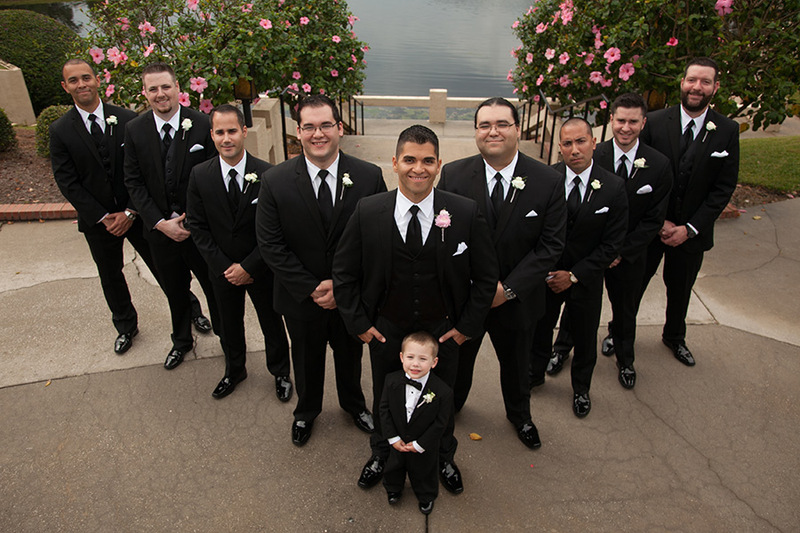 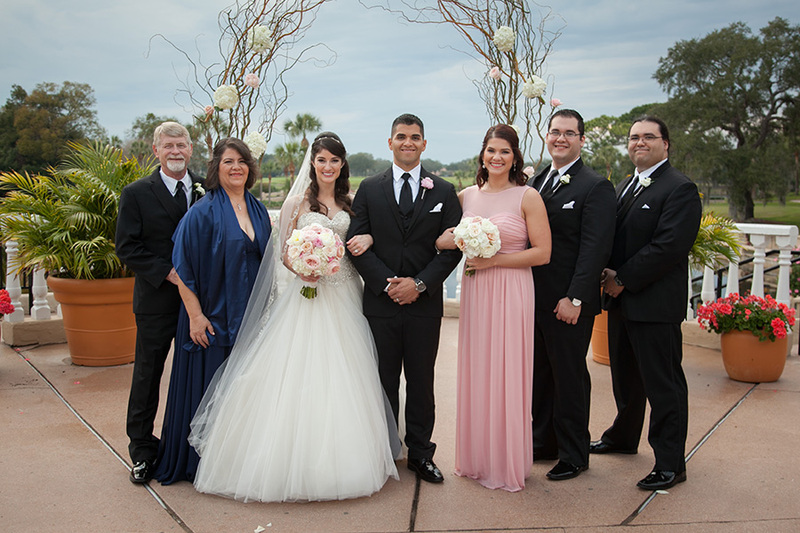 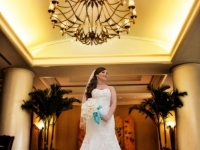 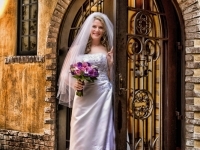 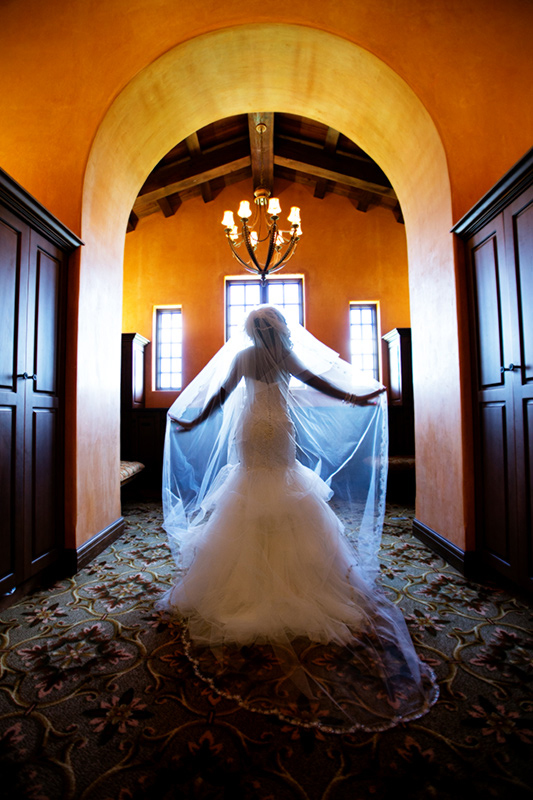 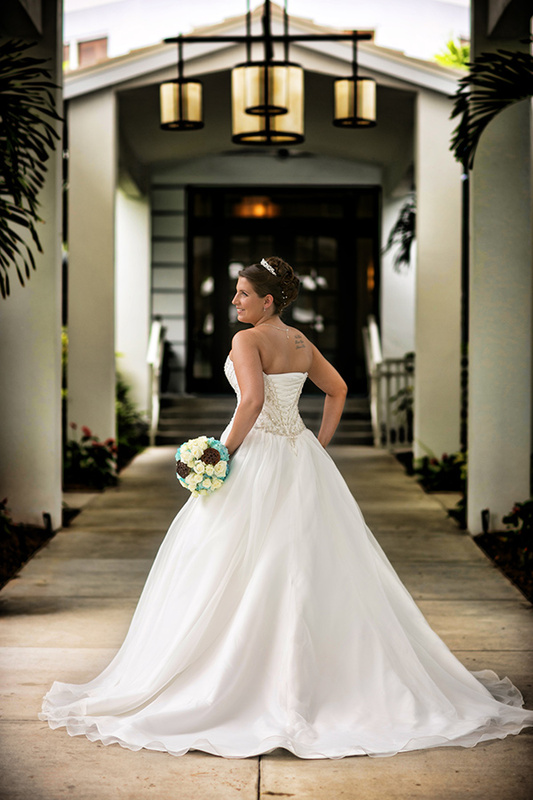 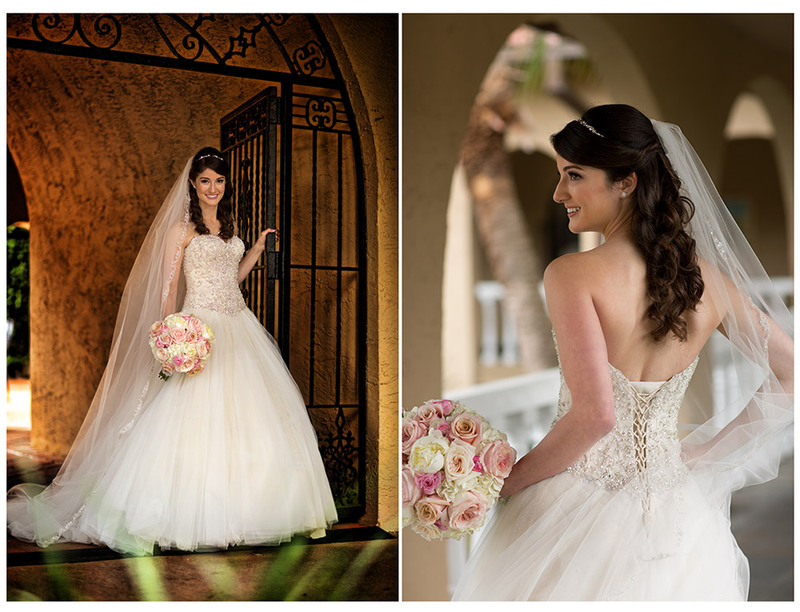 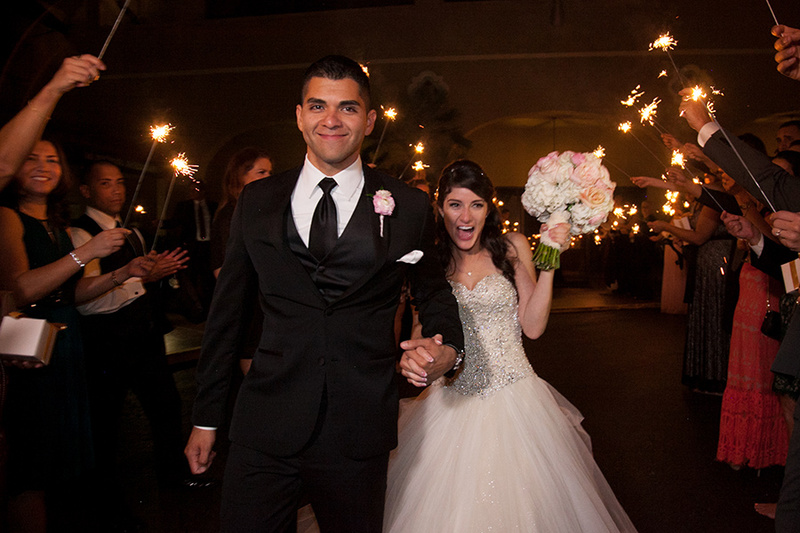 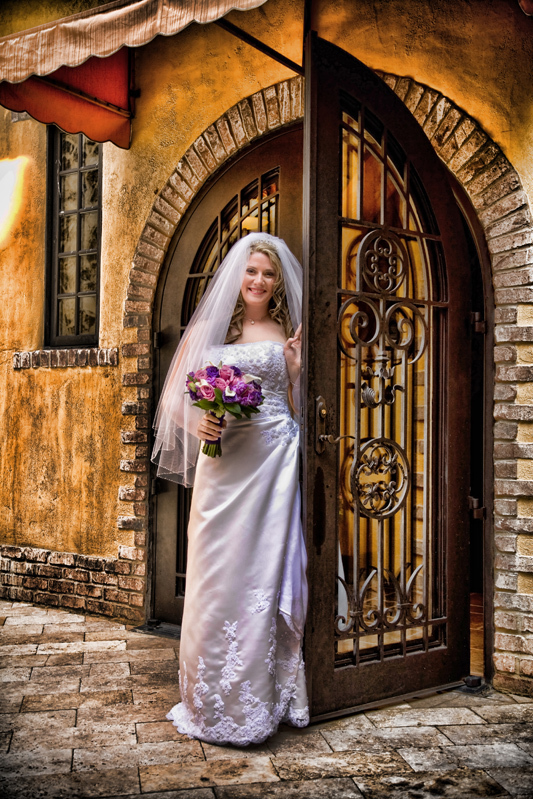 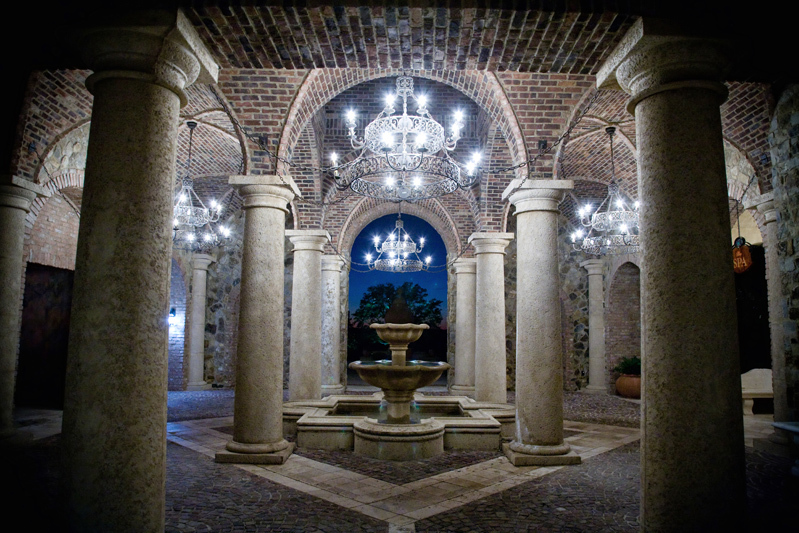 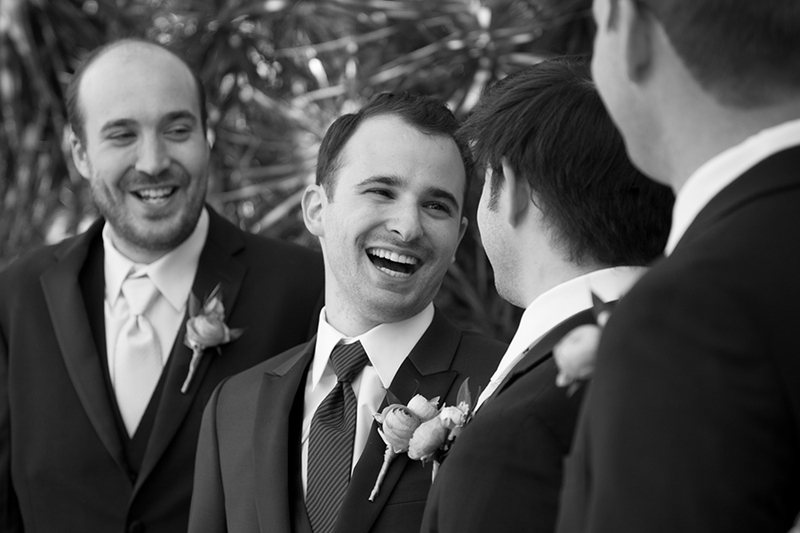 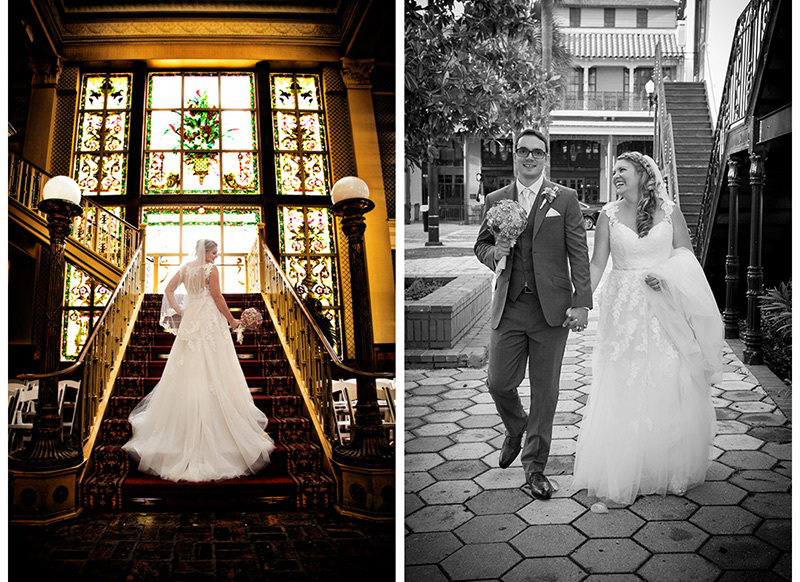 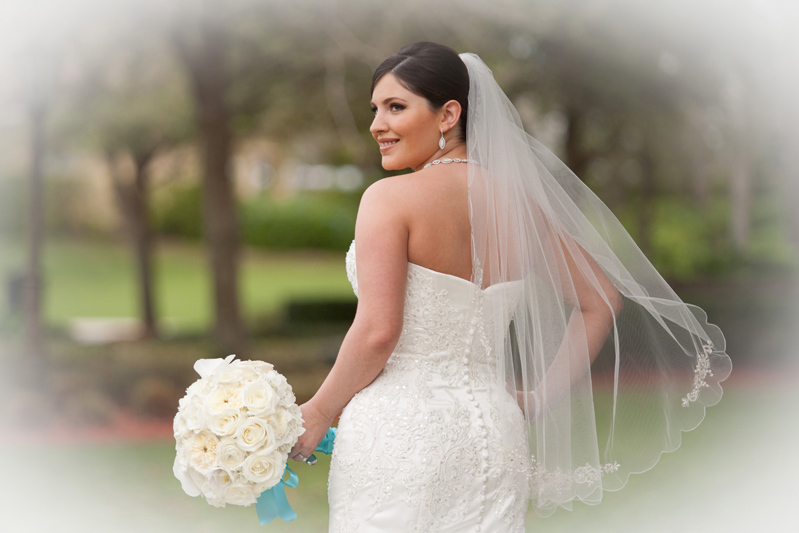 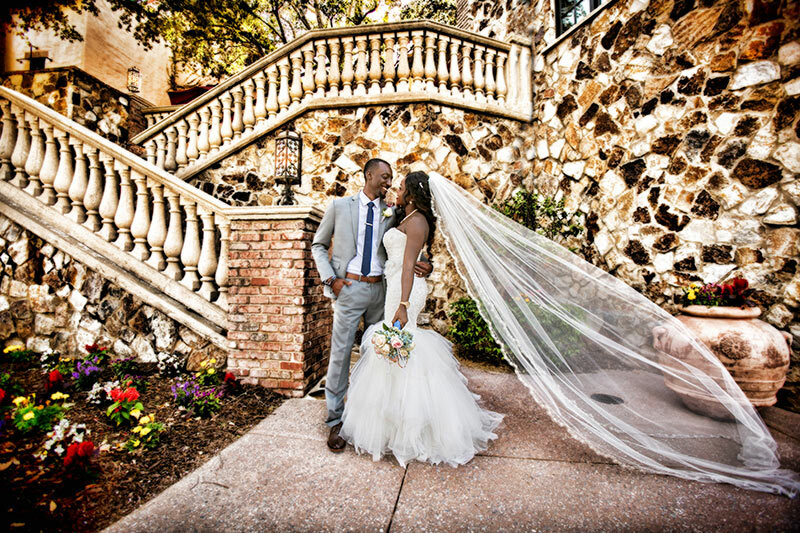 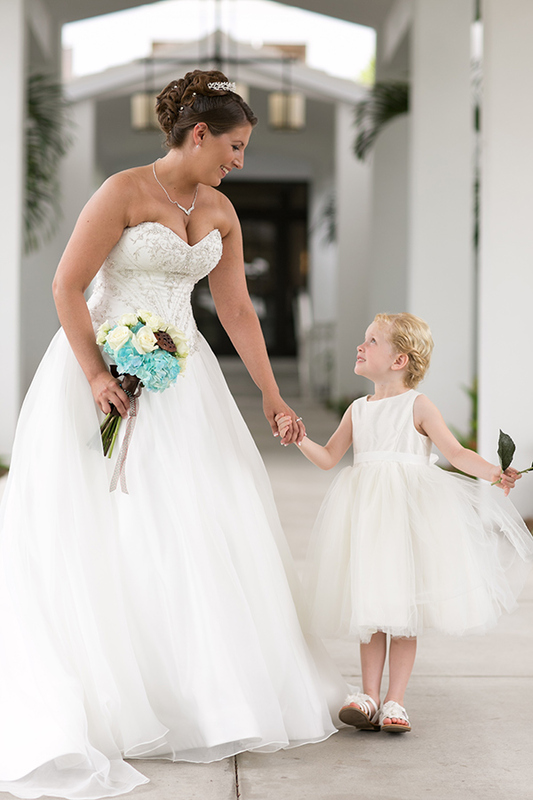 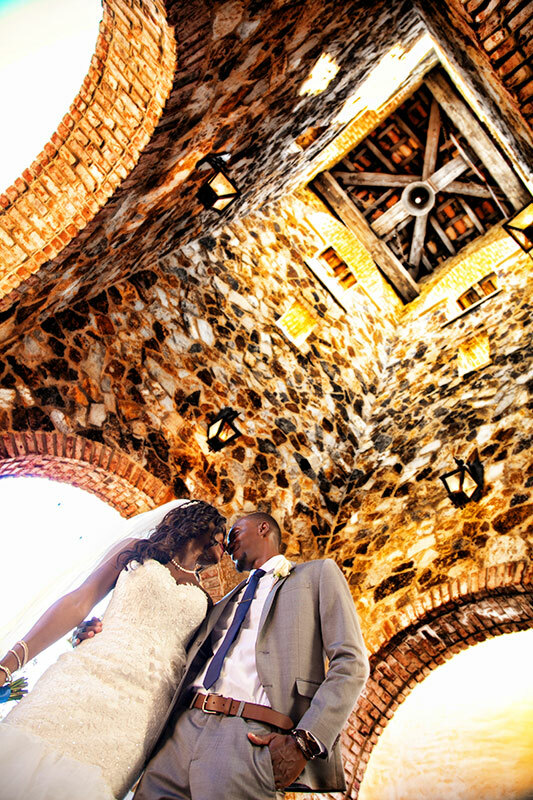 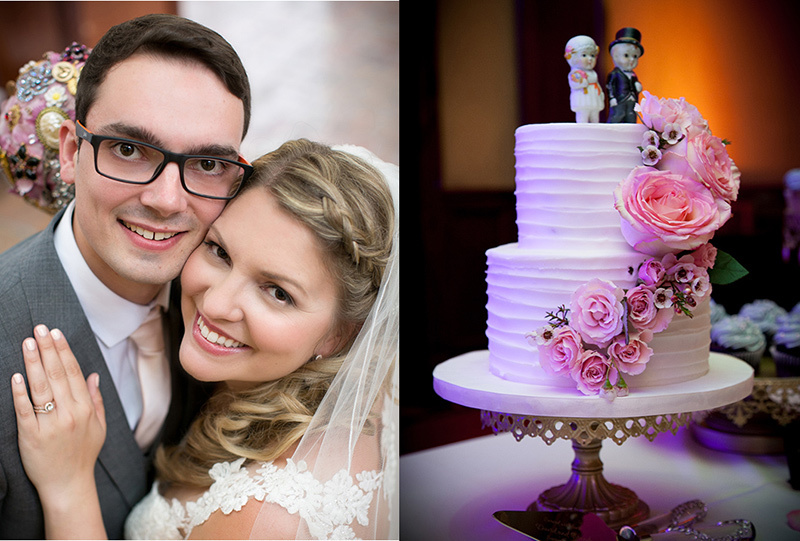 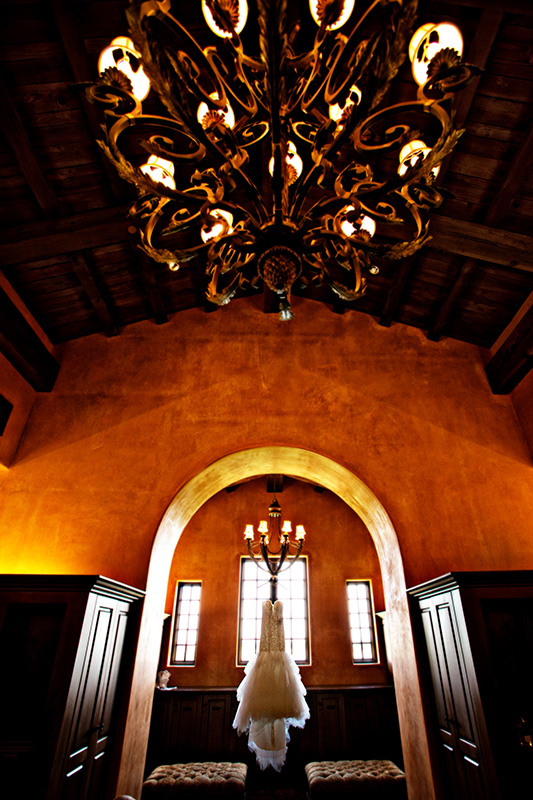 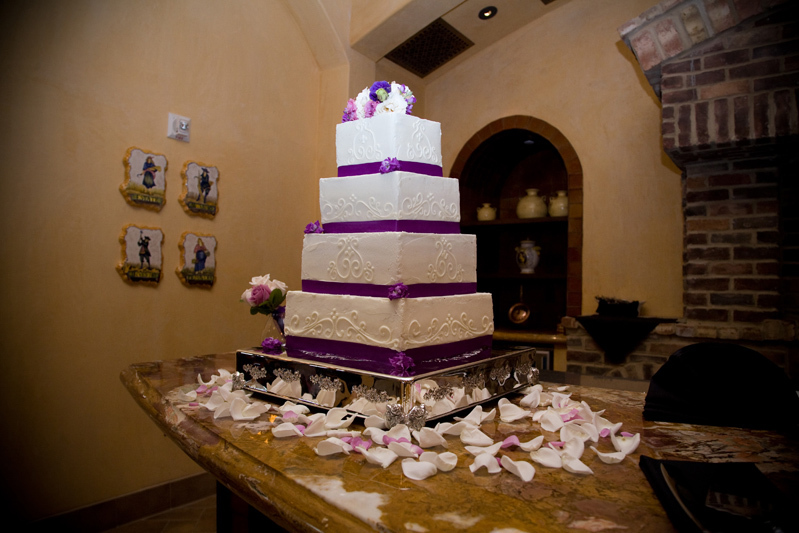 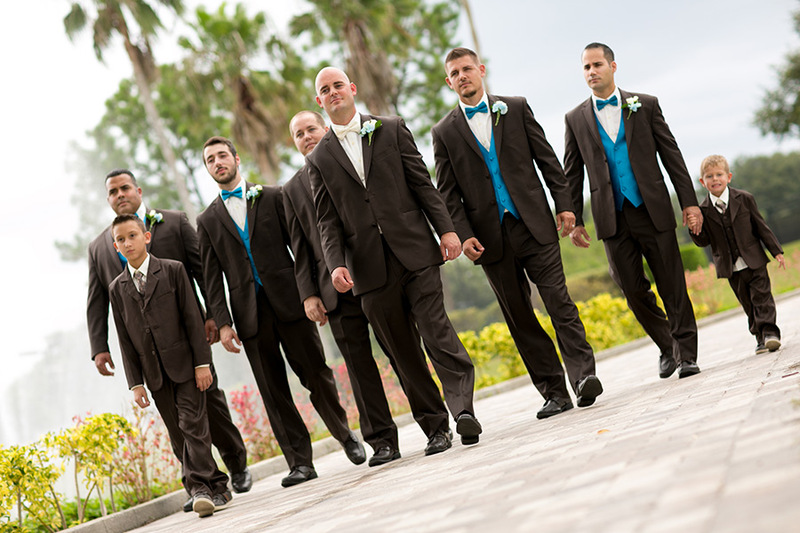 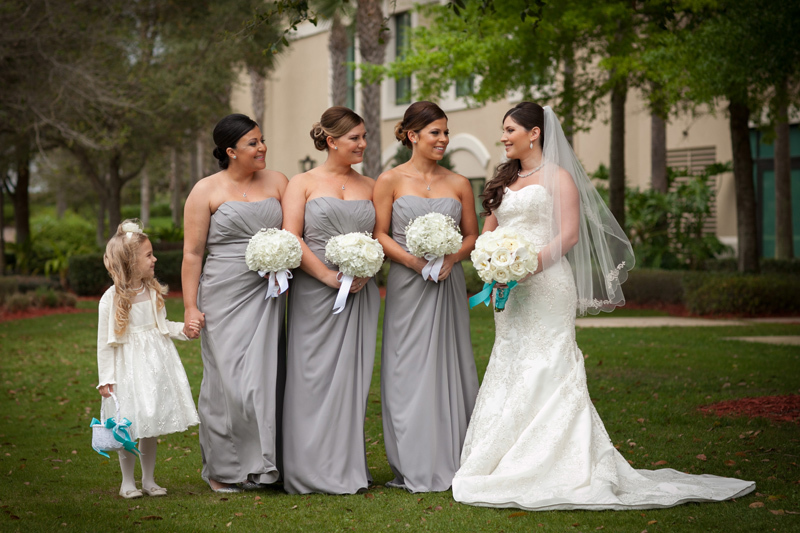 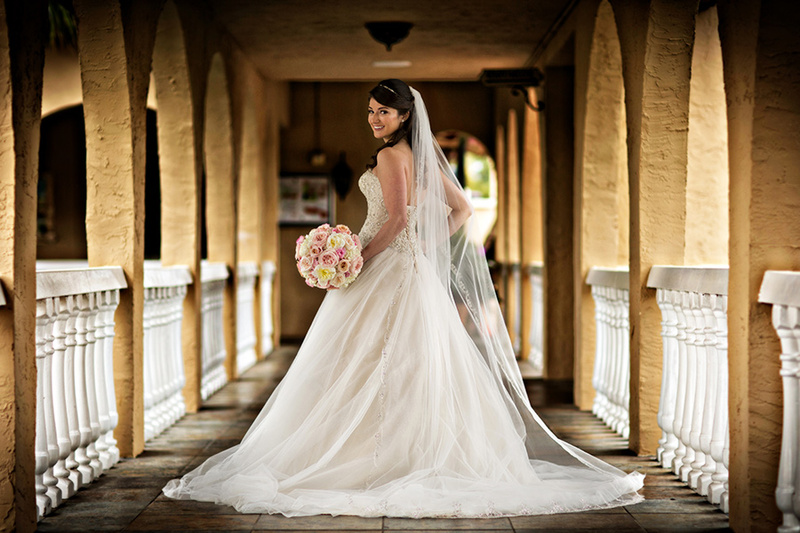 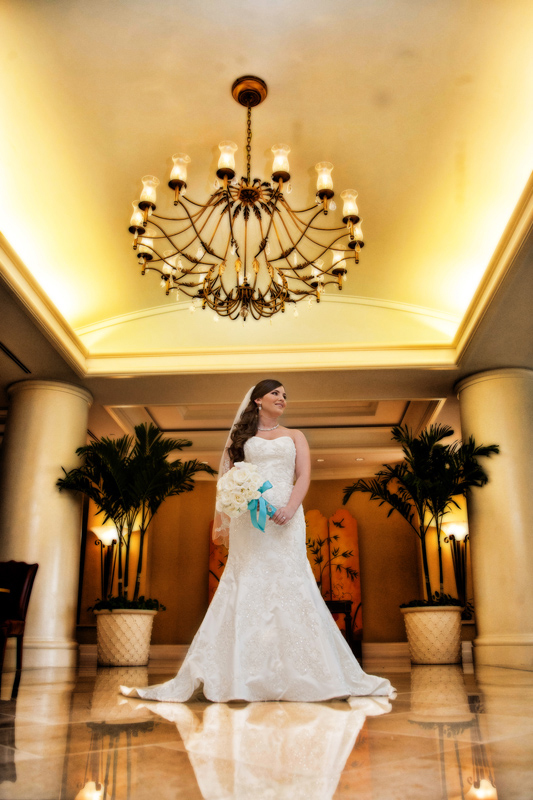 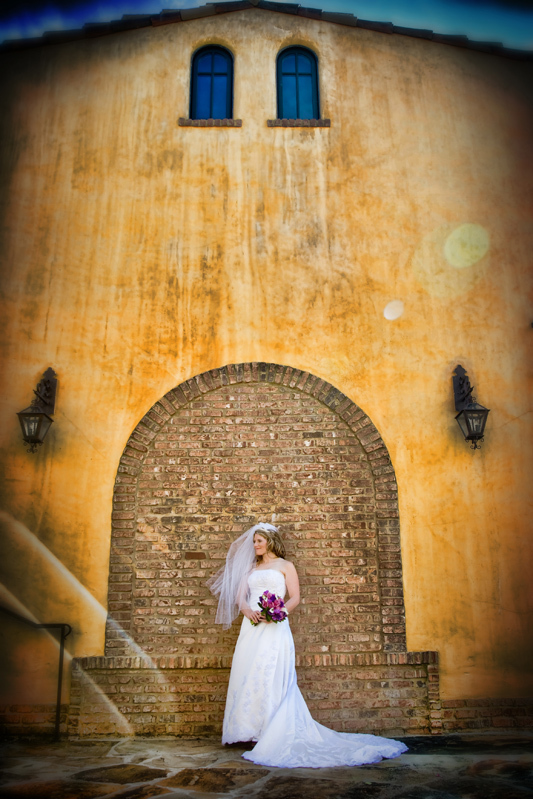 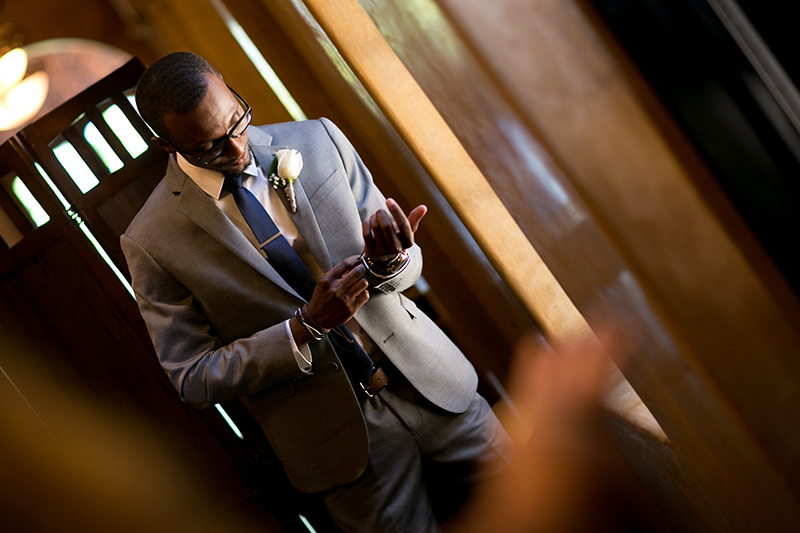 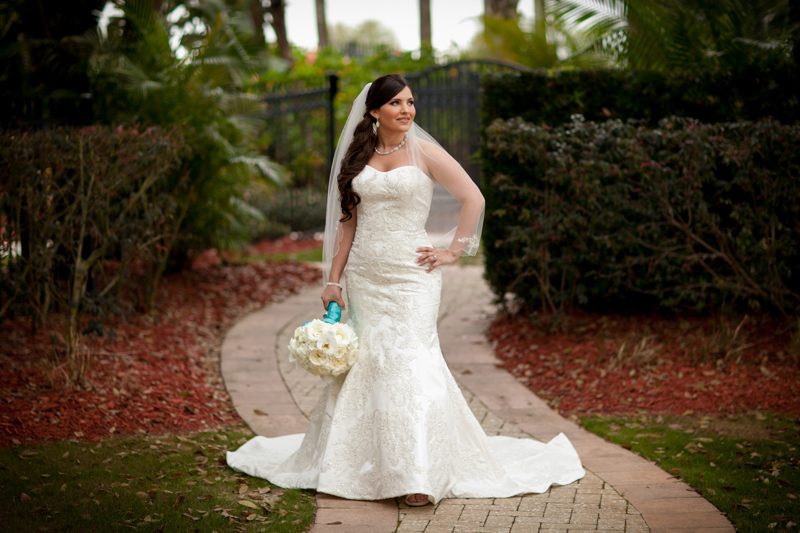 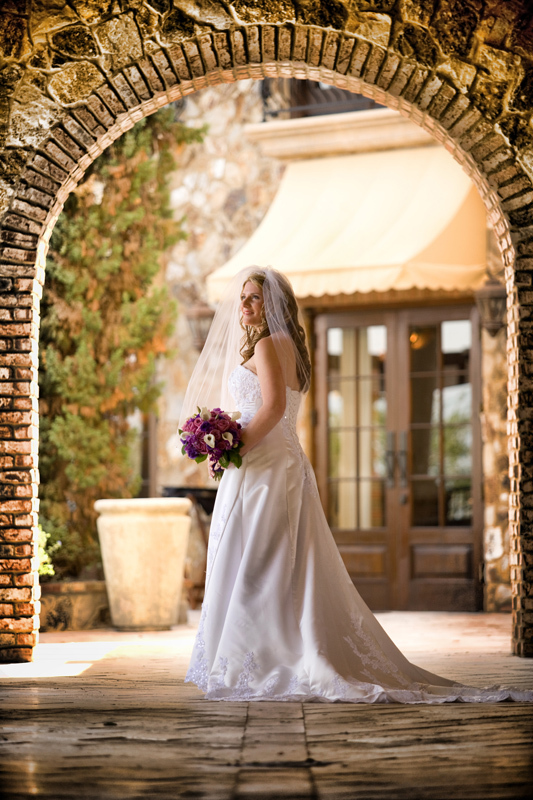 Paige and Mike eventually chose the beautiful Mission Inn Resort for their Orlando wedding. 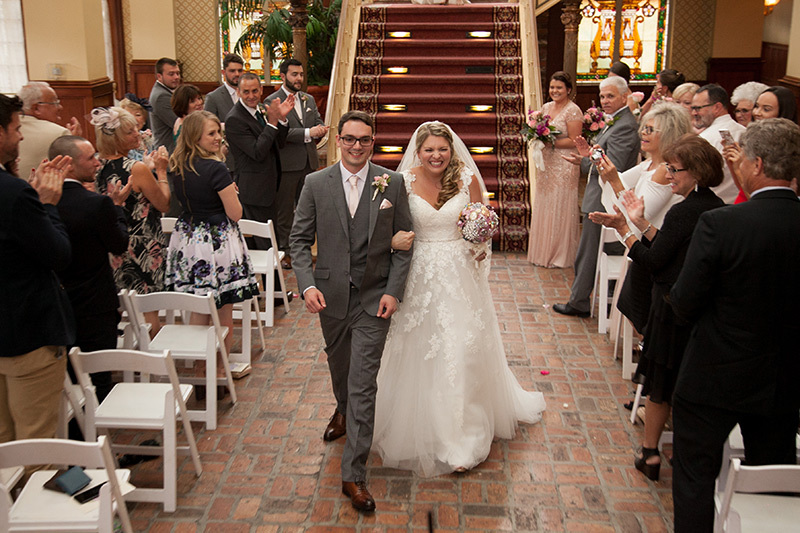 The day was rainy but nothing could dampen Paige and Mike’s excitement! 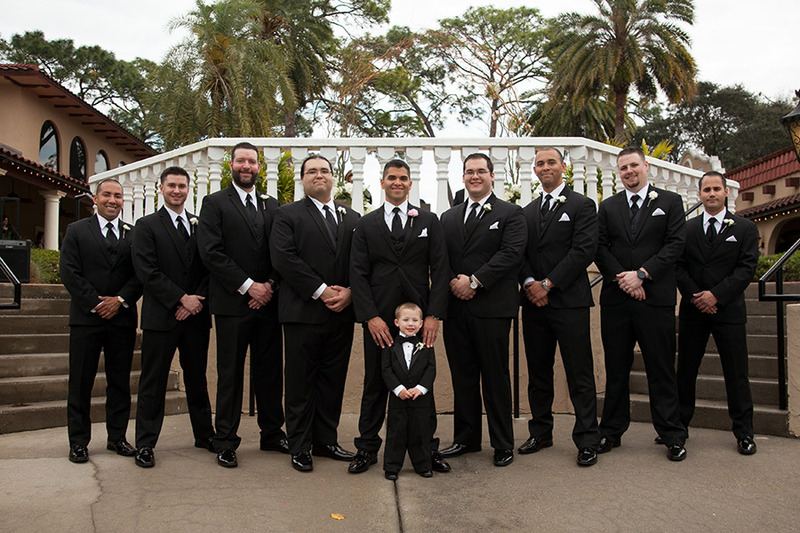 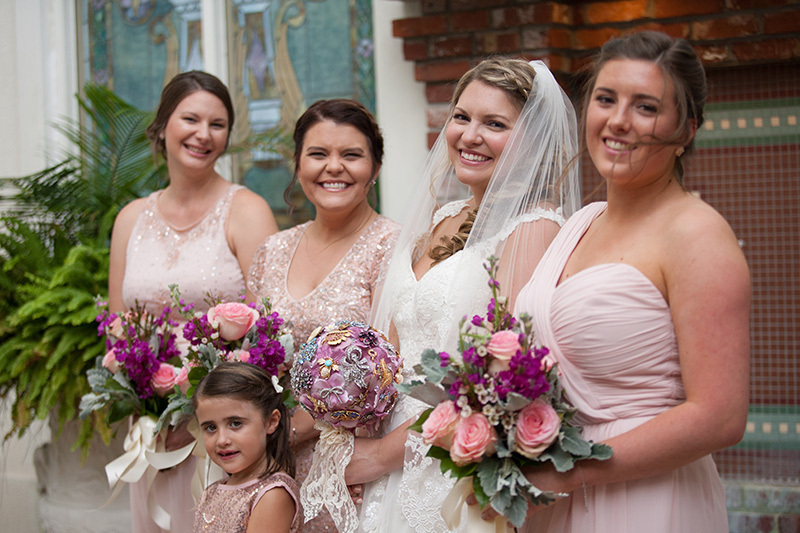 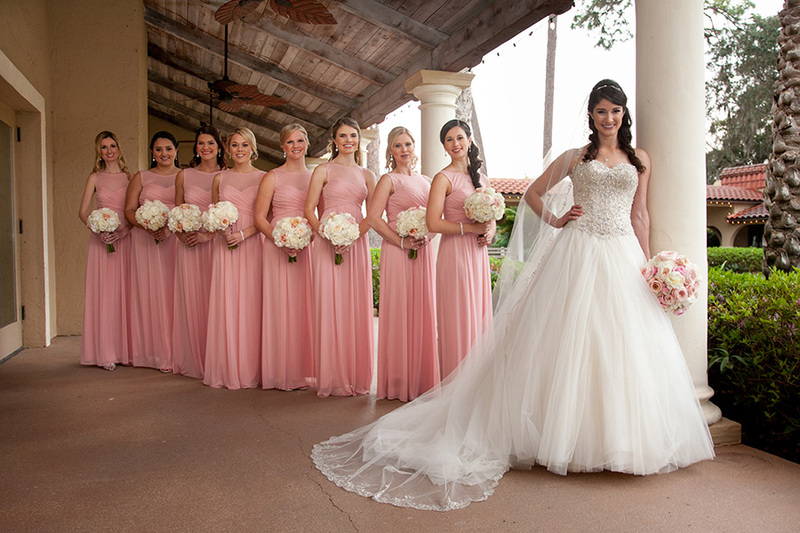 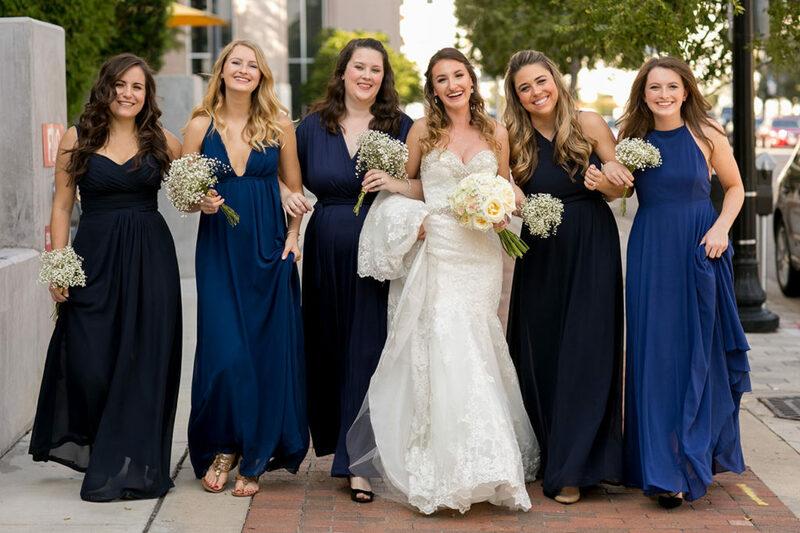 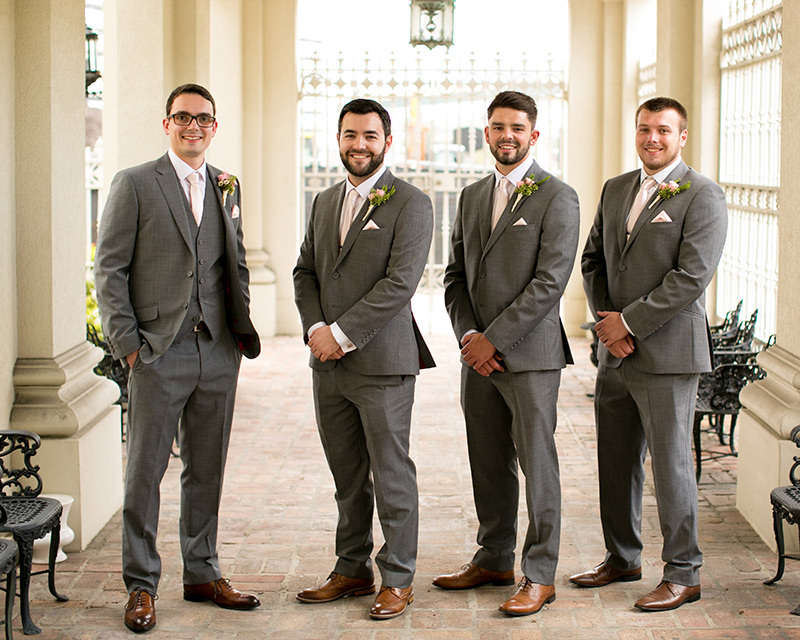 All the planning , all the details, all came together ( with considerable help from their talented planner Katie Jimenez, owner of Big Day Celebrations, Katie@BigDayCelebrations.com) and their Mission Inn Resort wedding was a true celebration of the joining of 2 lives and 2 families. 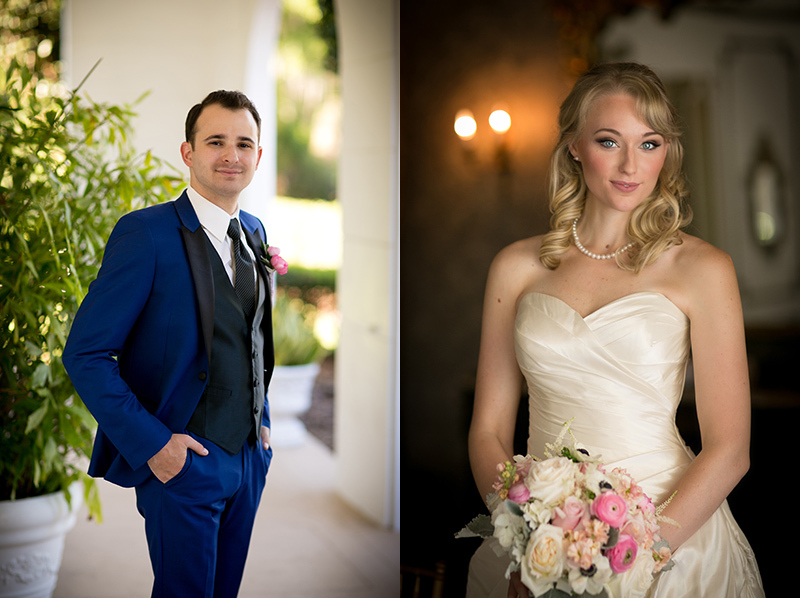 Here we are 2 months later and these 2 wonderful people are now busy helping others. 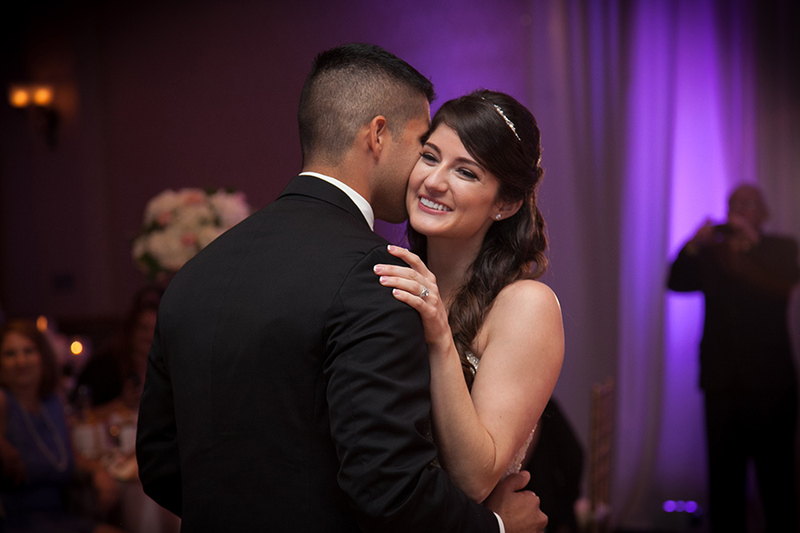 Paige is a Pediatric Nurse Practitioner and Mike works in Law Enforcement protecting and serving the citizens of Orlando. 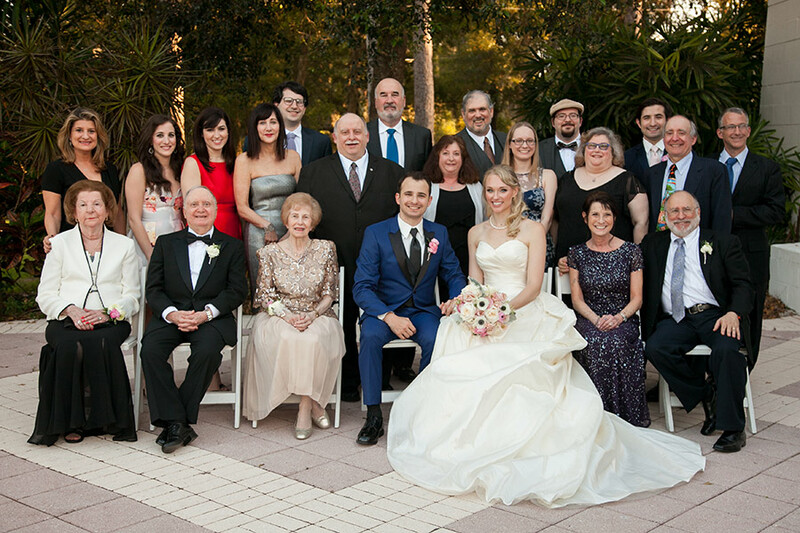 Stan and I wish Paige and Mike a long, happy and healthy life together. 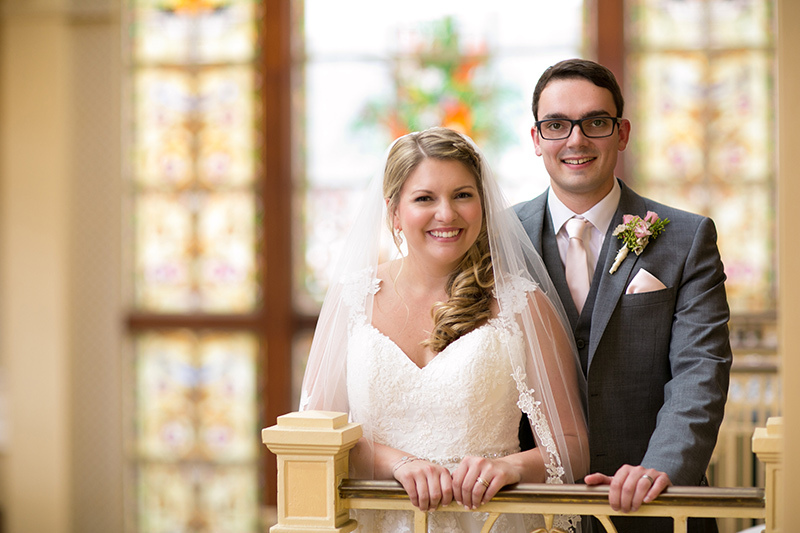 These are 2 people that are thoughtful, kind, smart, gorgeous, and just plain NICE…good people as they say, with wonderful families supporting them. 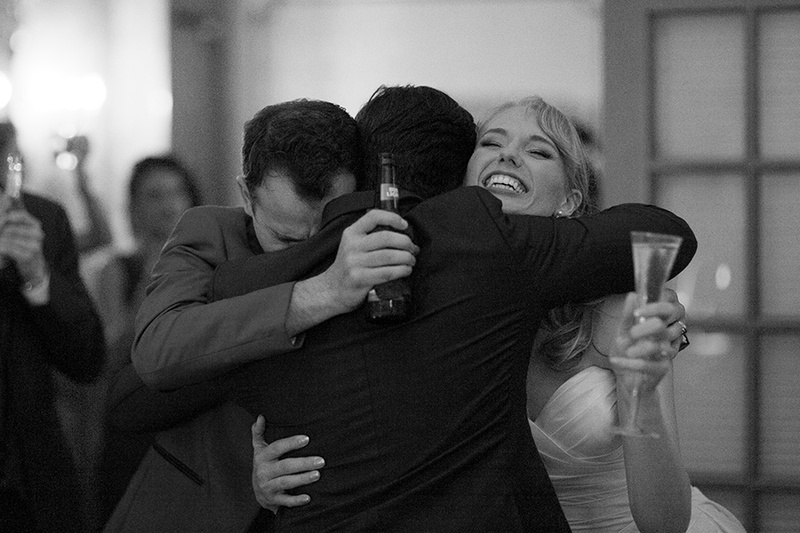 Lots of love to them!! 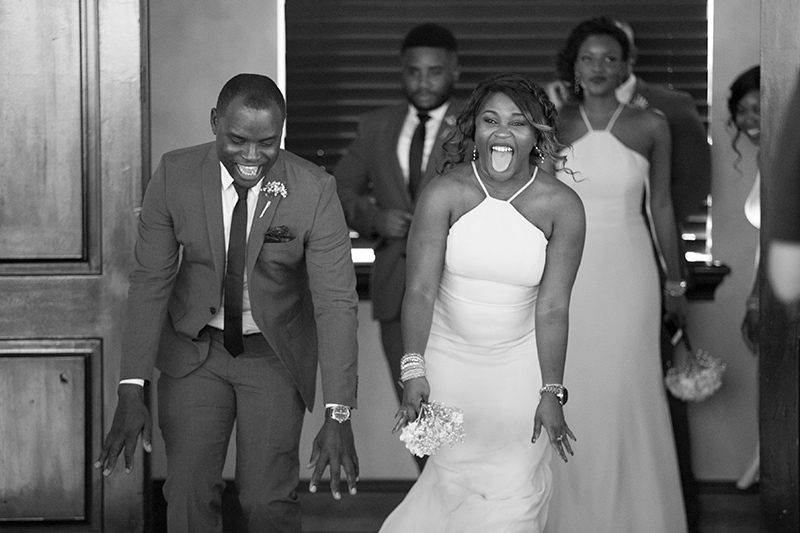 Advice from the happy couple…” Always think about why your partner may be acting the way they are, whether they be happy, sad, mad,anxious etc. 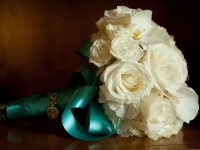 We find that this brings us peace and helps us to react in an appropriate way. 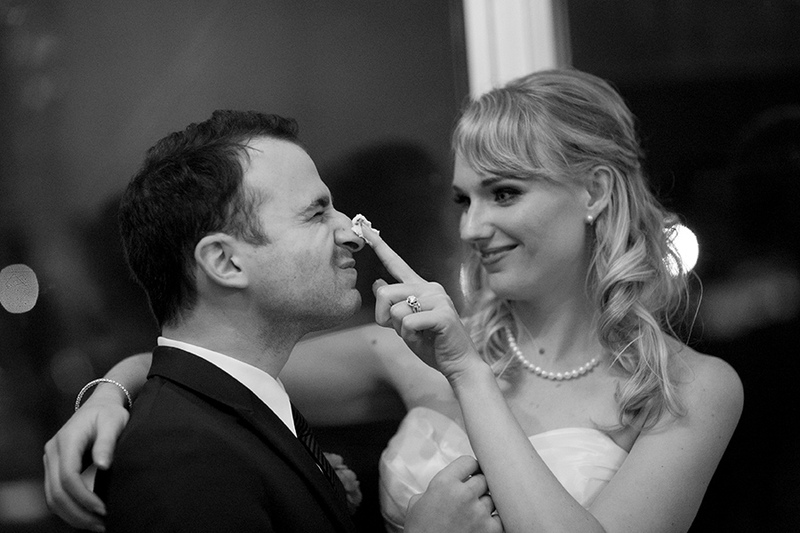 We also encourage couples to ” not sweat the small stuff” . 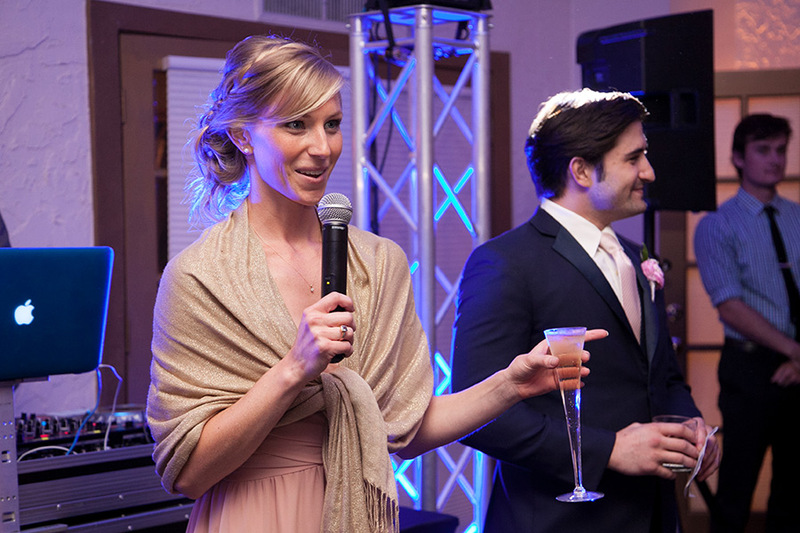 Is it really worth your energy to bring up that annoying thing that happened last week ; the answer is usually no. 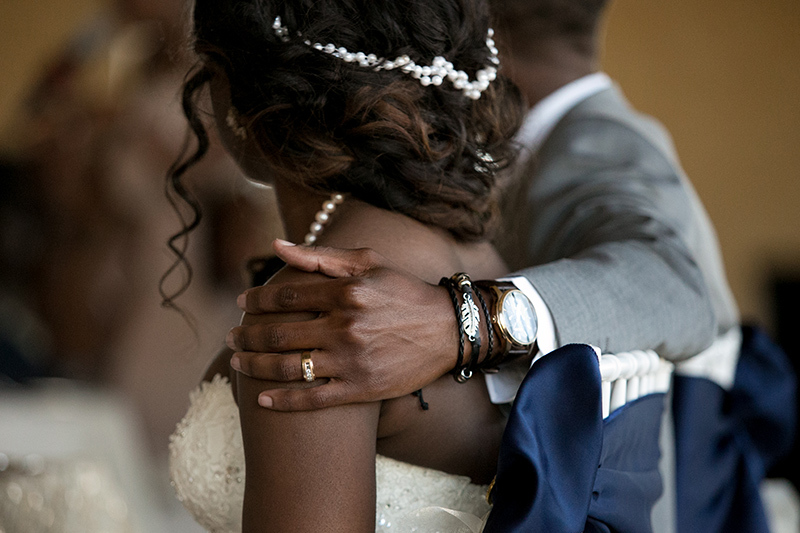 When there are big issues, talk about them and again, think about why your partner is acting the way they are. 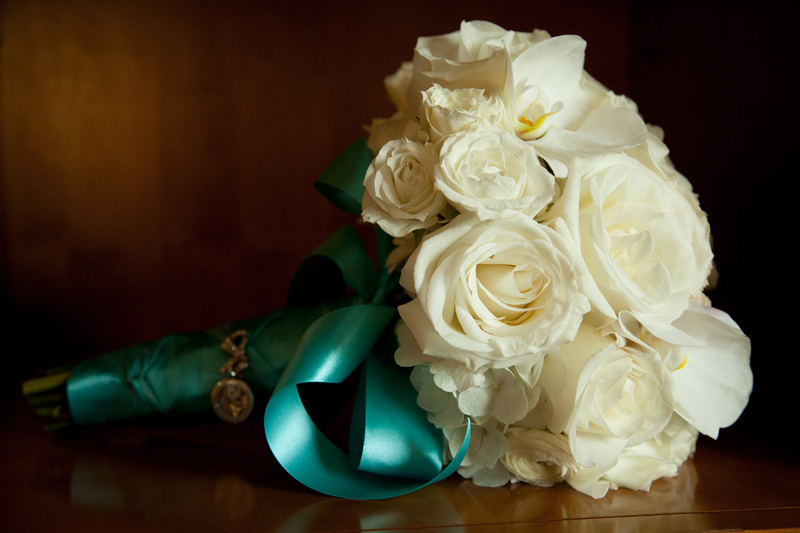 If you know what may be causing them their sadness, anger, anxiousness only then can you move in a direction towards happiness! 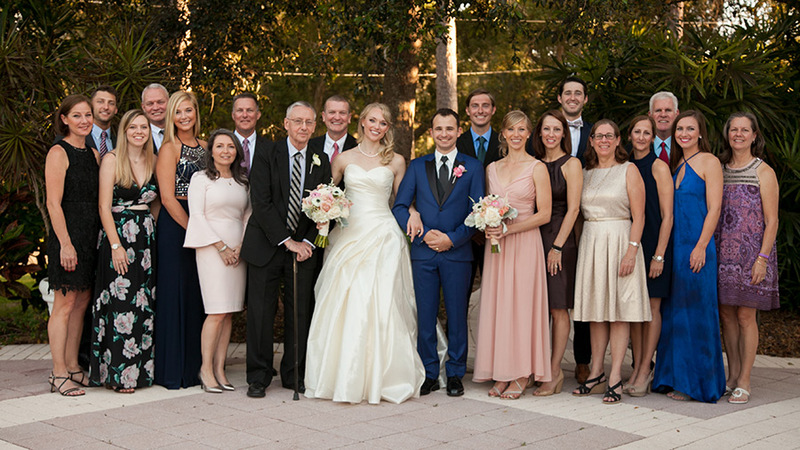 Great words of wisdom Mr & Mrs. Hamm! 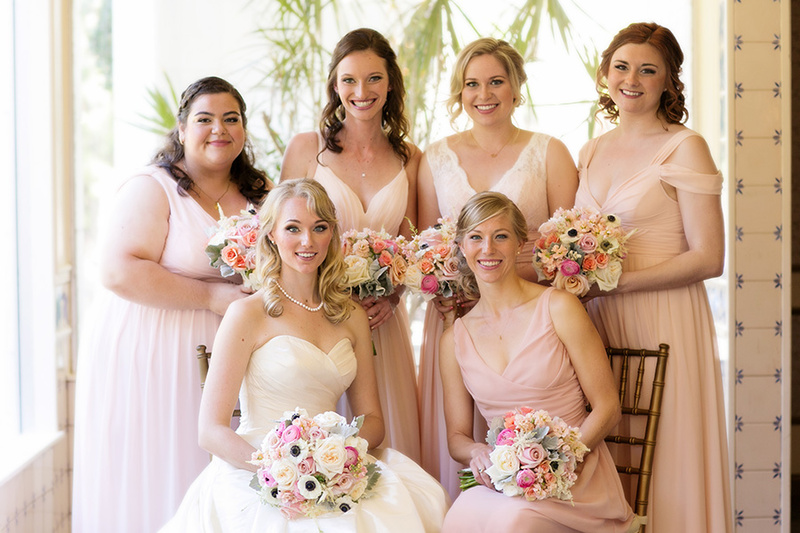 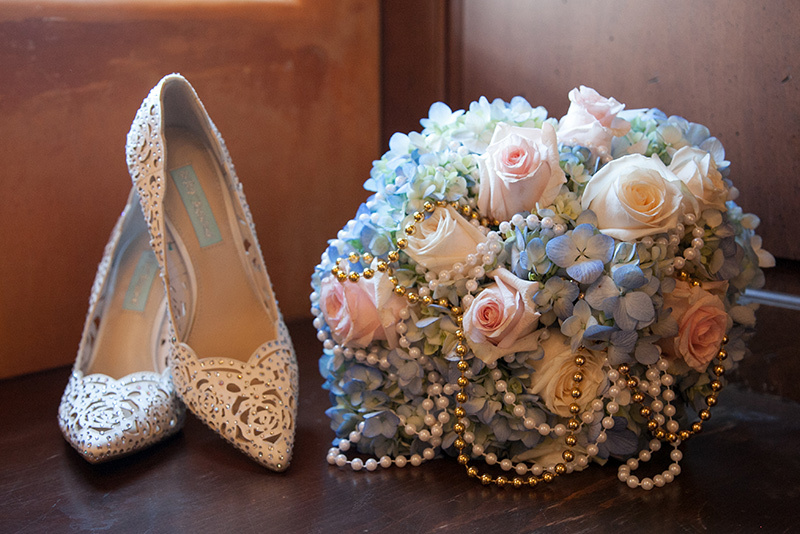 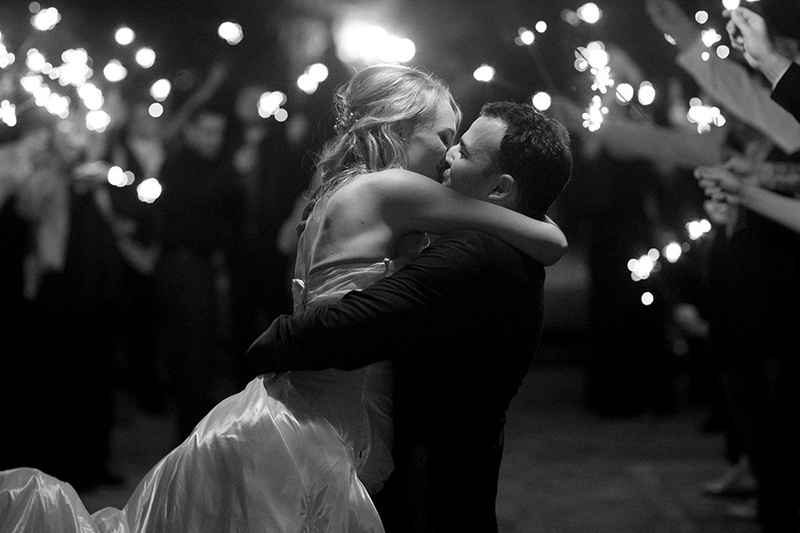 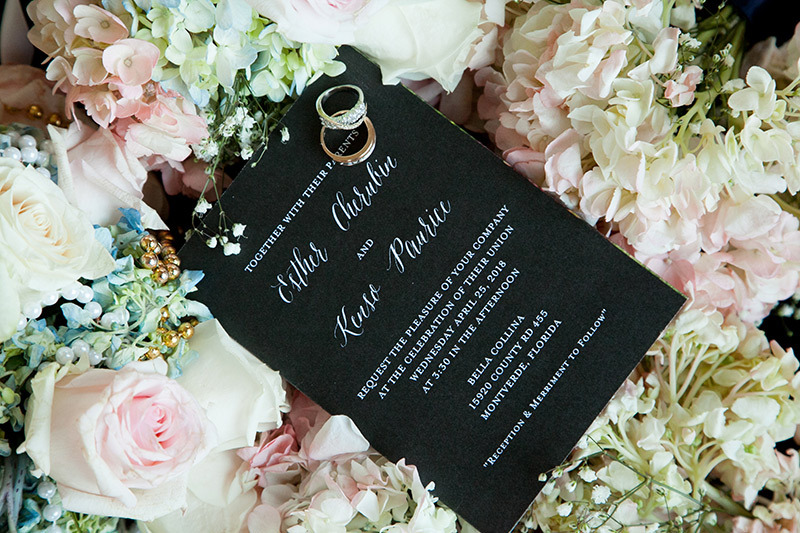 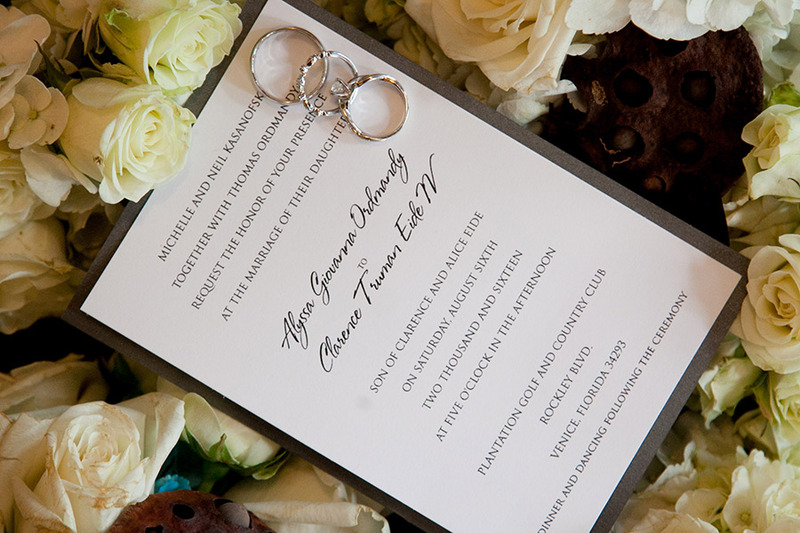 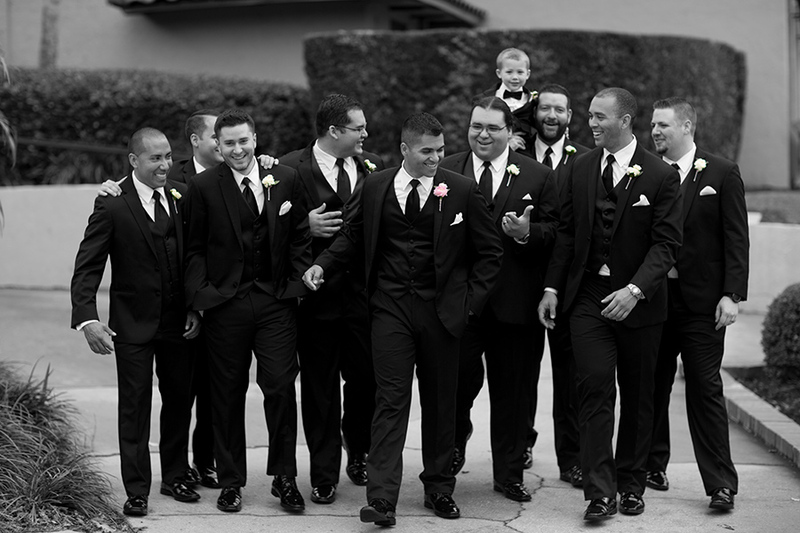 Alyssa and Bud’s beautiful Venice wedding! 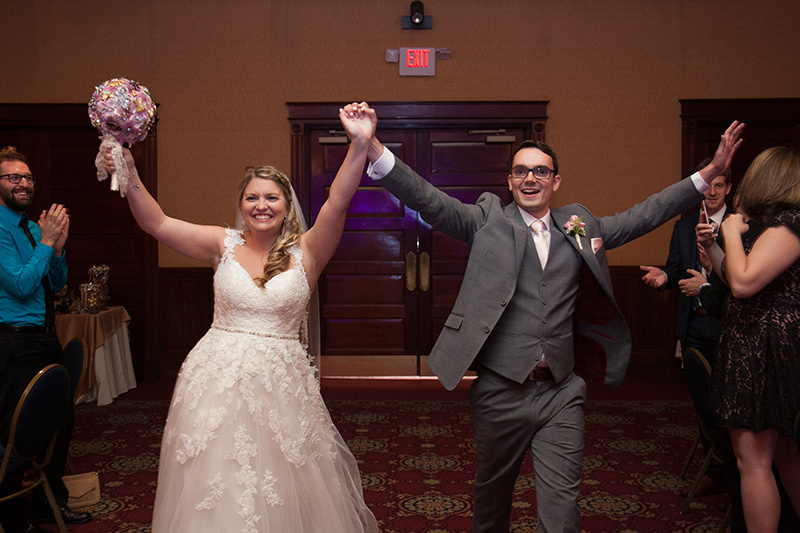 Bud and Alyssa first met at a Chilies restaurant in 2013 after initially meeting on line via “Chemistry.com”. 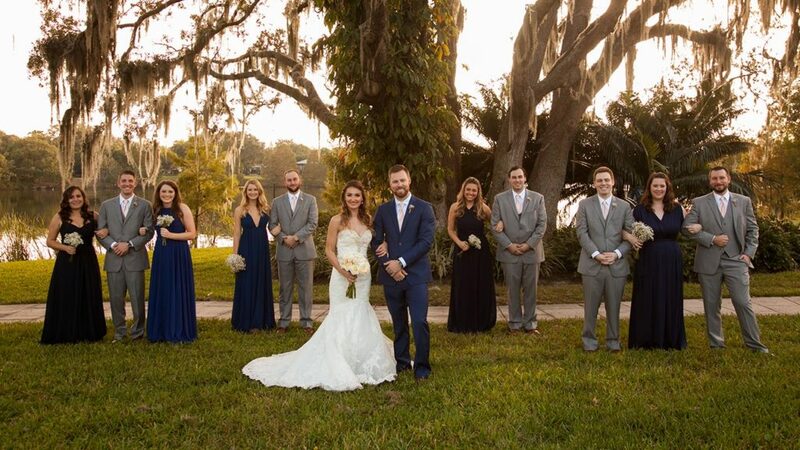 Clarence, AKA Bud, worked the night shift as an Orlando Police Officer and Alyssa, as she says,”being surrounded by engineers limited our dating scene so we both turned to online dating and it all turned out for the best!” Bud said that,” they talked for hours, about everything from work to zip lining, and unbeknownst to them, began laying the foundation of what would become a wonderful and lasting relationship.” Bud’s proposal began with an invitation to dinner and a movie, after which they headed for their favorite local spot, Cranes Roost. 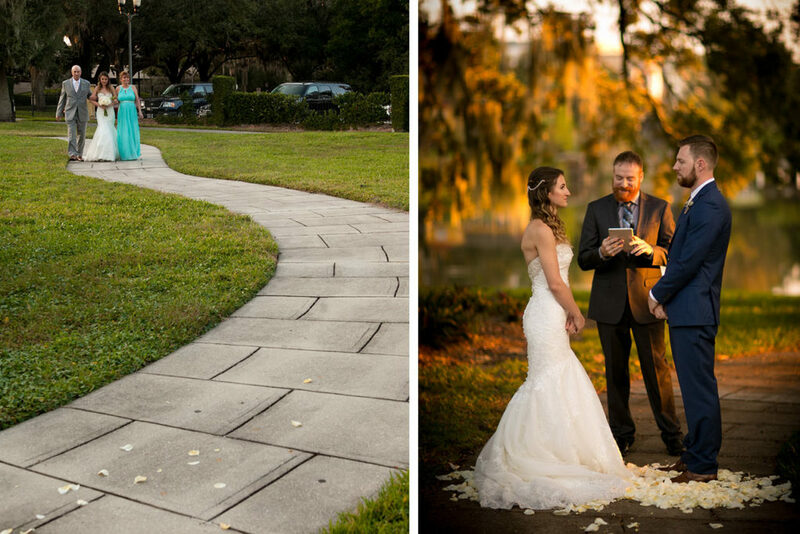 ” It’s where we first became officially boyfriend and girlfriend, and had our first kiss.” Bud even had a photographer there who, under the false pretense of “practicing” on them, proceeded to take their picture. 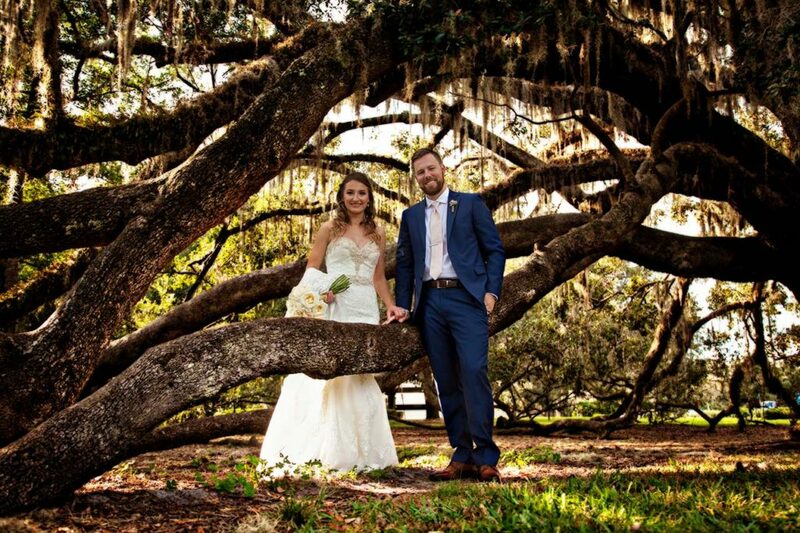 Alyssa went along and agreed to ” have some stranger take our photo” Bud, after the first photo, got down on his knee and proposed! 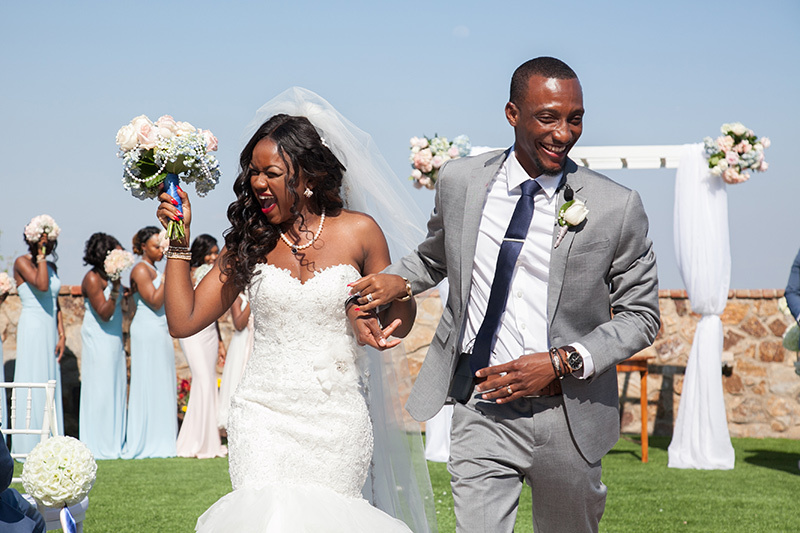 She said YES and now here they are, happily married newlyweds in 2016. 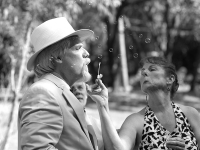 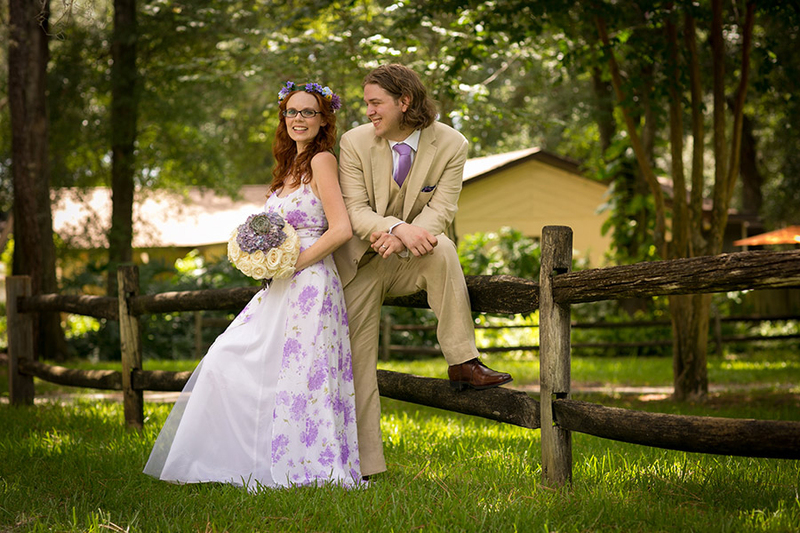 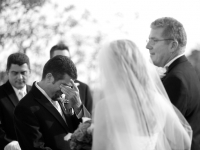 August 6 th was the big day and Bud and Alyssa agreed that they wanted an outdoor themed wedding, without the outdoors…” Too hot for a Florida August outdoor wedding” said Alyssa. 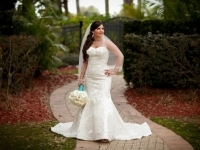 They chose the beautiful Plantation in Venice, a spot on the East coast close to where Alyssa grew up. 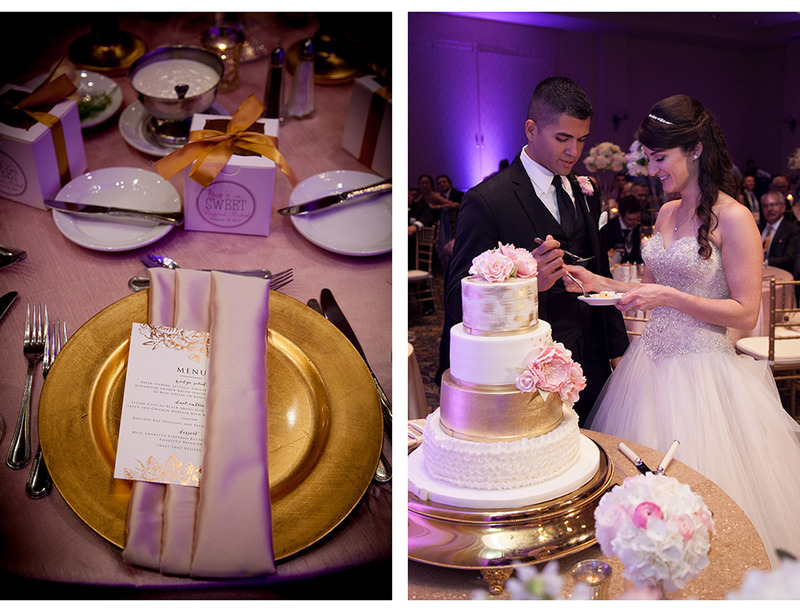 One thing Alyssa knew for certain was that she wanted a cookie table at the reception. 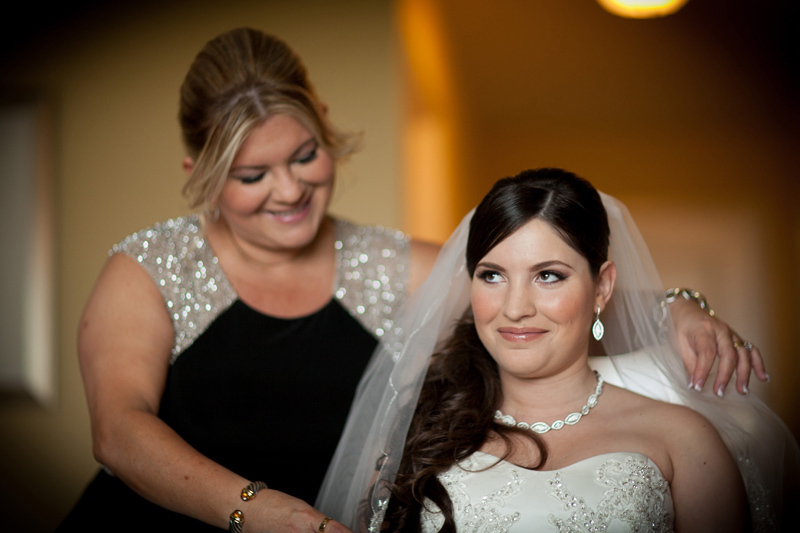 ” I was raised by my Mom and always grew up close to her, she was the one there through thick or thin. 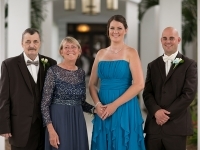 My Dad lived in NY so when I visited him he would make sure we had our time together by waking me up in the middle of the night and we would have Oreos and milk” How super sweet..pun intended! 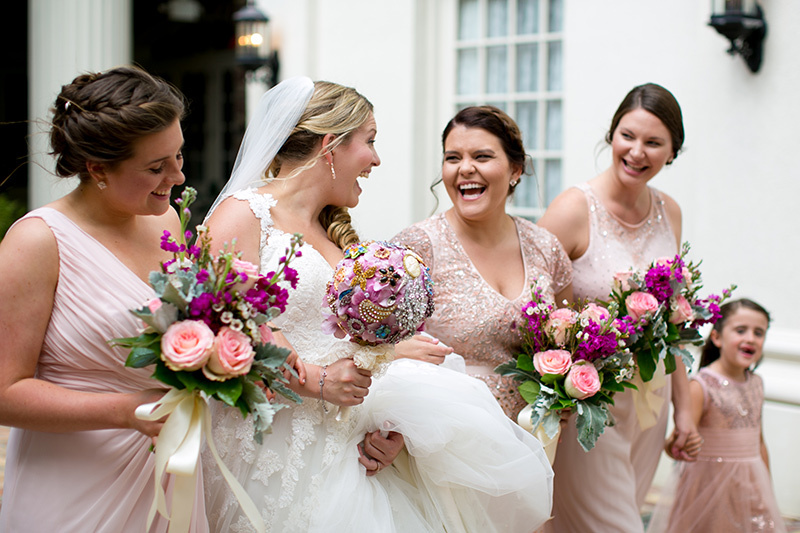 Everything came together beautifully on their wedding day in large part due to Alyssa being a very hands on and involved bride. 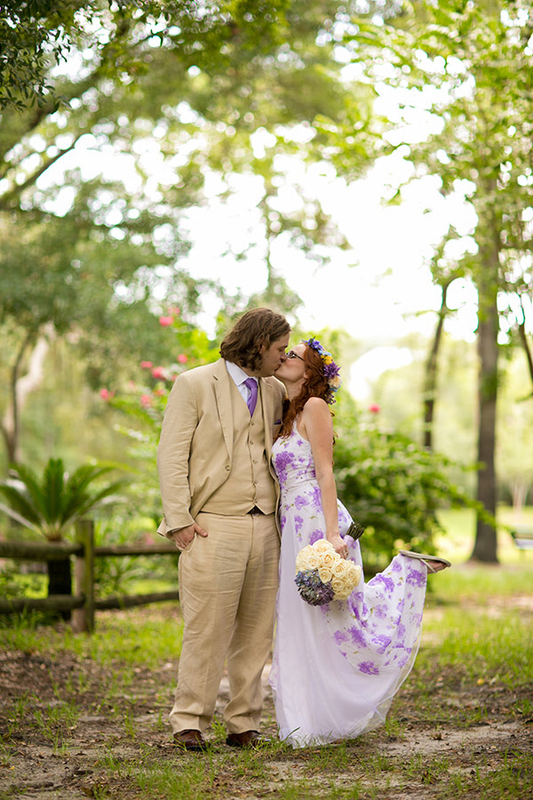 “Everything was set up and made by myself or one of my amazing bridesmaids- from the homemade jams and the signs to the center pieces and the kids table!” Apart from a tiny thunderstorm that blew through as the ceremony was about to start the wedding was a success…lively & full of dancing and laughter, which ended with an exciting ecofetti departure. 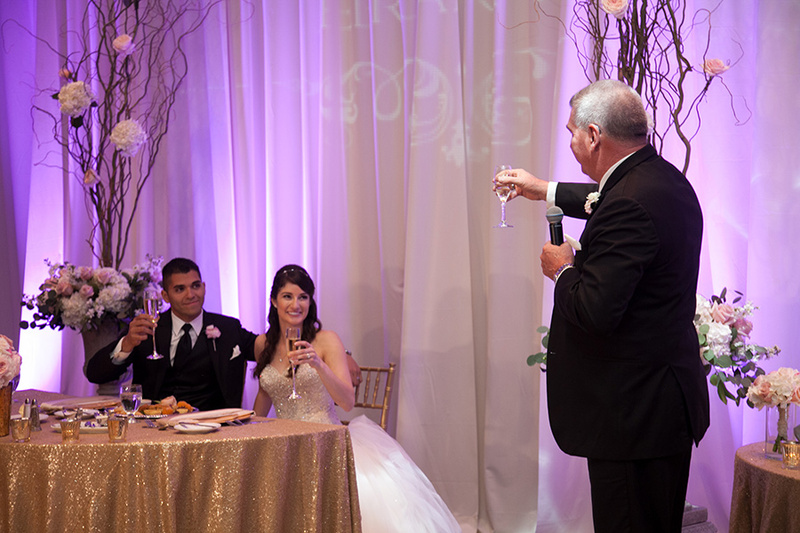 Alyssa and Bud Stan and I wish you two lovebirds a long, safe and prosperous life together and want to thank you for inviting S & S to be a part of such a momentous occasion in your lives! 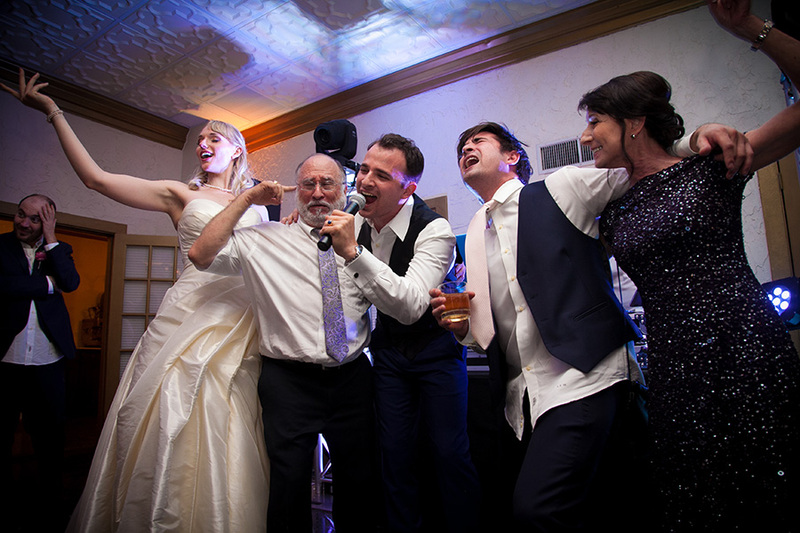 After 7 years of dating Chris unexpectedly proposed to Pam in June of 2015 at a Styx concert! 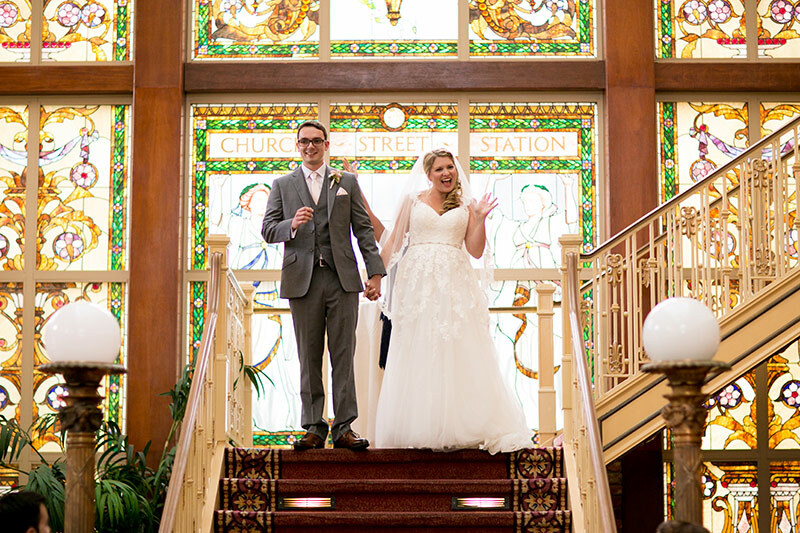 “We had seen them twice before and were super excited to be able to go again. 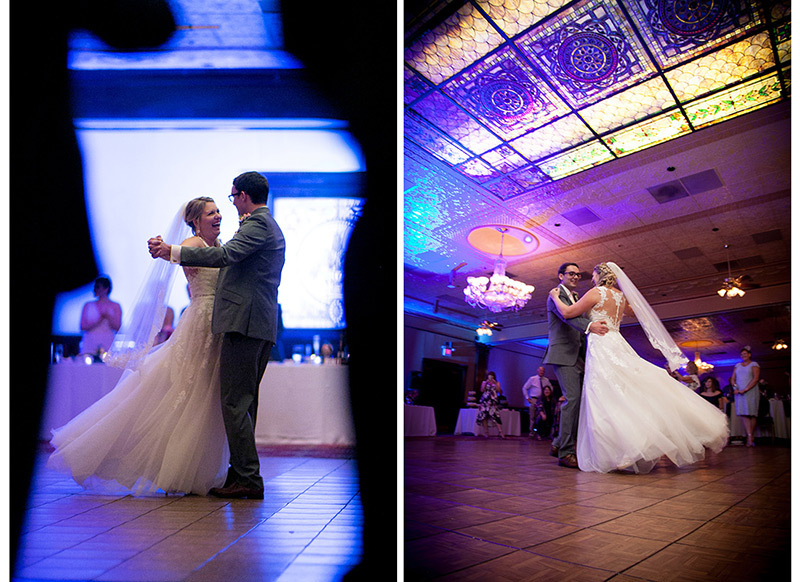 The show was incredible and we had a great hotel which we ended up at after the concert. 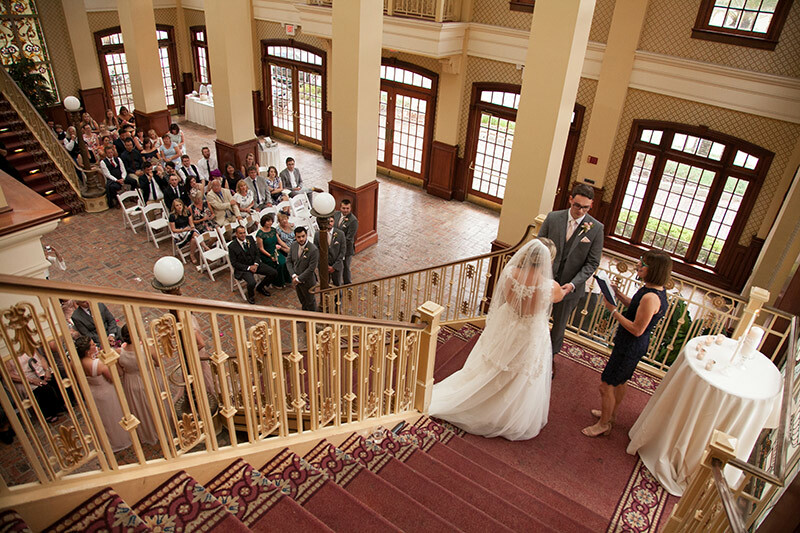 Our room had a view overlooking a river and he suggested we take a walk along the boardwalk. 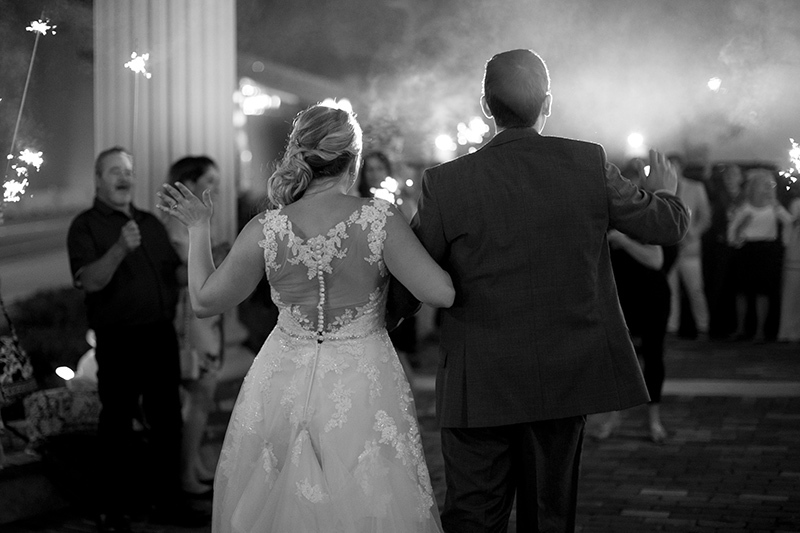 I was a little curious since it was an odd time of night to go (around 11:30pm I think) but it was beautiful. 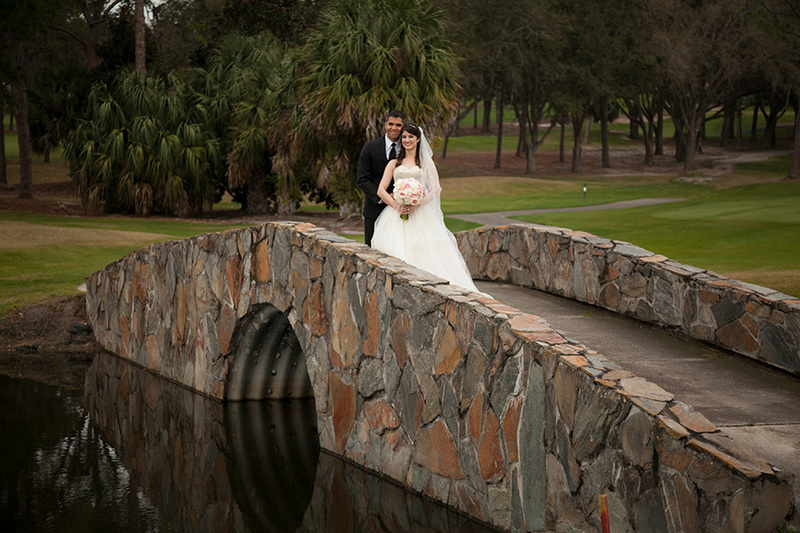 We walked onto the bridge over the river and joked about how many spiders there were (I am afraid of them of course). 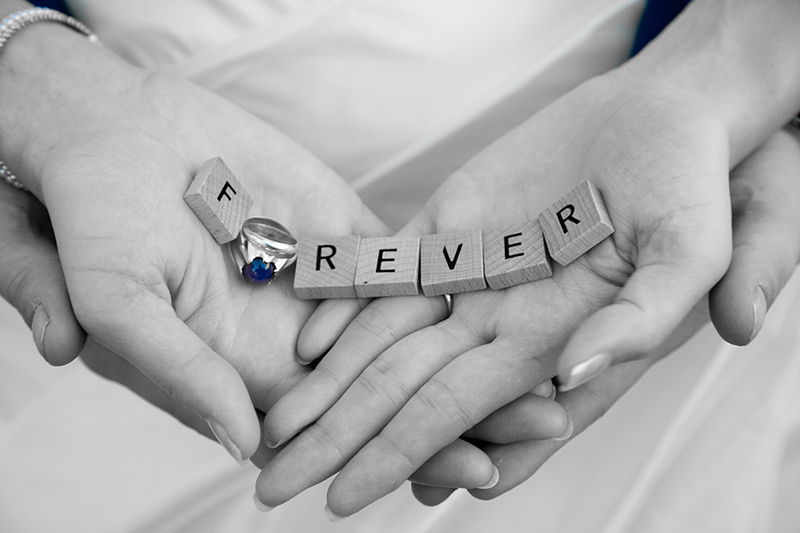 He told me how much he loved me and promised he always would then asked if I would do the same and when I said yes he pulled out the ring. 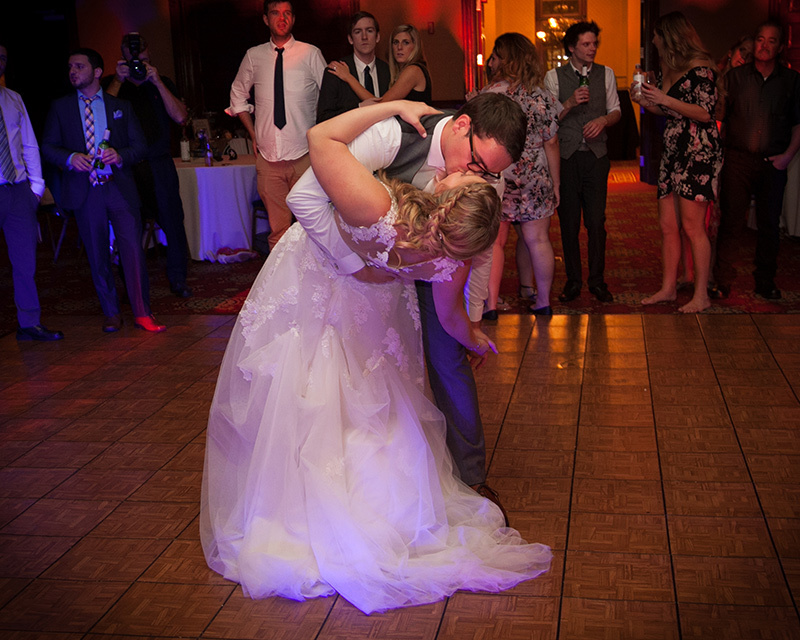 I promptly dropped the water bottle that I was holding onto his foot, I was so surprised! 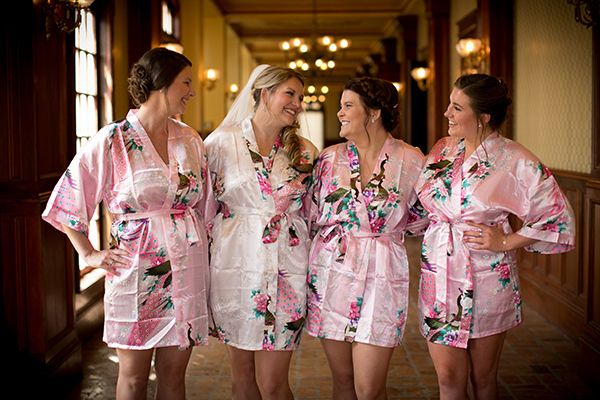 But we laughed and I practically screamed yes and the rest, as they say, is history.” Pam’s Mother had purchased a dress for her to wear at her prom many years ago at the Goodwill store in her high school home town of Lockhart , for $14.00. 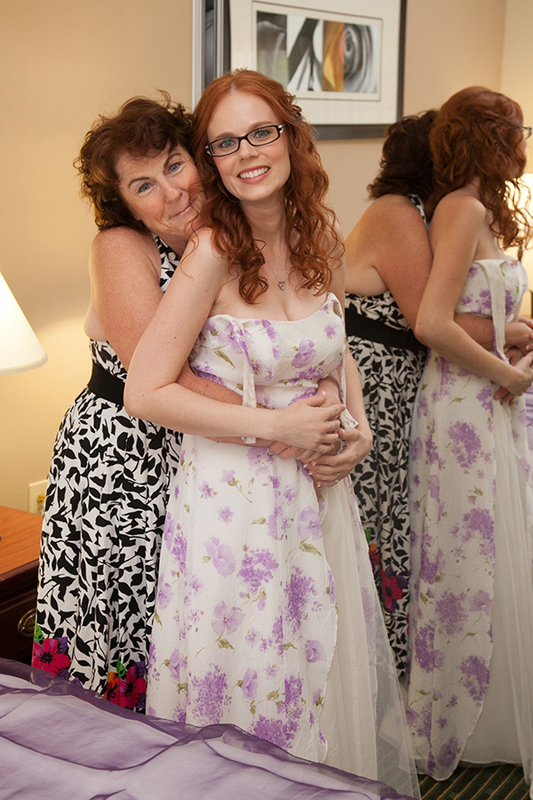 She ended up not being able to go to her Senior Prom and the dress stayed with her as she moved and relocated 3 times….she loved her dress too much to part with. 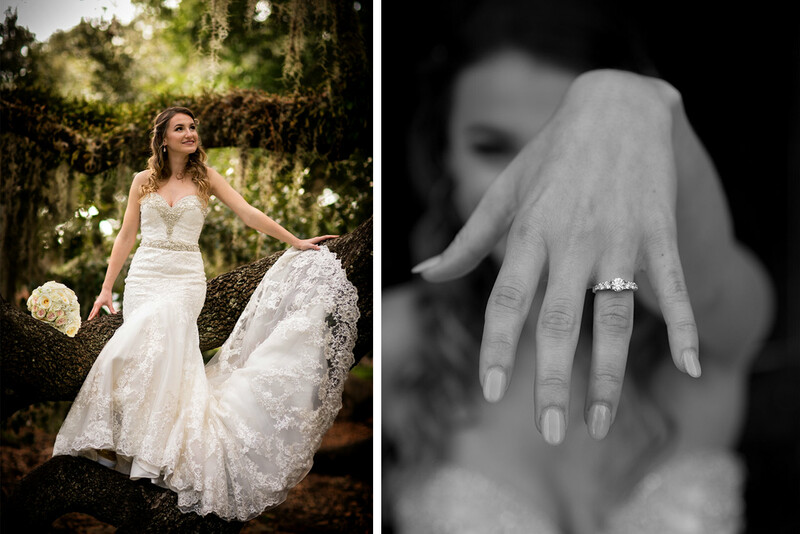 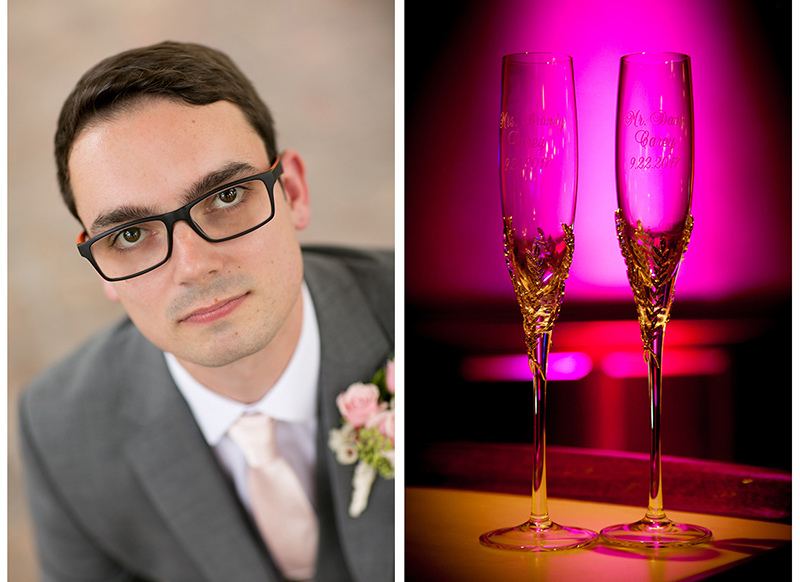 No occasion seemed worthy of it, until Chris proposed…”After Christopher and I got engaged I had no doubt that I would wear my long lost dress, it was perfect. 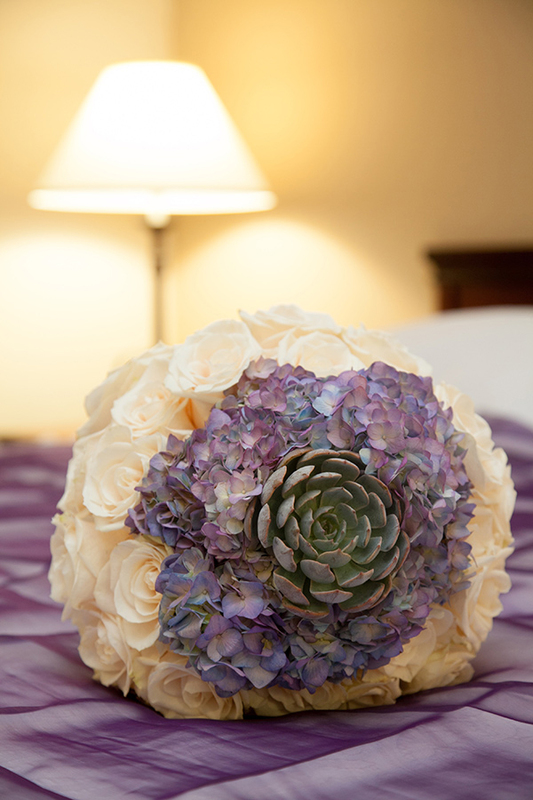 The theme, flowers and decor all fell into place after that! 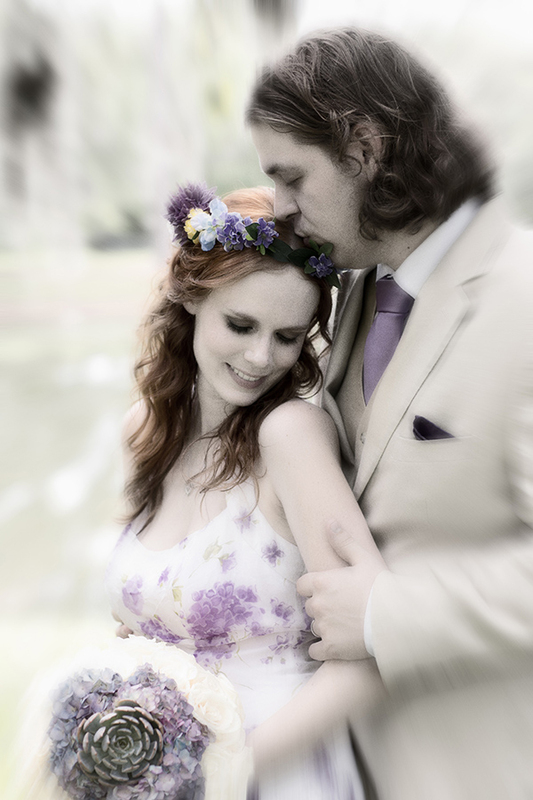 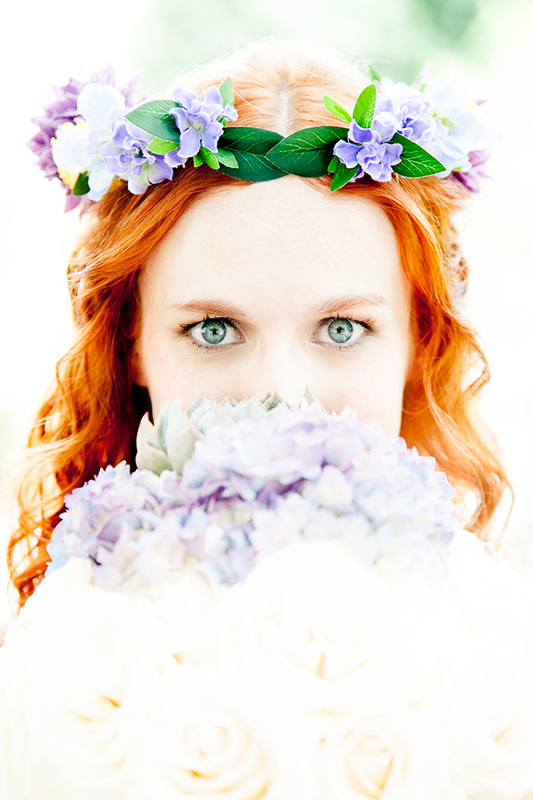 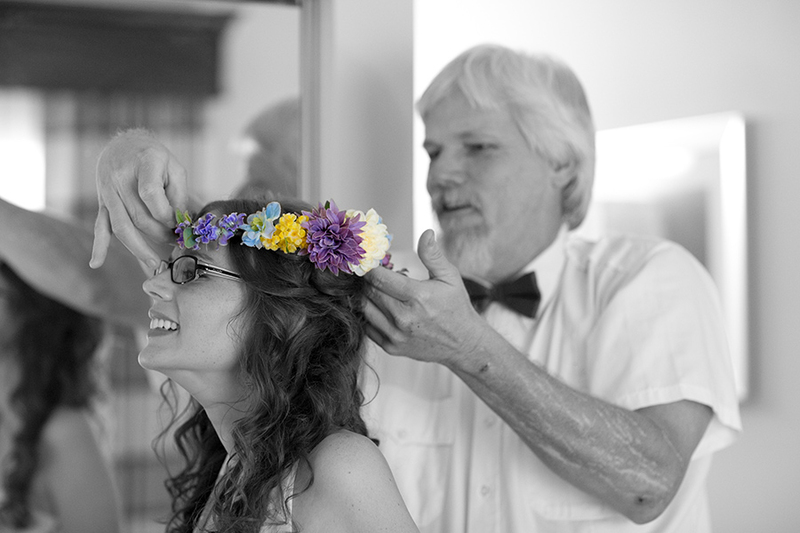 ” Stan and I loved Pam’s entire look…from her dress to her beautiful summer flowers in her hair, the inspiration coming from her childhood…”My mother wore a flower crown for her wedding and I remembered how much I loved playing with it when I was younger. 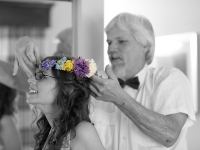 I thought about buying a crown online but the cost was way higher than I expected and the colors were good but not perfect. 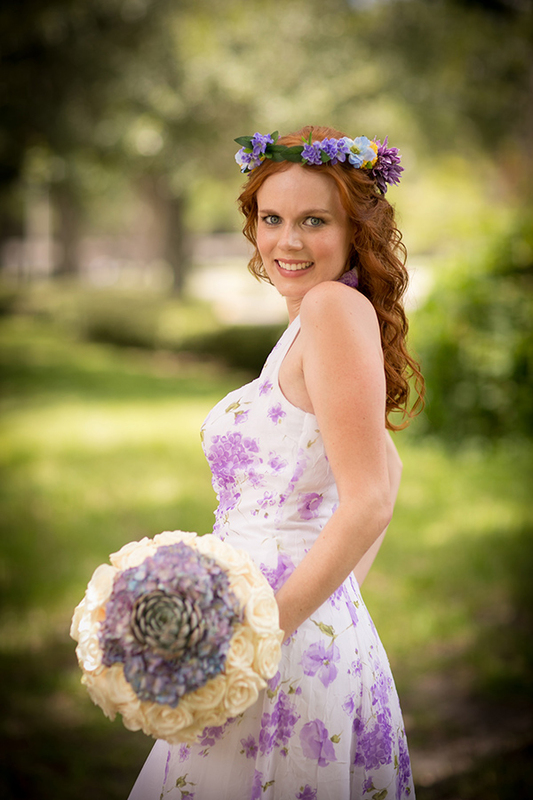 It took many trips to a handful of craft stores but I was able to find the flowers that I really wanted and after reading some DIY articles I decided to make my own crown. 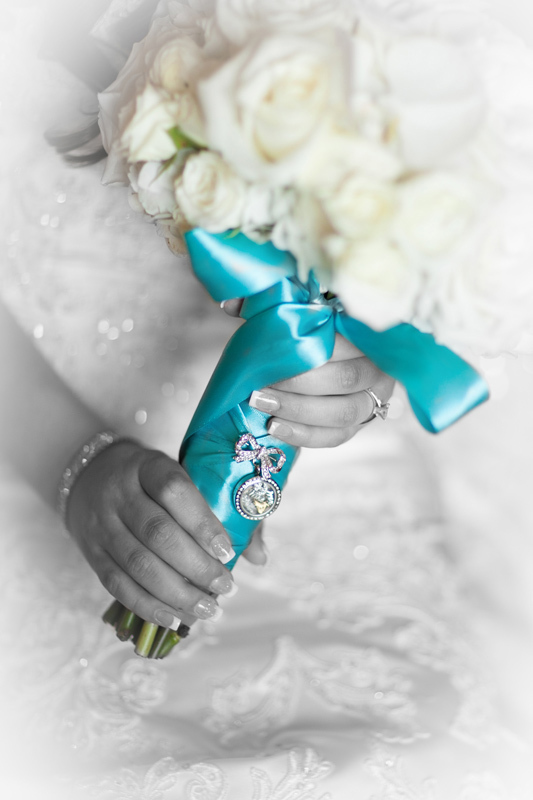 All in all it cost around $35 (for the stuff I actually used) and took about 18 total hours.” The guest list for their intimate July 31st wedding was short..her parents, his parents , his sister and boyfriend and a favorite Aunt…”Our parents, my aunt, and Christopher’s sister and her boyfriend have truly been our support system and very best of friends over the last 5 years which made them the most important people to have with us on our wedding day.” The ceremony was in a beautiful park tucked away in a Longwood neighborhood, with dinner at Lake Mary’s FishBones.Congratulations to a sweet, unique and beautiful couple!! 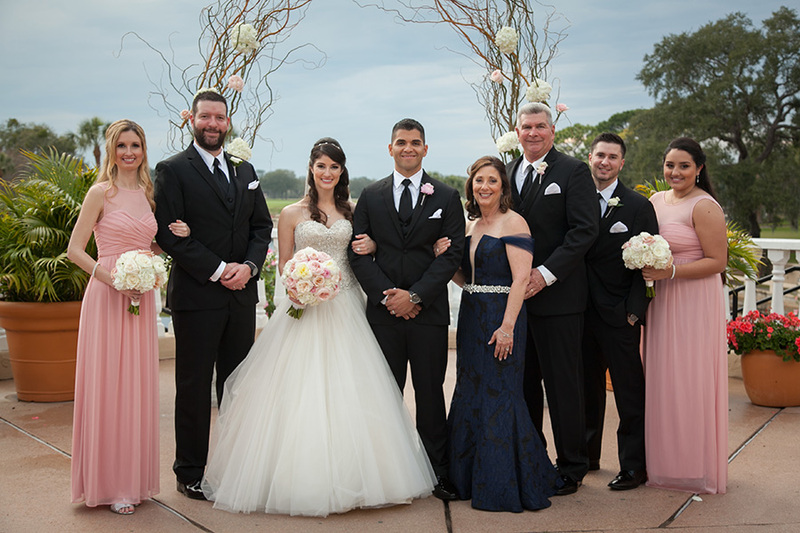 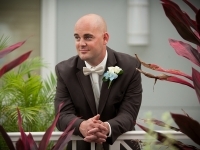 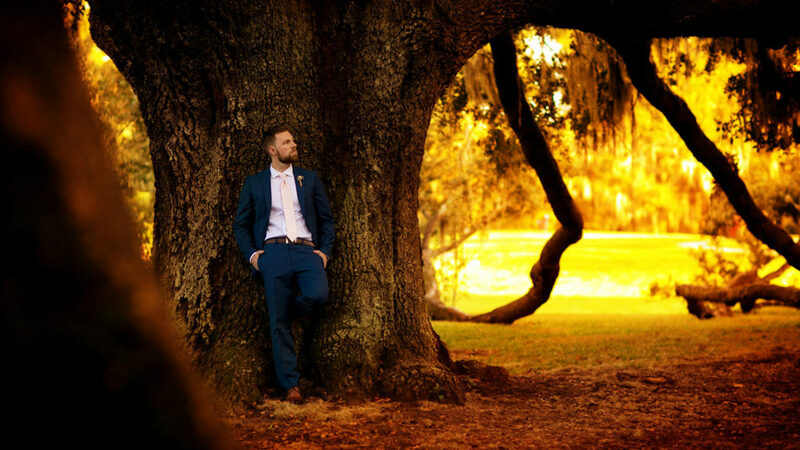 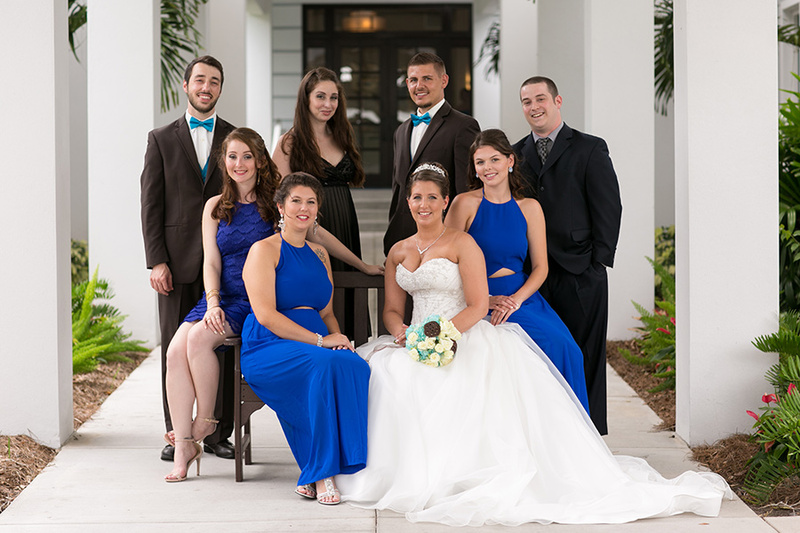 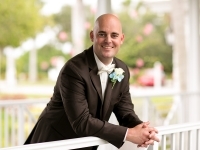 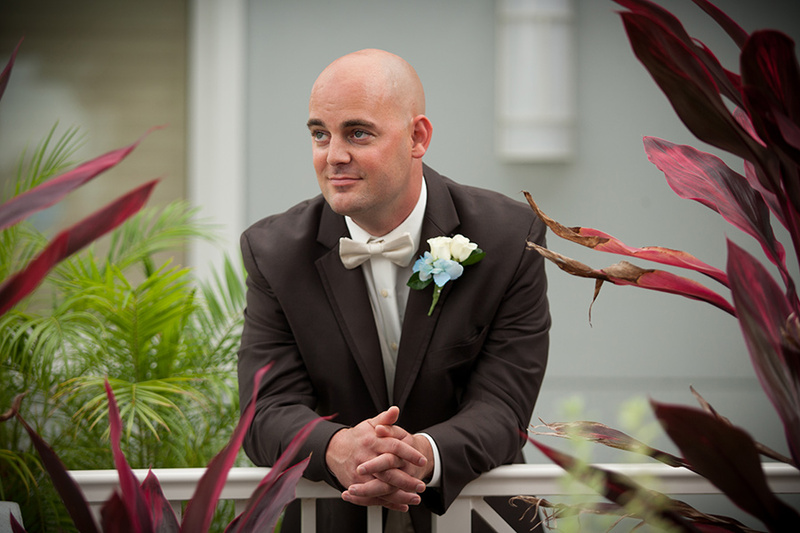 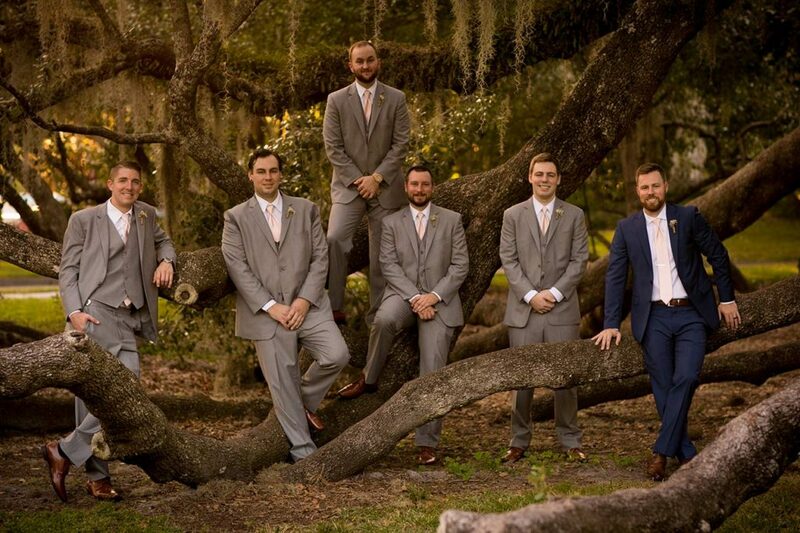 Karla & Steven Bayes chose one of Orlando’s premier wedding locations for their beautiful March wedding…yes we are late posting this but better late than never! 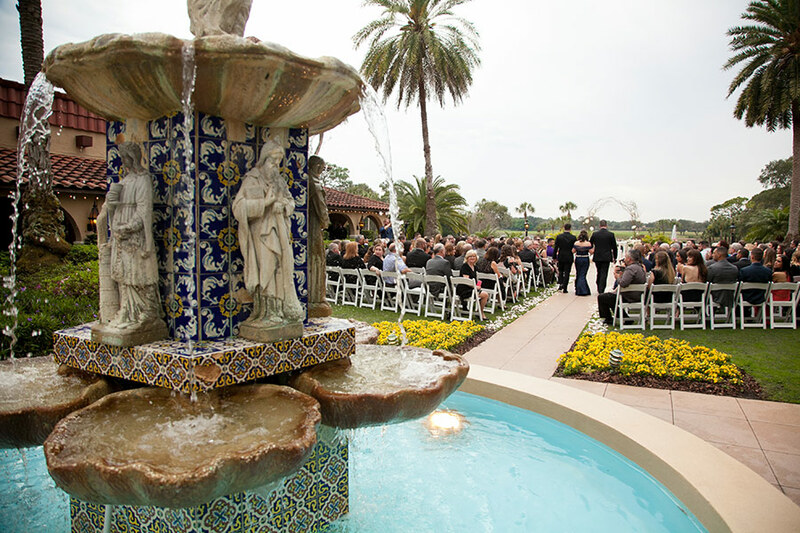 Orlando’s ChampionsGate Resort is a gorgeous Central Florida location perfectly suited to hosting Central Florida weddings. 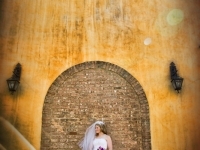 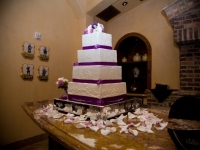 This venue is beautifully decorated, especially the courtyard and ballrooms. 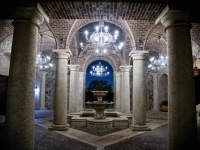 The accommodations are luxurious , the cuisine exceptional and the service superb. 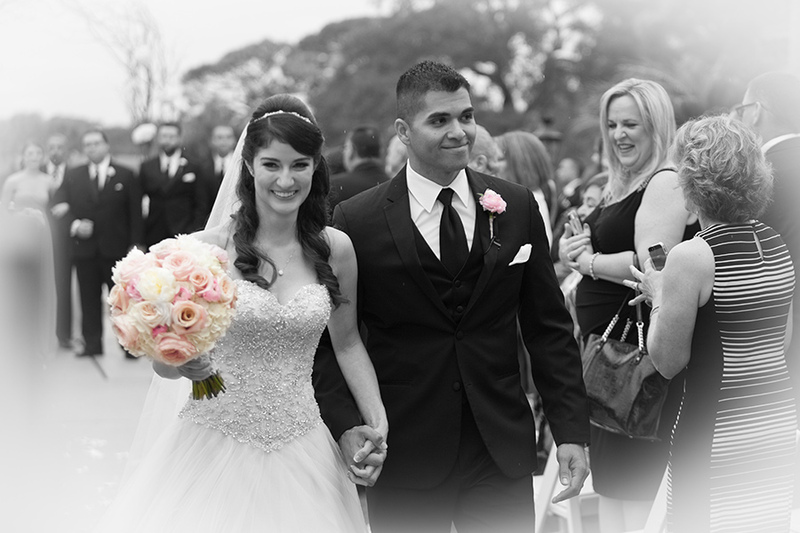 S & S Photography enjoyed working with a talented , organized and detail oriented co-ordinator and her team, Xiomarra Sanchez, owner of A Nite To Remember Events. 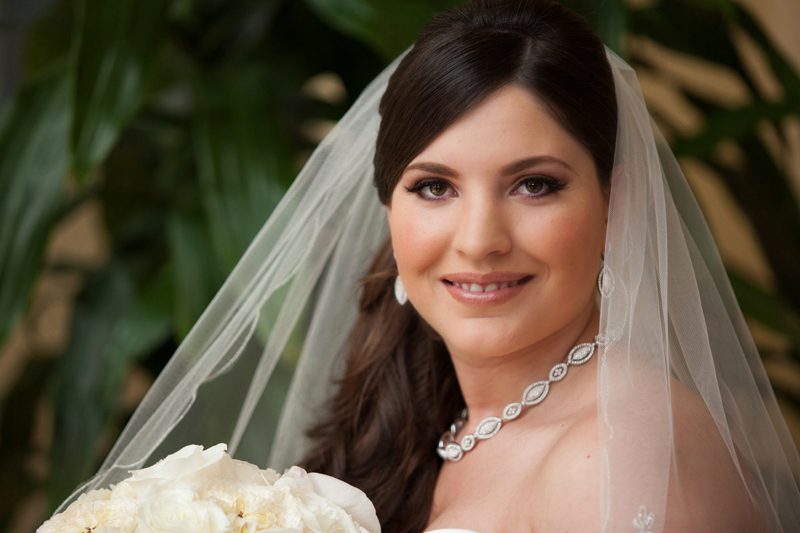 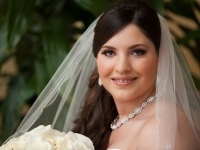 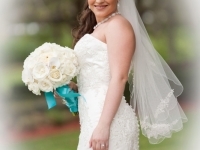 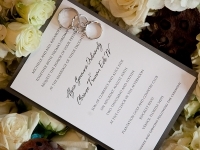 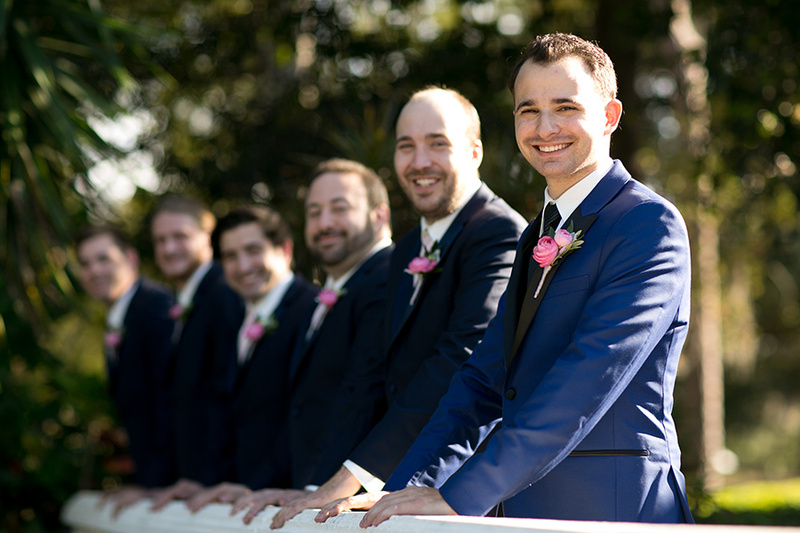 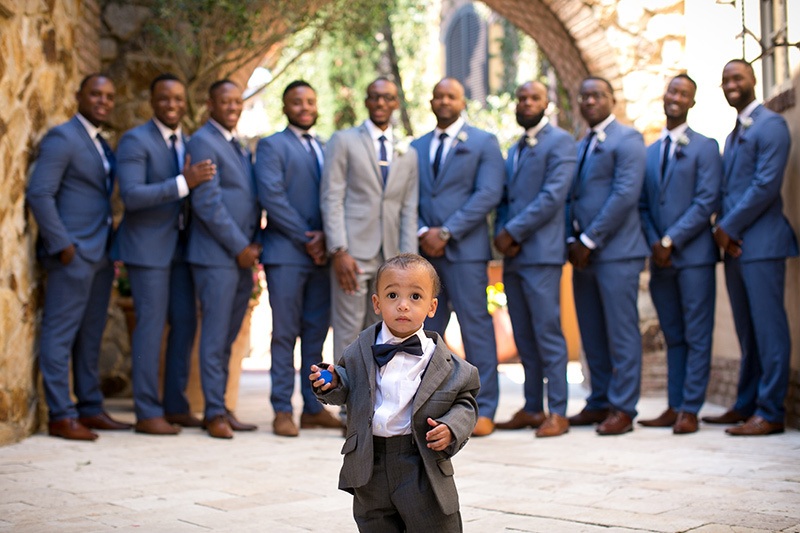 ( Niteevents.com) Xiomarra and her team ensured that every detail, every desire, every element and every aspect of the wedding day was meticulously addressed , handled and taken care of immediately,for the bride and groom. 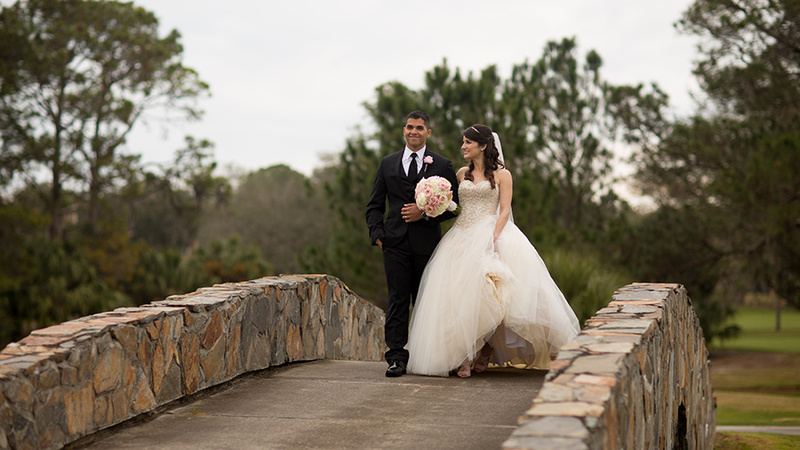 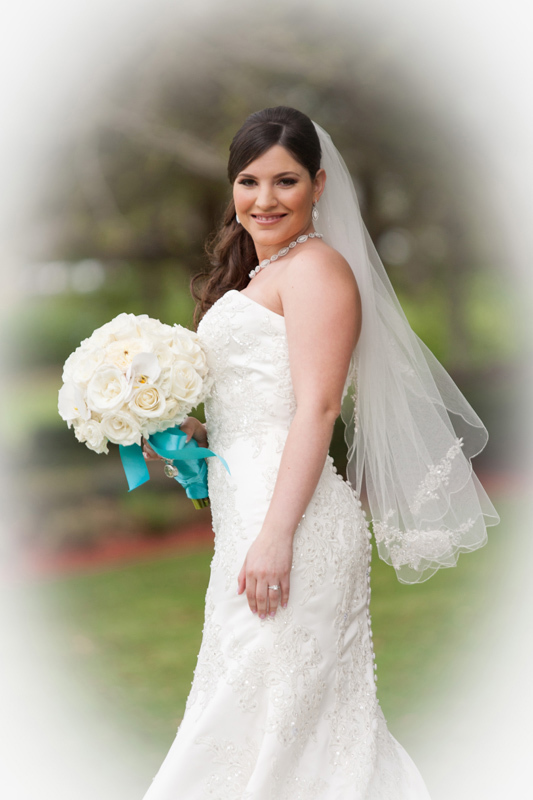 When I asked Xiomarra why Steven and Karla chose S & S Photography for their Central Florida wedding photography needs she answered…”S & S was a no brainer when picking a wedding photographer for Karla and Steven. 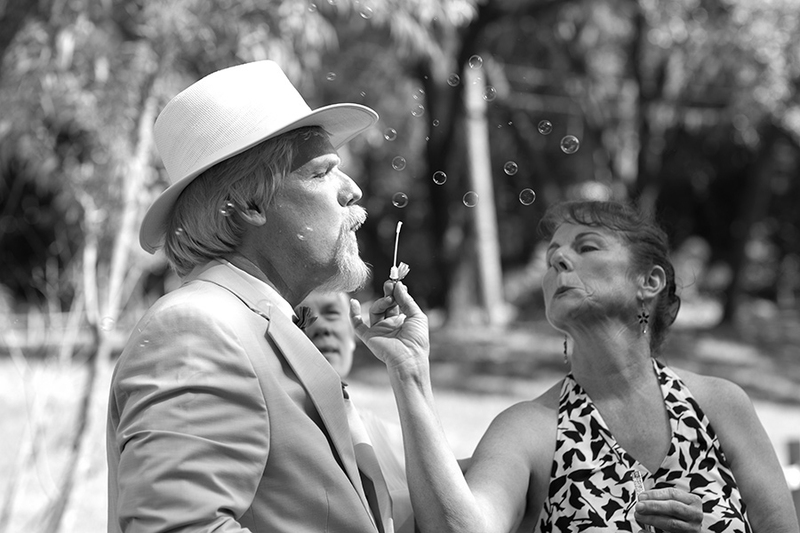 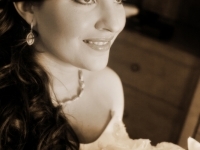 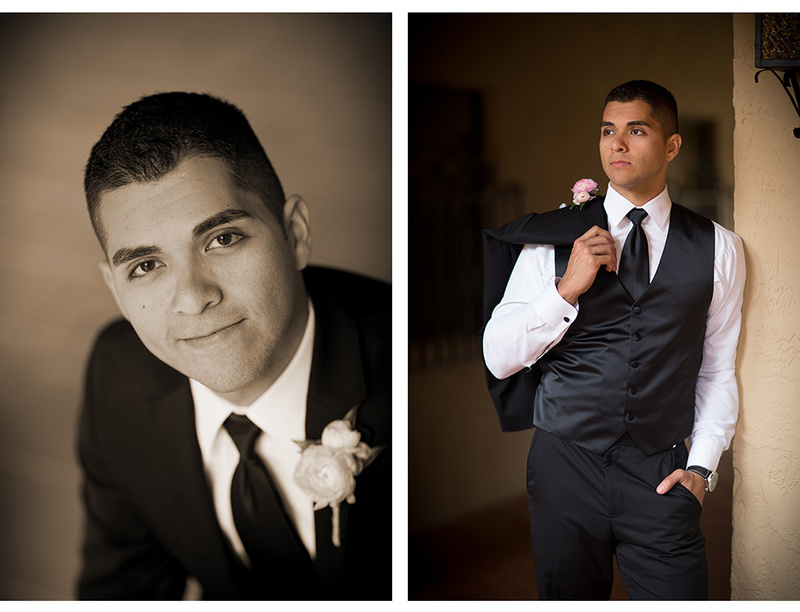 Charlene and Stan were the photographers for Karla’s Mothers wedding a few years back and they LOVED them! 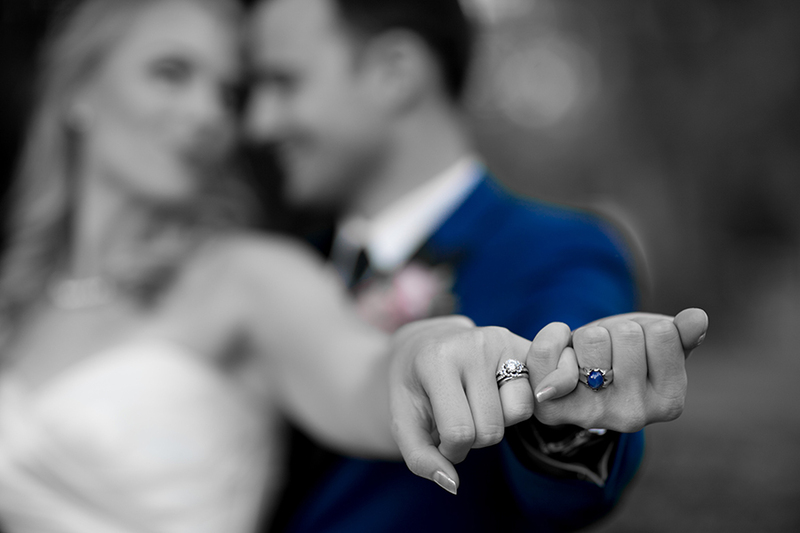 Working with S & S is EASY and a PLEASURE. 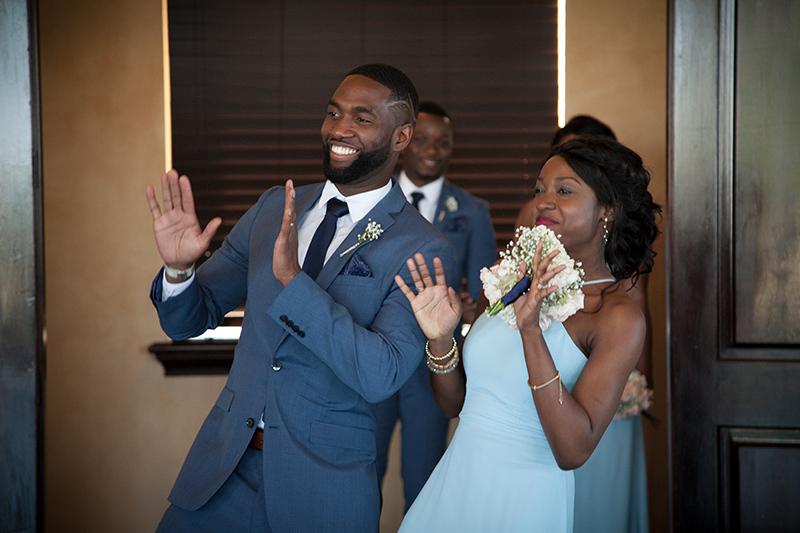 I LOVE Charlene’s energy. 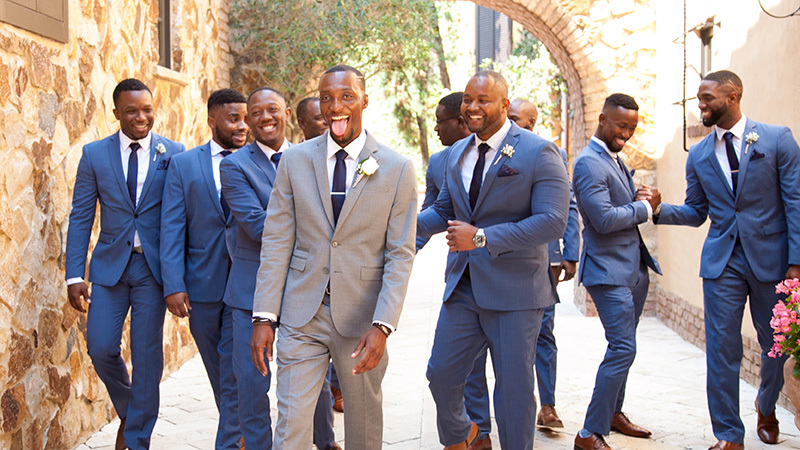 The pictures speak for themselves. 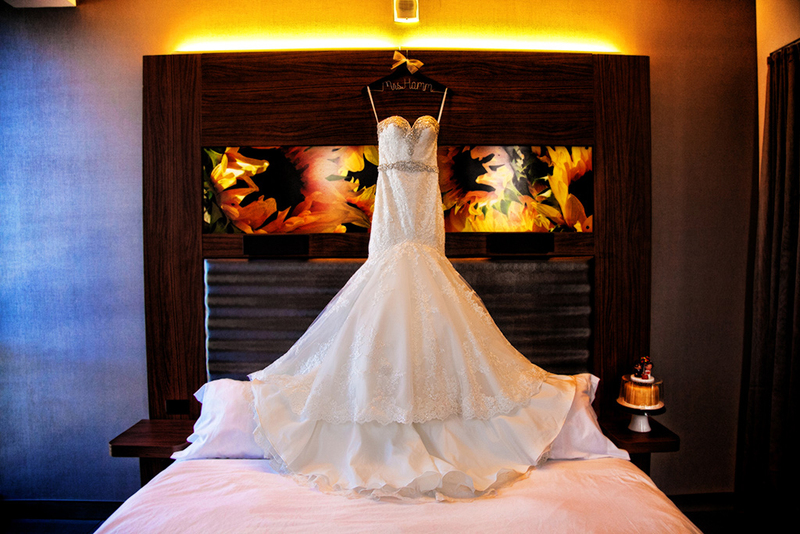 EXCELLENT photography and an EXCELLENT company”. 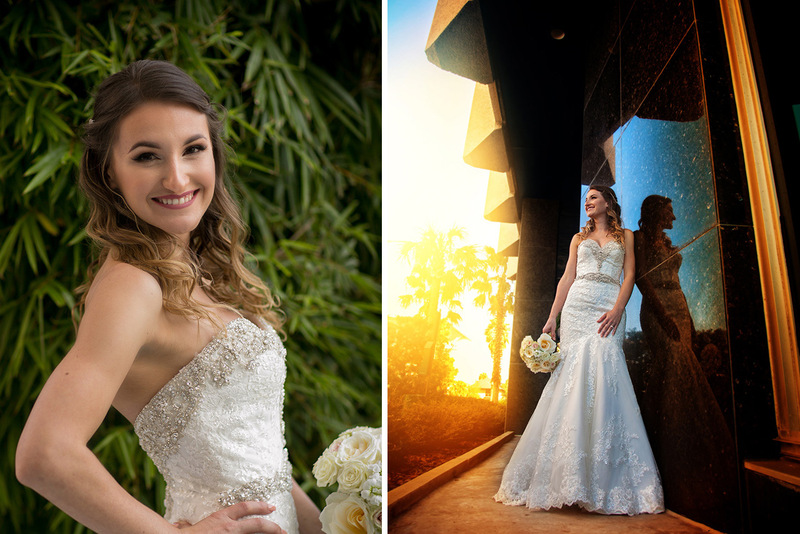 We always look forward to working with A Nite To Remember Events and we look forward to the change in photography needs of Karla and Steven…from being their wedding photographers to, one day, becoming their FAMILY photographers! 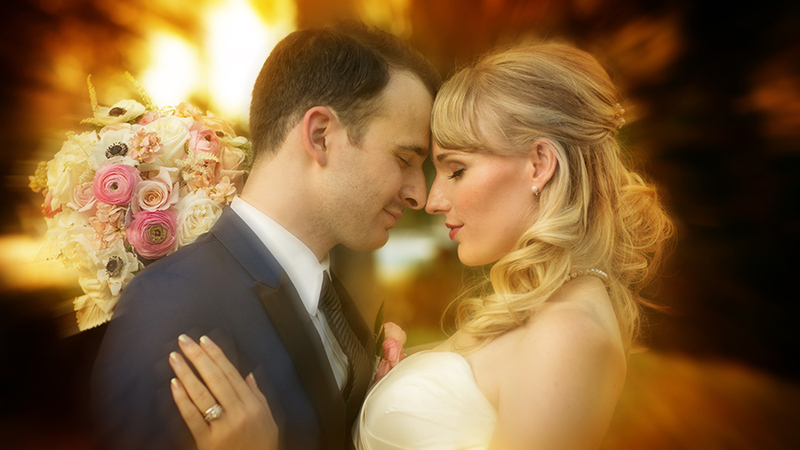 It was so wonderful to be the wedding photographers for a couple that truly compliments each other and are so in love with each other! 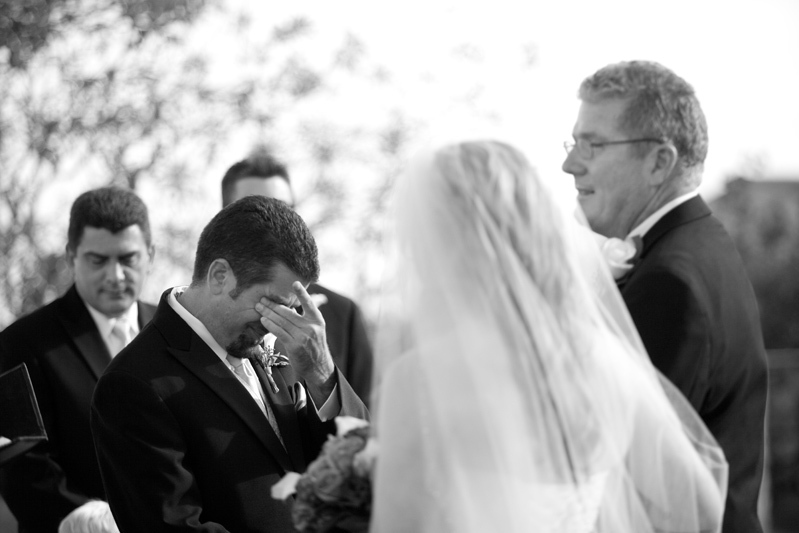 Heather and Todd’s Bella Collina wedding was absolutely wonderful and touching beyond words, just perfect. 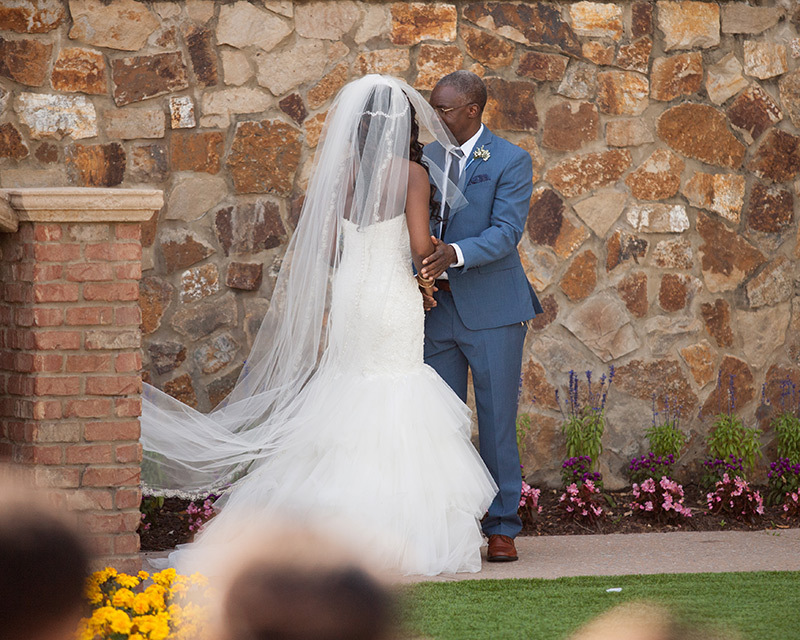 Their outdoor traditional wedding ceremony on the lawn at Bella Collina was romantic and emotional…watching Todd try to stay composed while Heather walked towards him on her Dad’s arm had me tearing up! 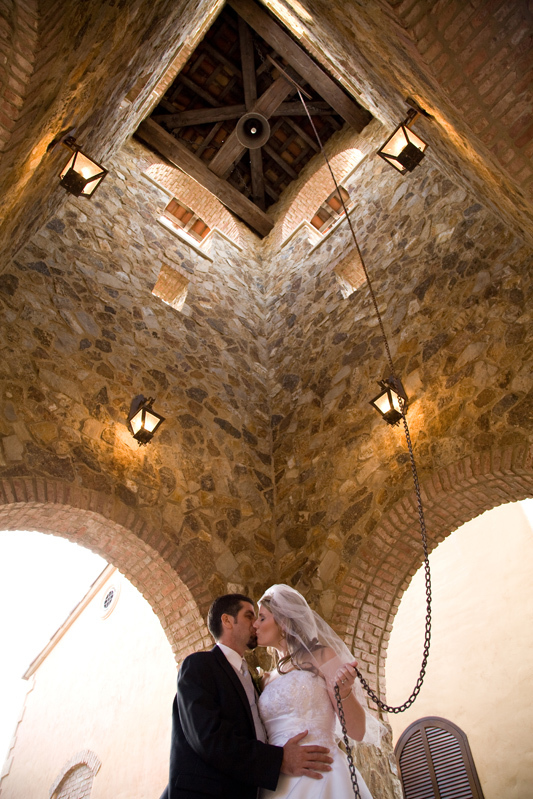 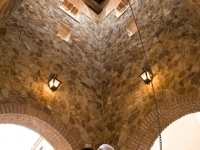 After the ceremony we had so much fun taking their wedding pictures…under the Bell Tower, down by the bridge…we’re always able to find great locations for wedding pictures at the Tuscan themed Bella Collina. 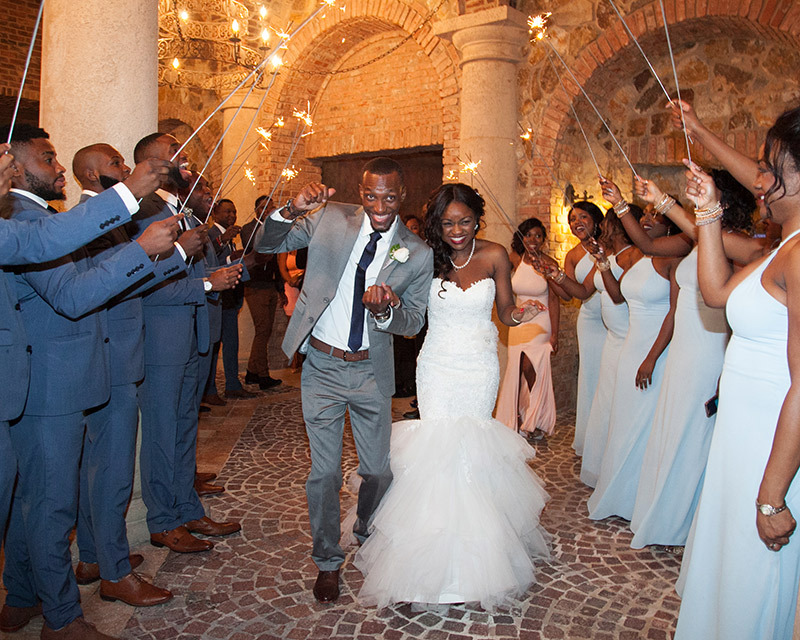 The evening was filled with joy and laughter and everyone there had an amazing time celebrating the union of two amazing people!